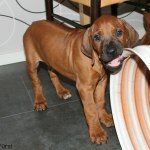 Here we are... this day came so fast! 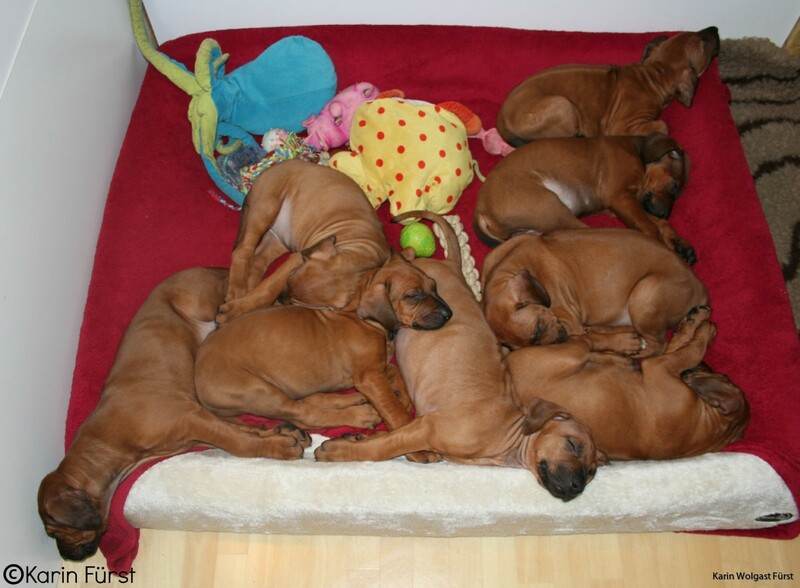 The final day all together before the puppies start to move to their new families tomorrow. 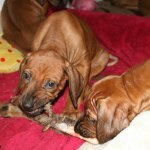 We have had a busy day, I think the puppies know that it is their last day with me and in my home, because they have been wild! 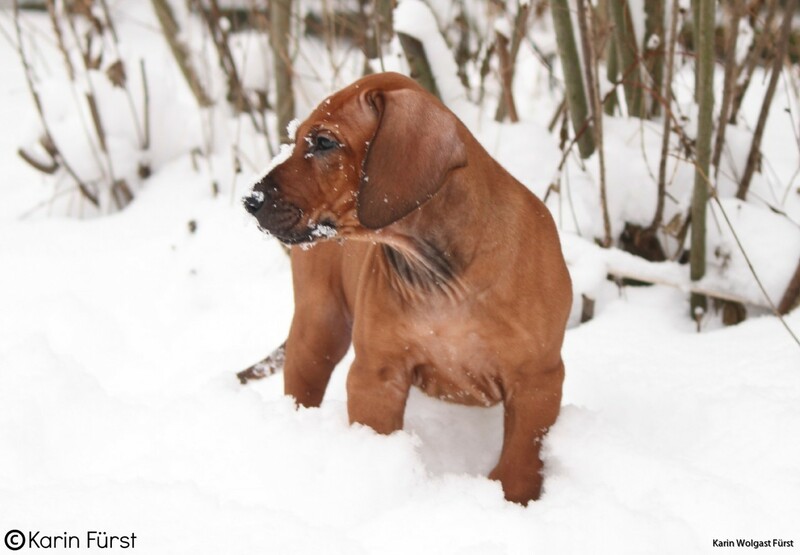 We started the day playing in all the snow that came yesterday. 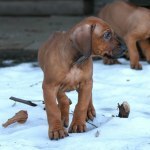 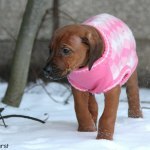 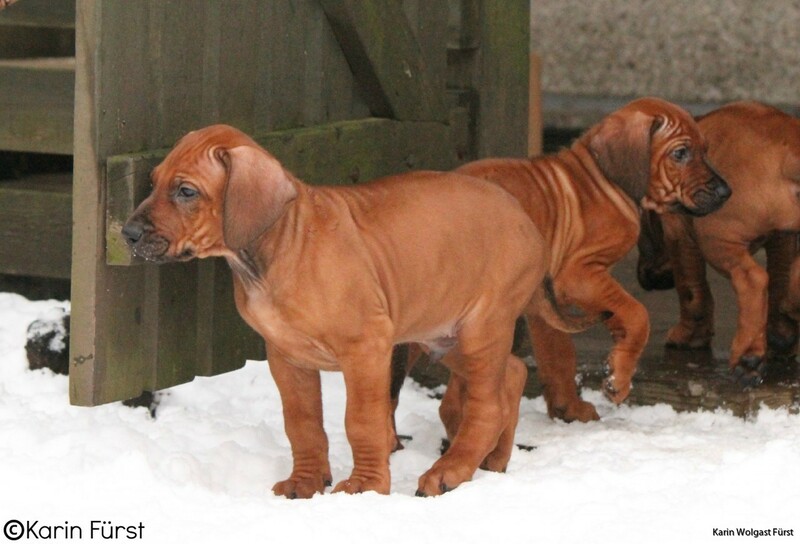 The puppies don't mind at all being out in the cold, more the opposite! 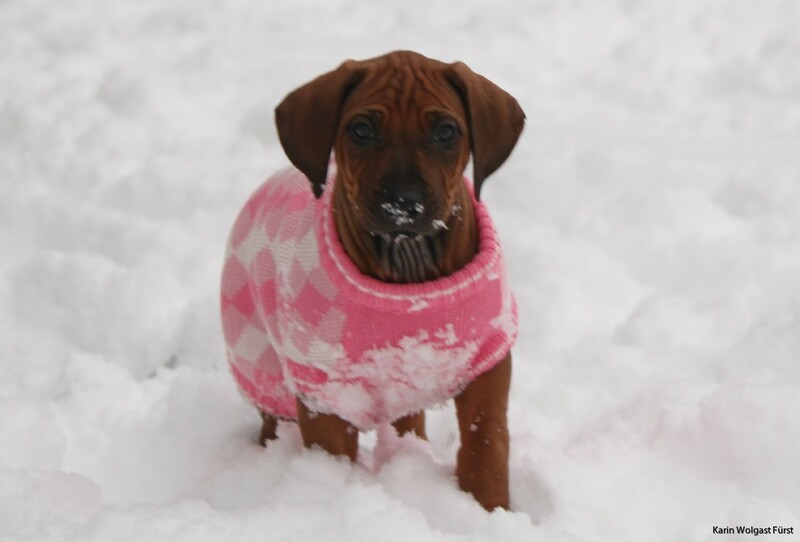 At least when it is not colder than -5 degrees. 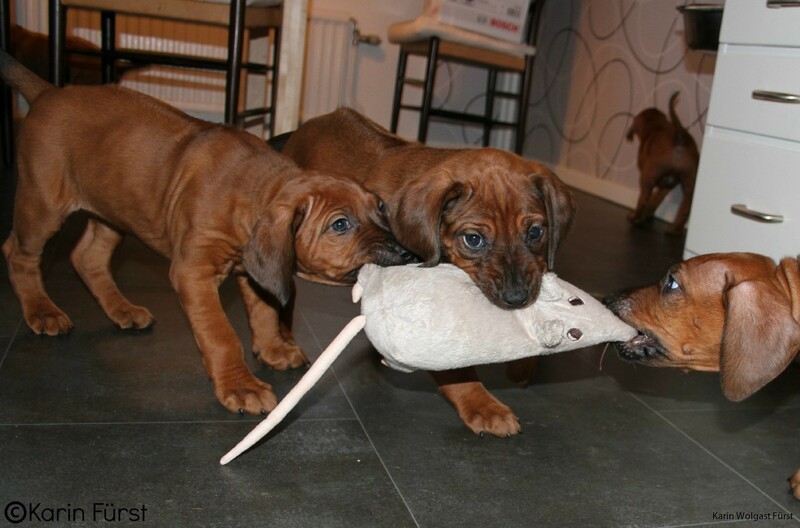 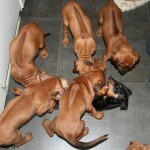 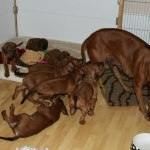 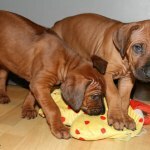 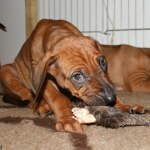 After that it was time for a nap before another playtime but now in the kitchen, and again puppies going wild! 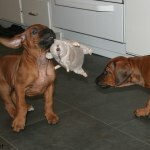 What can I say, at least they are having fun! 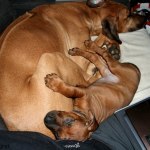 I hadn't planned to stack them again but since they were all in the kitchen I just thought what the hell, and I am glad I did. 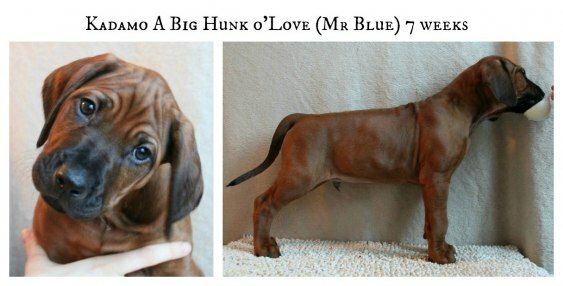 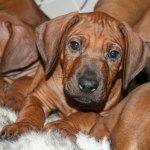 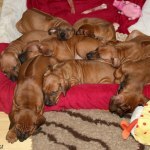 I think all the puppies look so great, I am very proud of each and everyone of them. 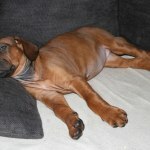 After this and some food the puppies finally fell a sleep again and I got to walk the big dogs. 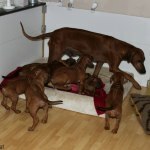 But then the evening has been crazy again! 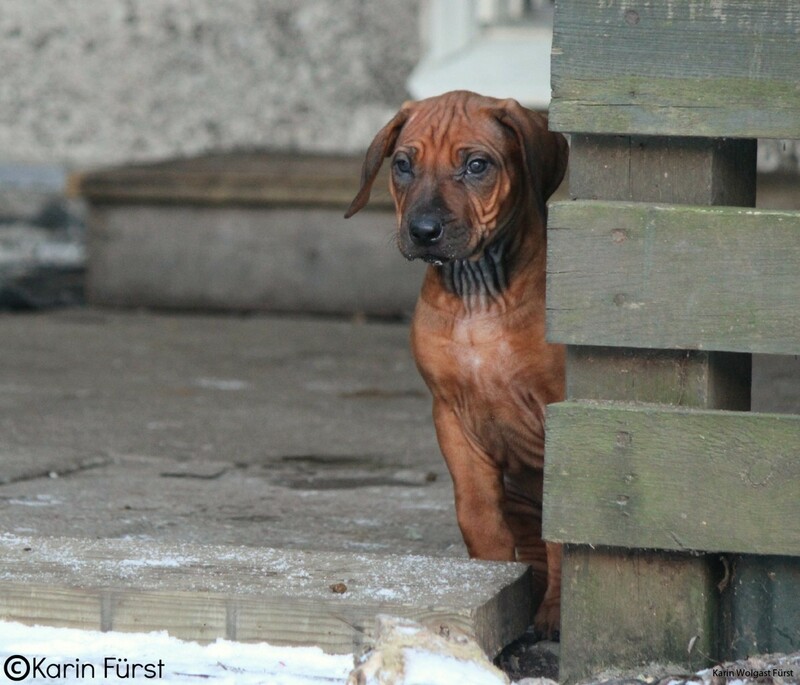 Playing outside, inside, barking, screaming, sleeping and it all starts over again! 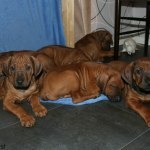 I will be a bit sad to see them go tomorrow, but since Mira is staying I know I will get busy anyway! 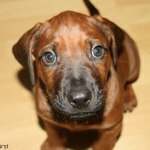 And also I have a puppy to kiss and cuddle! 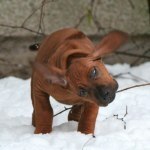 So I think I will survive. 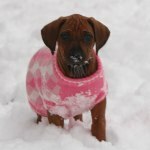 Below are the pictures and video from today! 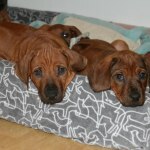 Today it was time for the puppies visit to the vet and first carride. 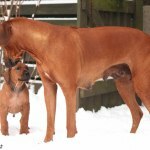 Louise who is the owner of SEVCH Kadamo Rare As Ryley "Thea" from the C-litter, came to help me out. 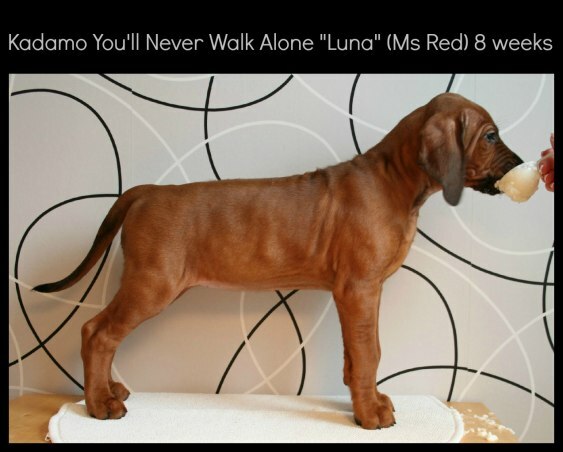 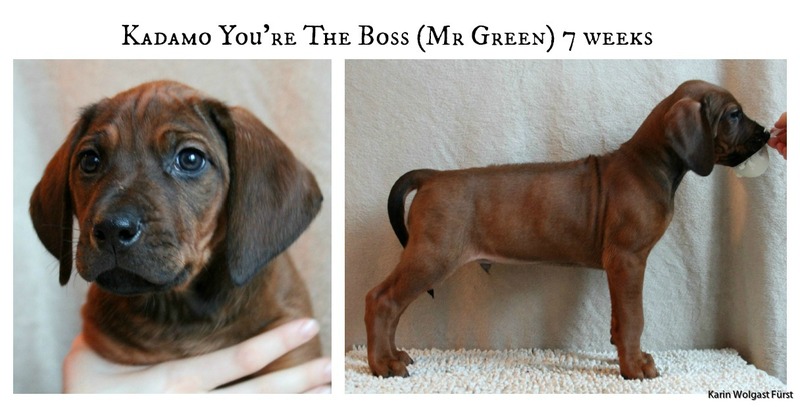 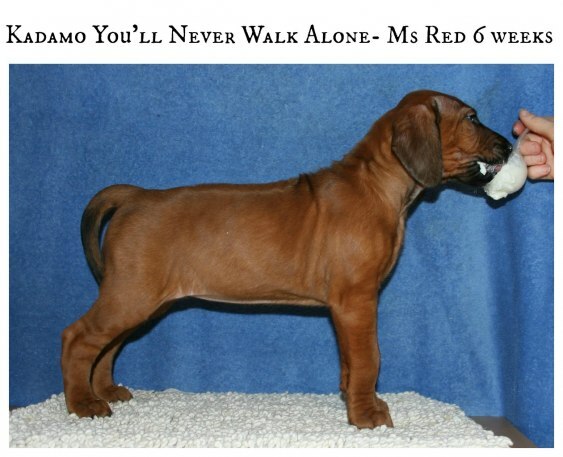 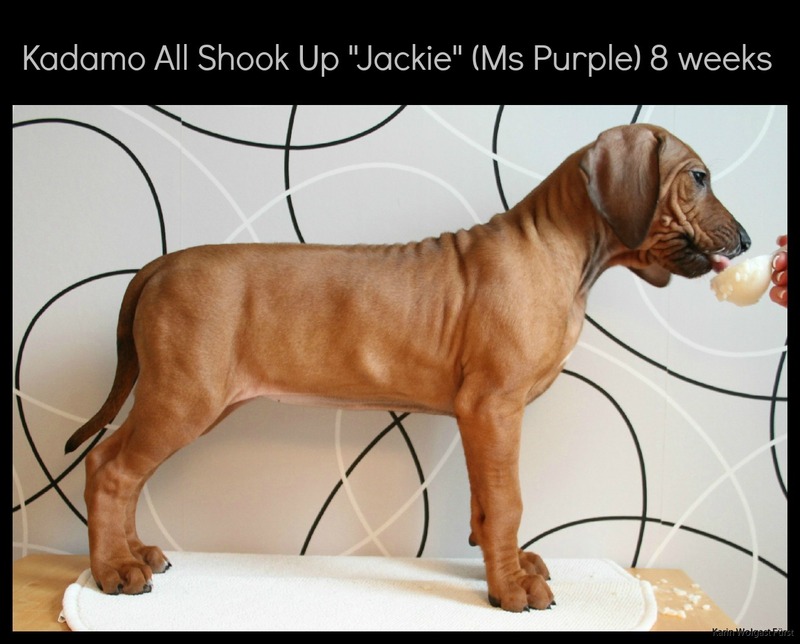 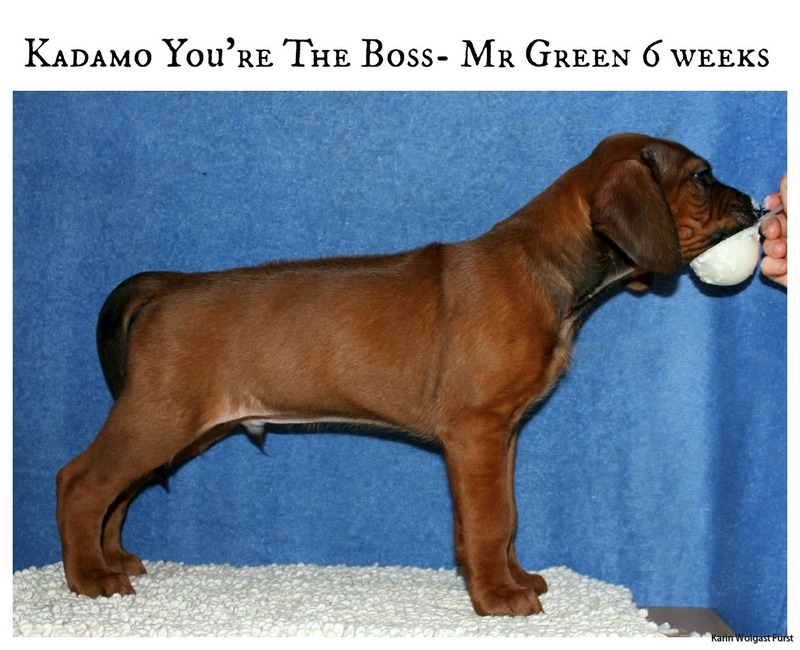 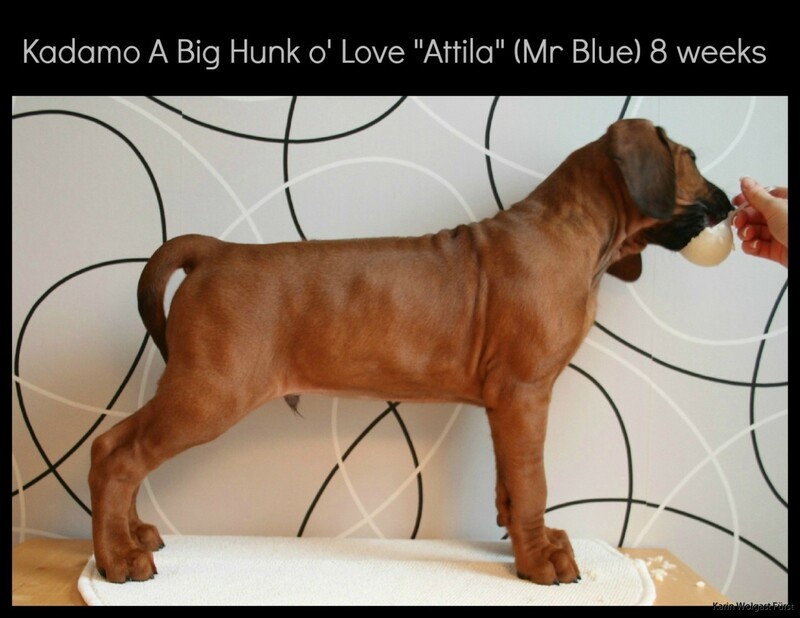 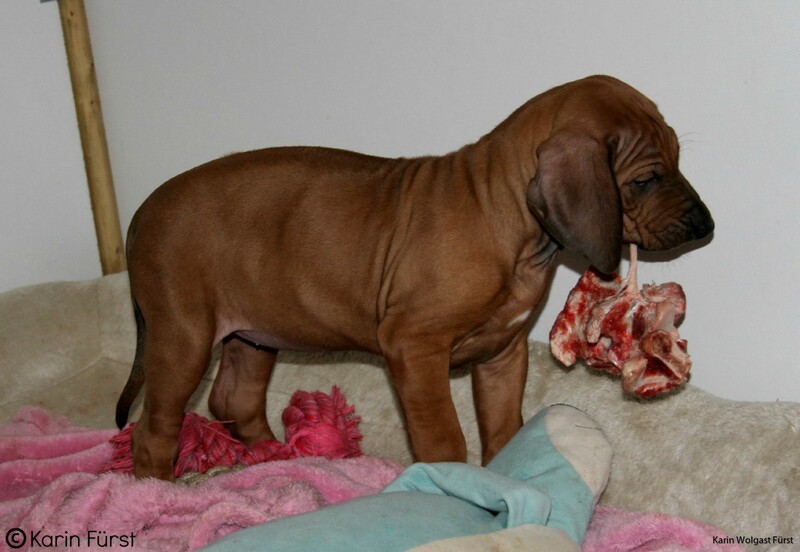 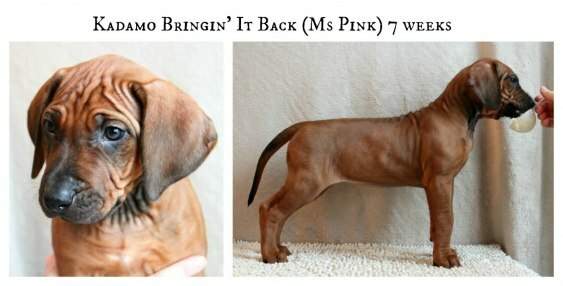 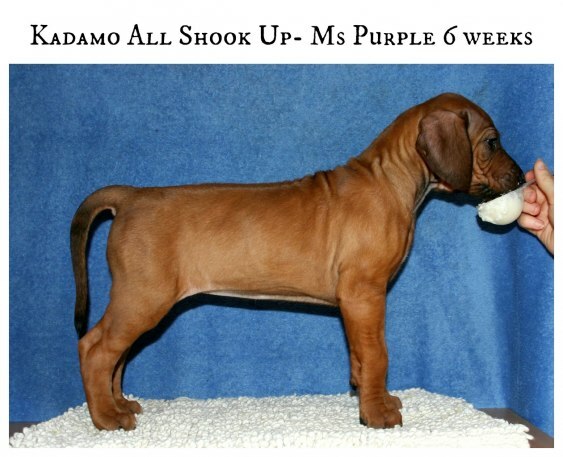 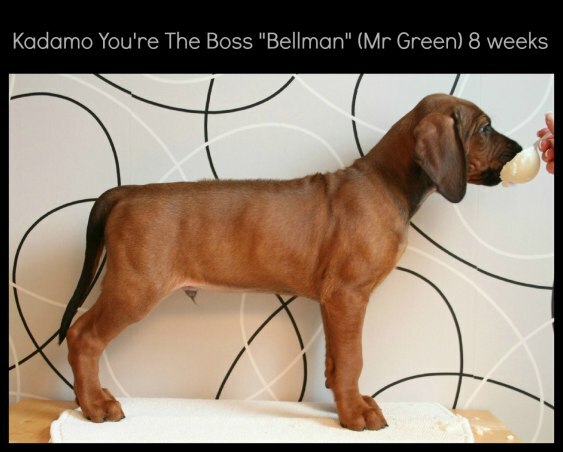 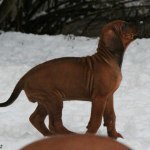 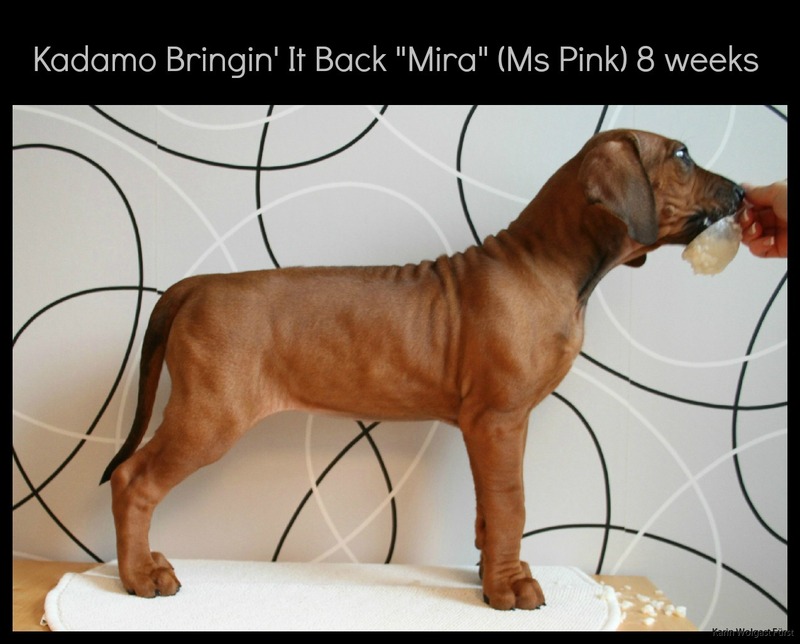 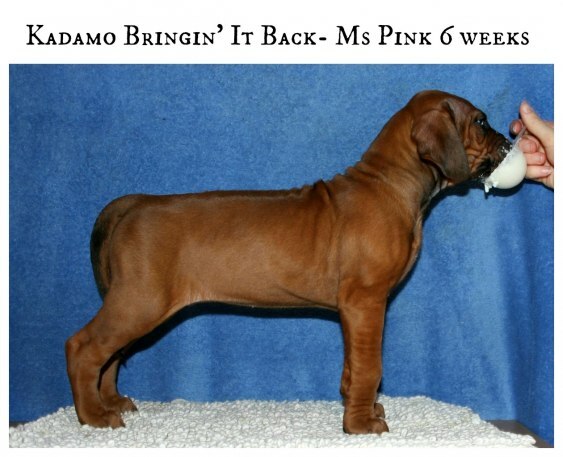 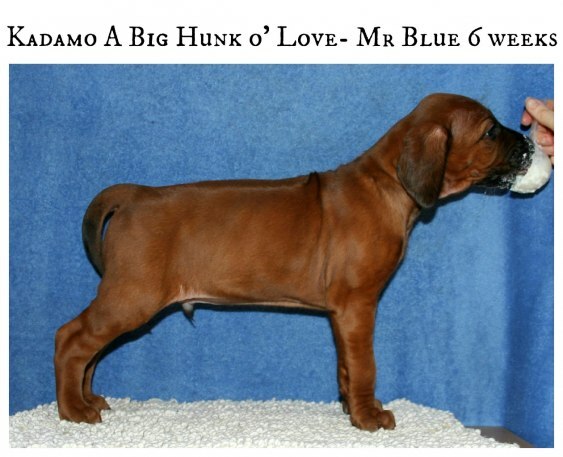 She is also getting her second girl from this litter, Ms Red. 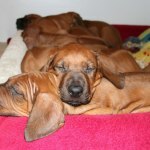 We packed all the puppies into the cage in the back of the car and drove to the vet. 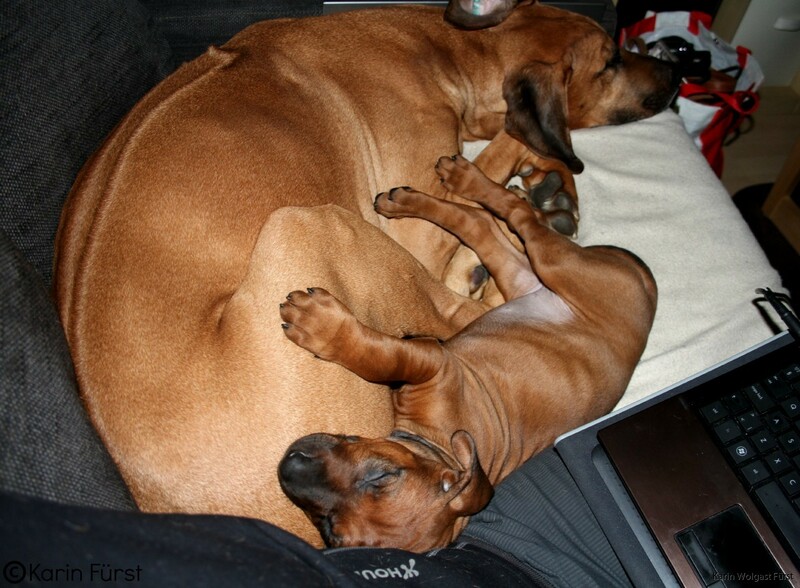 The puppies did well in the car, very little crying. 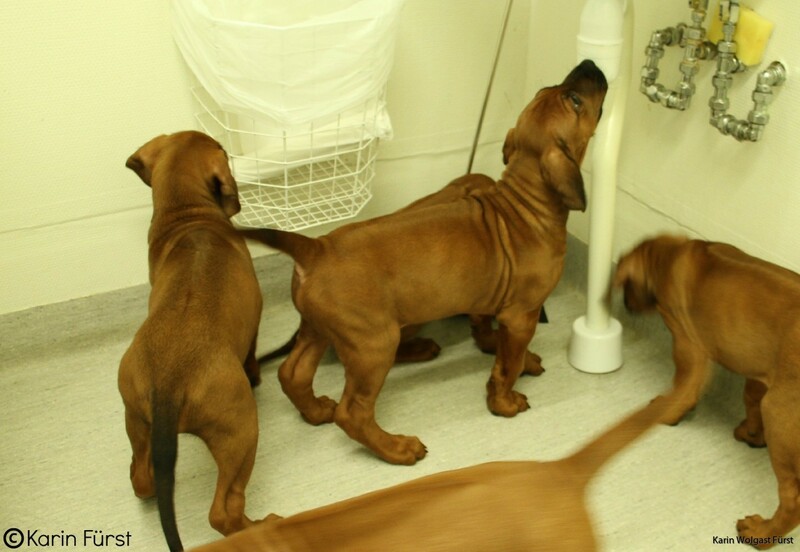 At the vet clinic they had a blast playing in the examination room checking everything out. 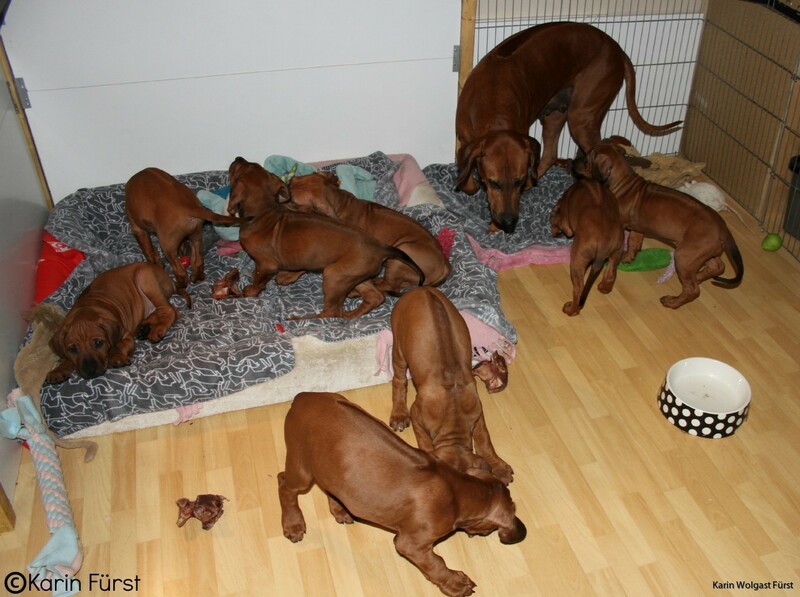 One by one they were checked by the veterinarian in a different room and they all did so well. 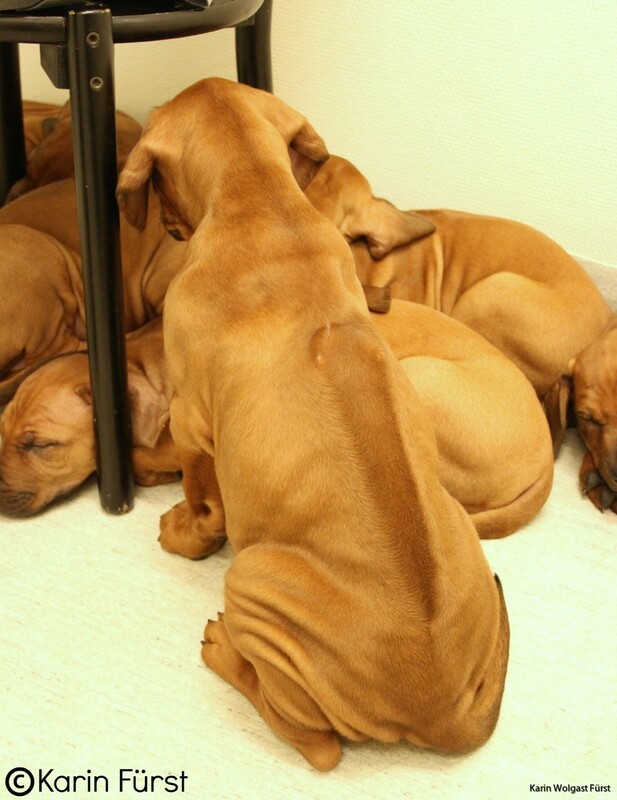 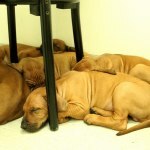 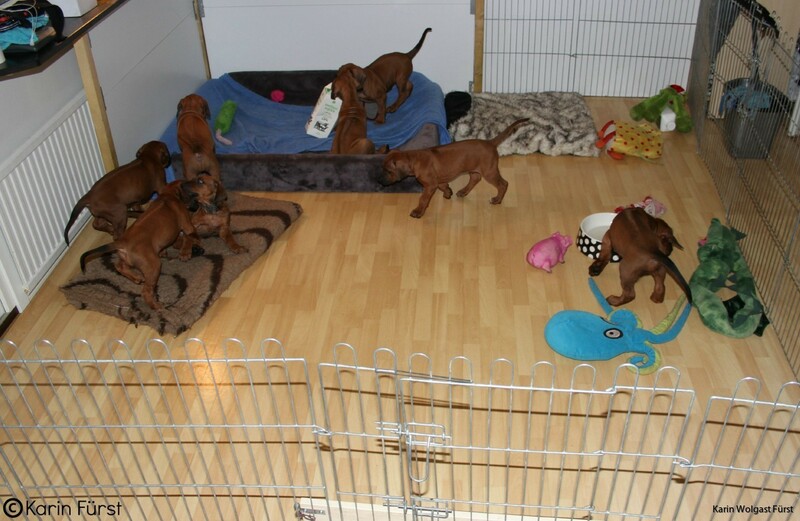 I took the opportunity to see how they puppies acted in a new room without their brothers and sisters. 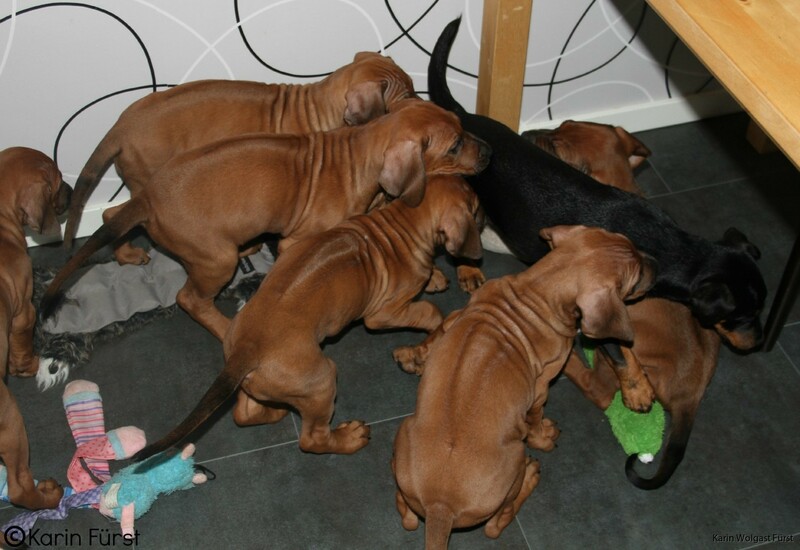 And I have to say in general very curious and very happy puppies! 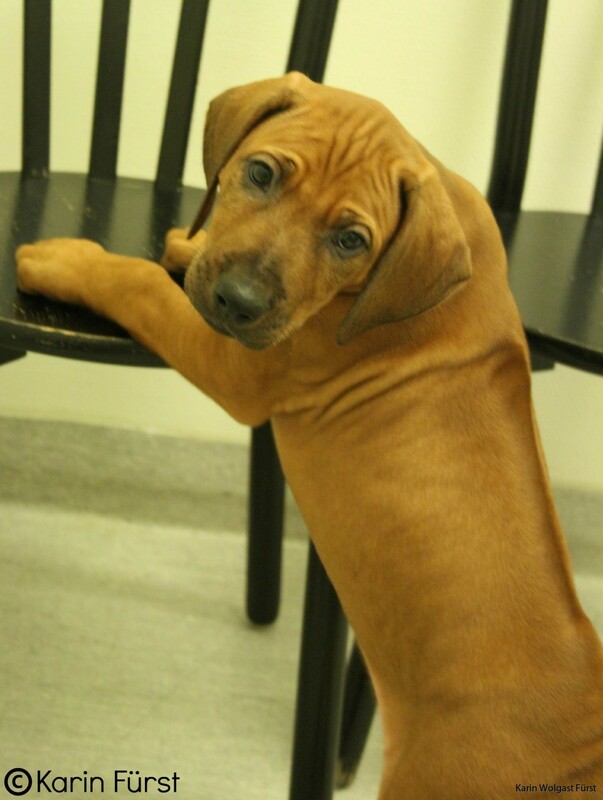 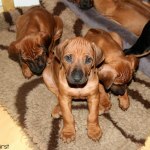 The puppies are now all vaccinated, ID-chiped and got all their papers ready for when they start to move on Thursday. 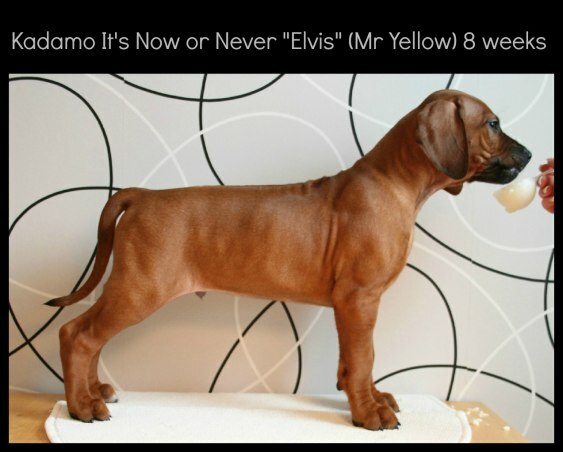 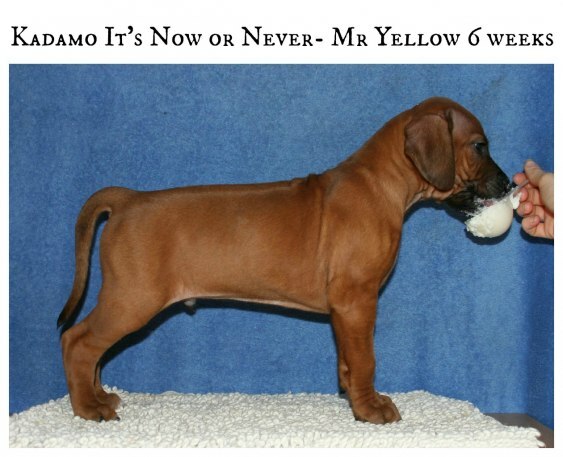 Mr Yellow (Kadamo It's Now or Never) has gotten his own passport and an exportpedigree since he will be moving to the Czech Republic. 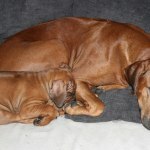 In the afternoon the puppies was pretty tired for a while so I could take care of other things at home. 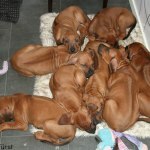 But in the evening they were awake and wild as usual! 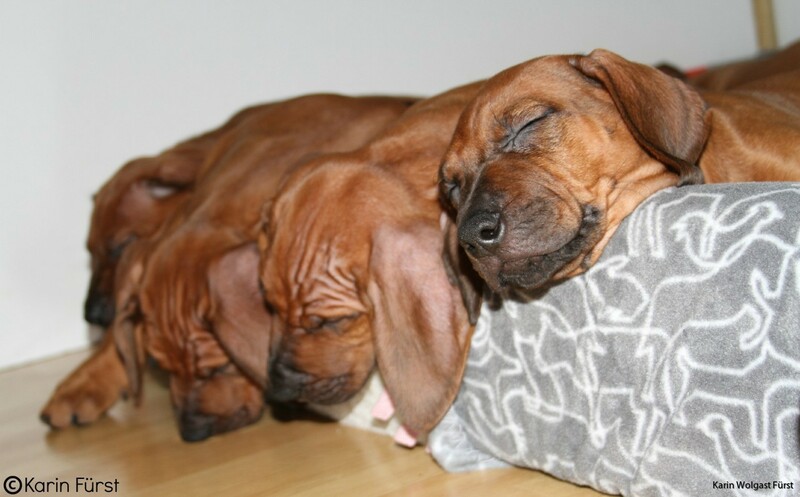 They have now gotten their puppyblankets to sleep on so they have something that smell a little bit of home when they move. 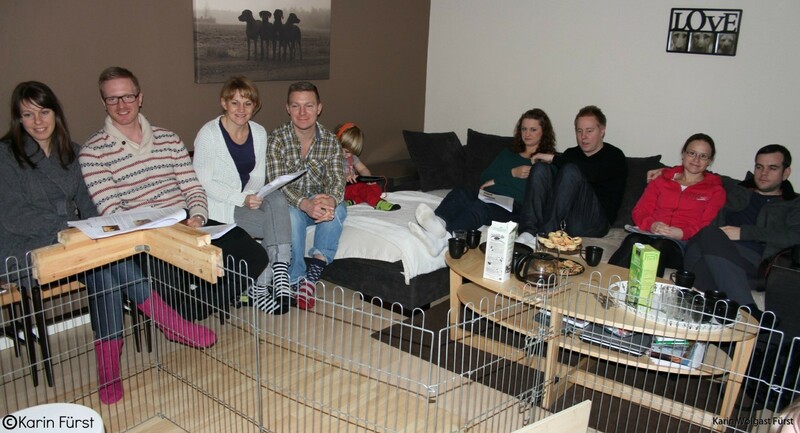 Tomorrow is our last day all together so will make sure to make the most of it! 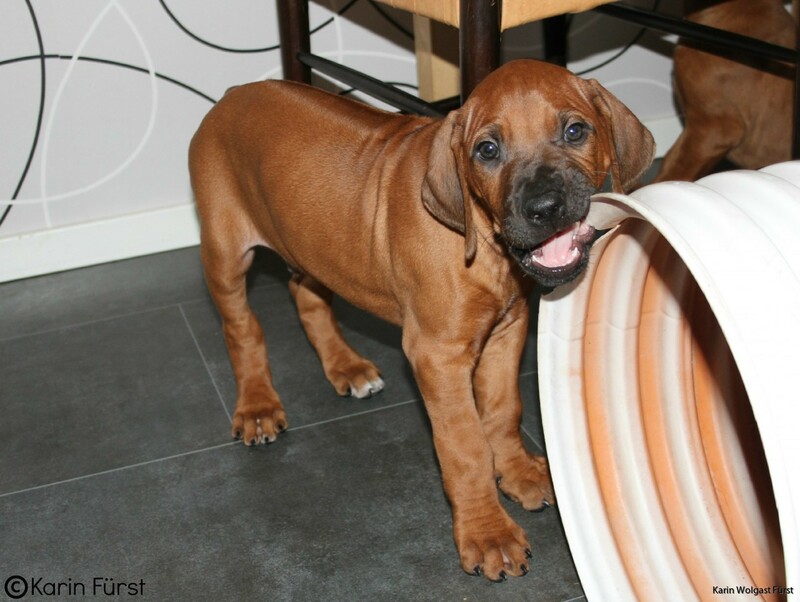 They also got to play in the kitchen and for the first time with their big plastic tunnel. 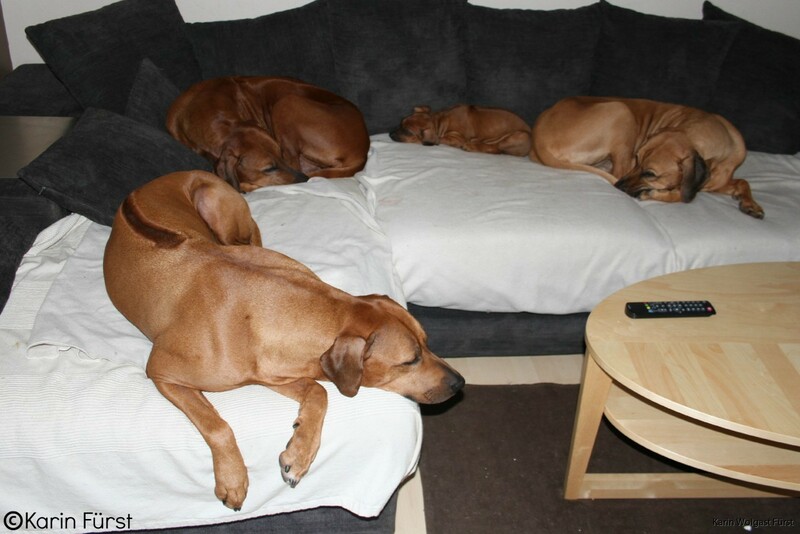 I thought they would be suspicious but not at all, they really seemed to enjoy it! 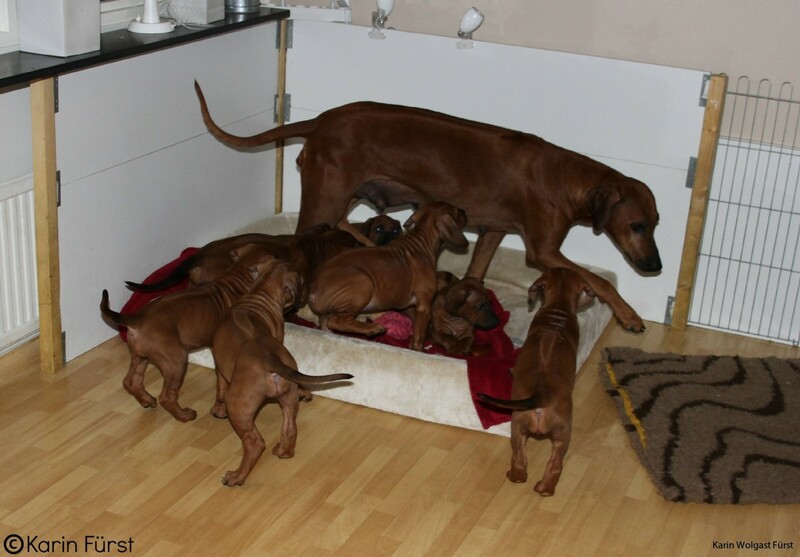 Today they have destroyed the cover to my dogbed that they have in the puppypen. 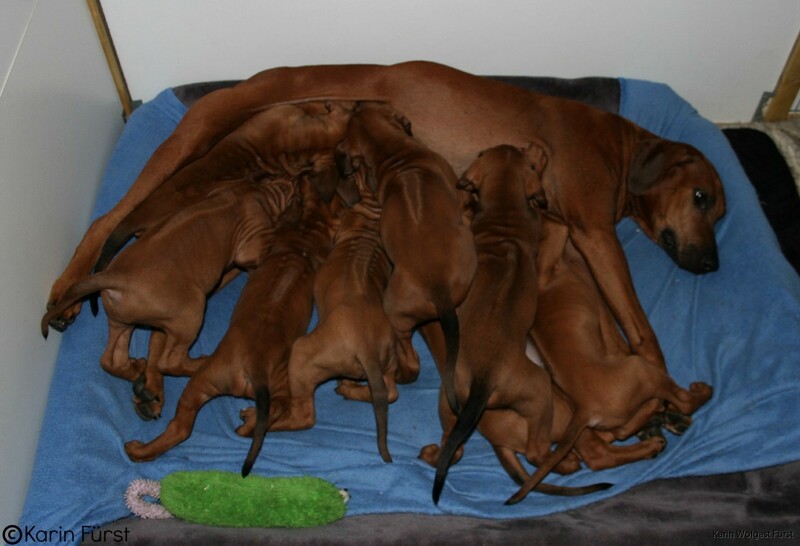 But I can't complain, they managed to keep it in one piece until the final week, better than my previous litters at least! 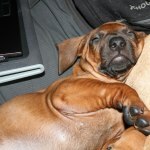 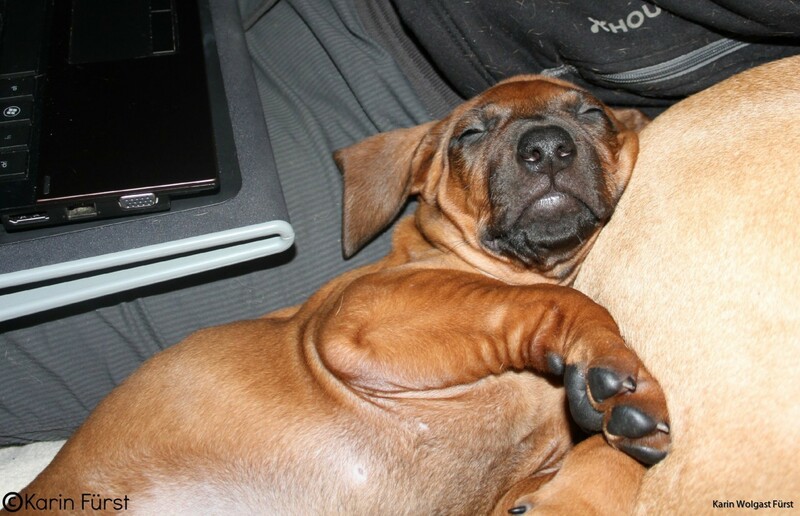 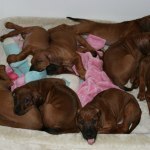 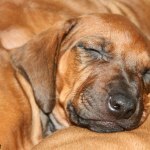 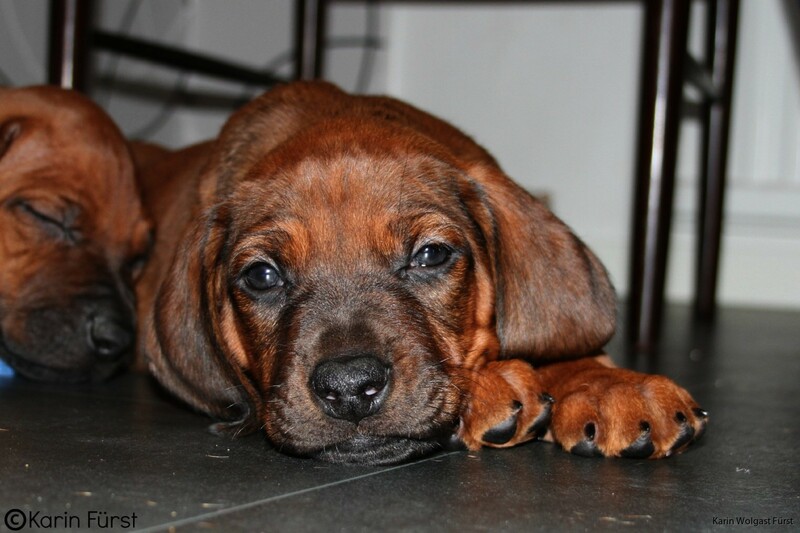 Now we are going to bed, it will be a long day tomorrow with the puppies visit to the vet, we all need the energy! 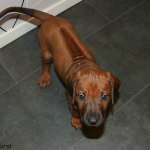 A couple of videos from the kitchen and also some new photos below! 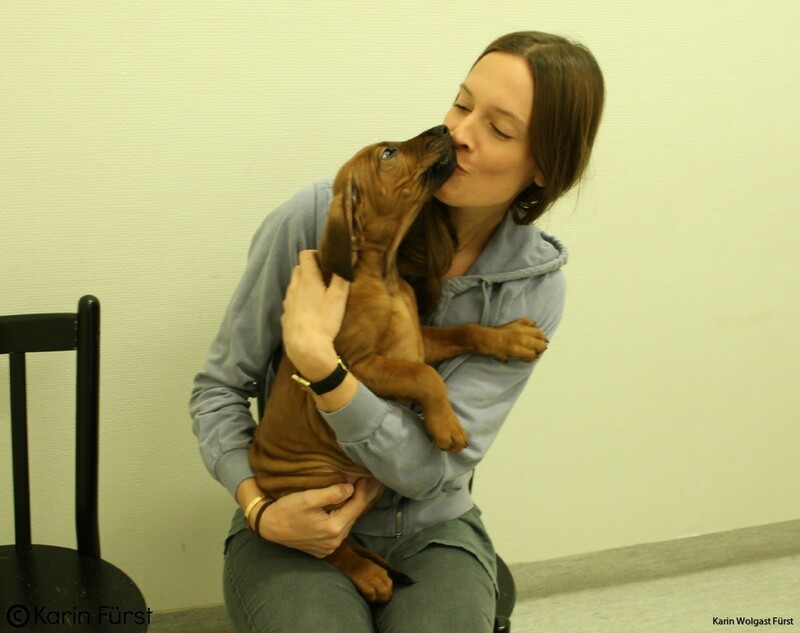 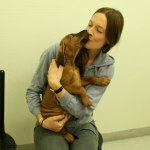 Of course there was time for kisses and cuddles too, and they all got to cut their puppys claws and learn some basic training. 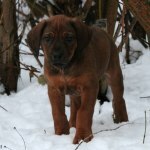 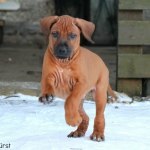 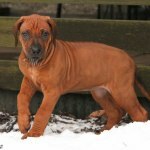 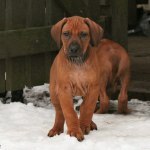 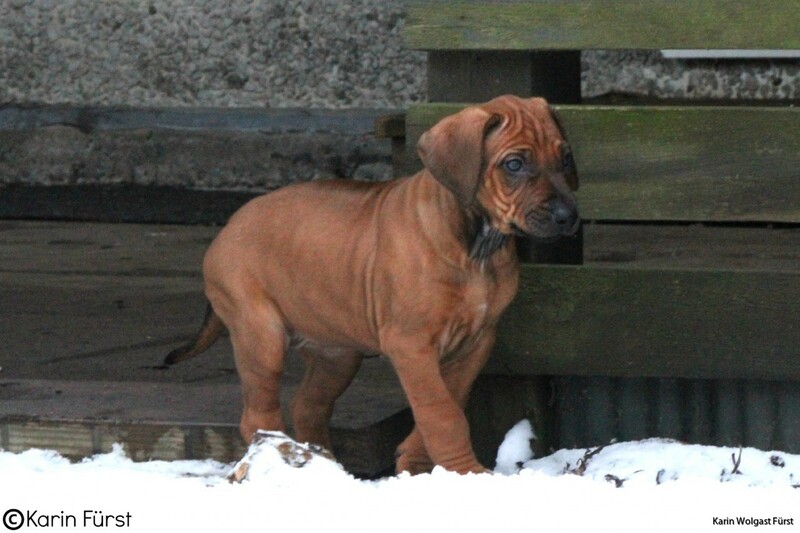 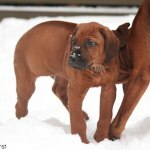 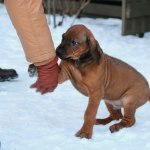 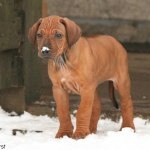 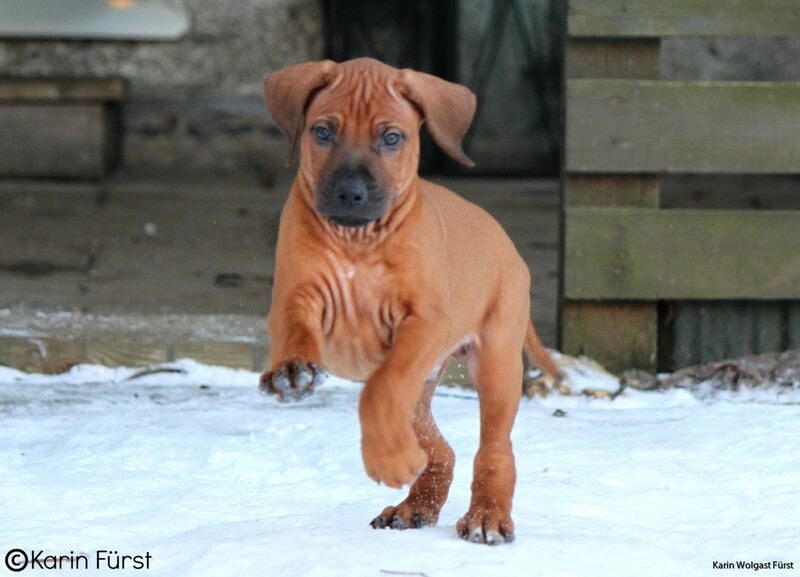 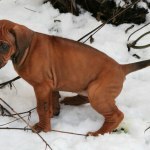 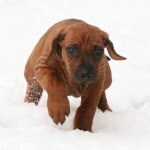 Today we have had a few visitors and the puppies has also enjoyed some playing out in the snow. 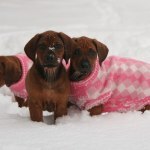 It is colder here now so they can't be outside for very long, but they still seem to enjoy it! 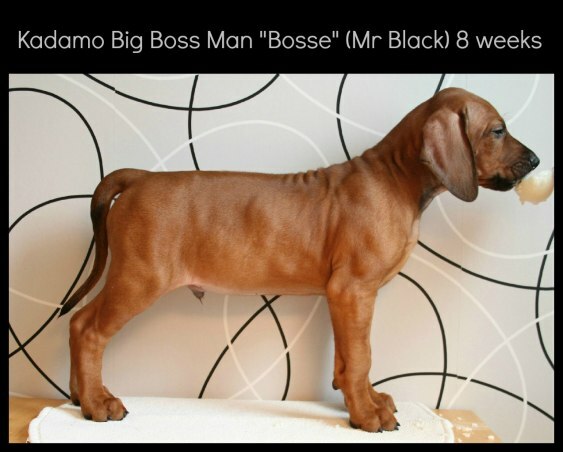 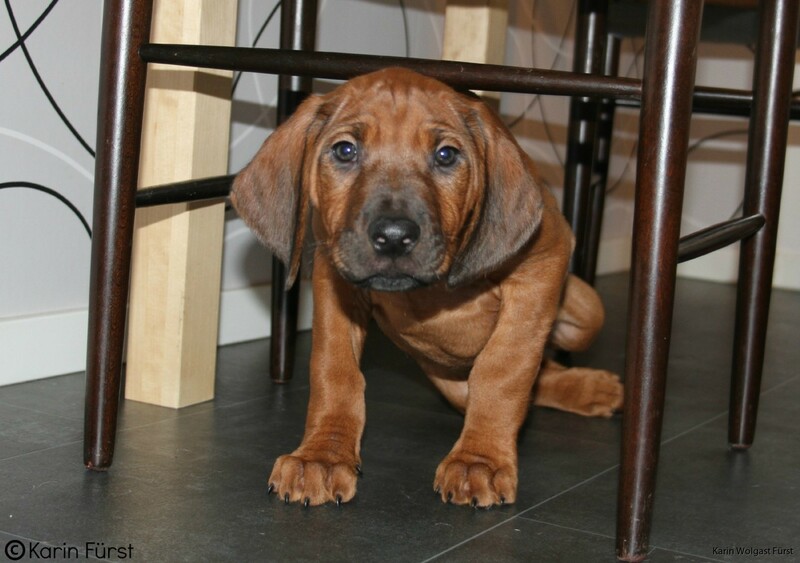 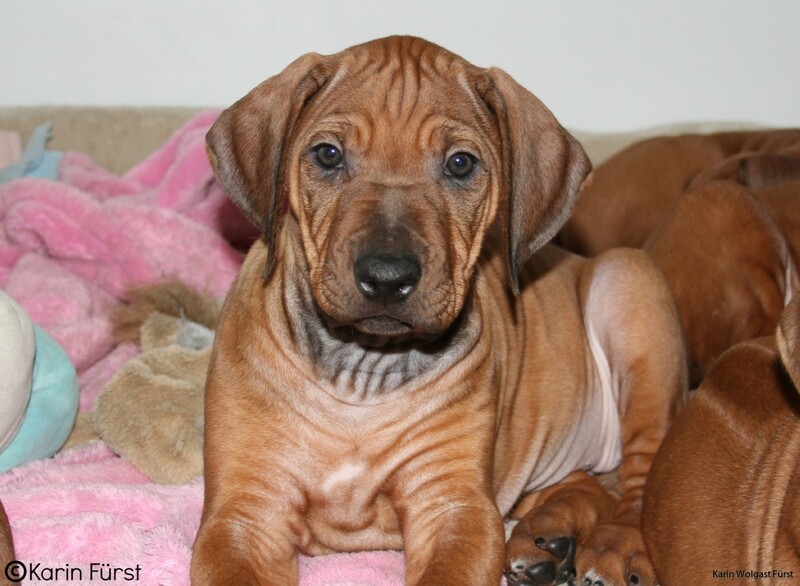 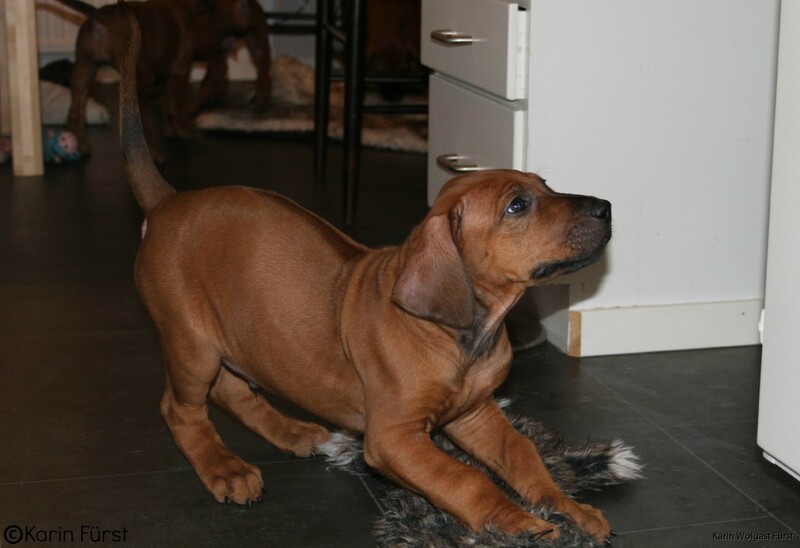 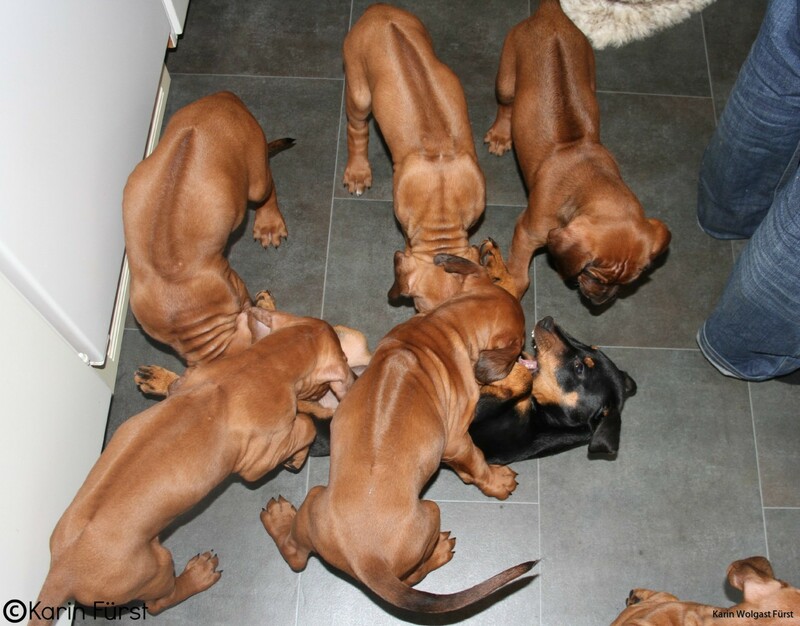 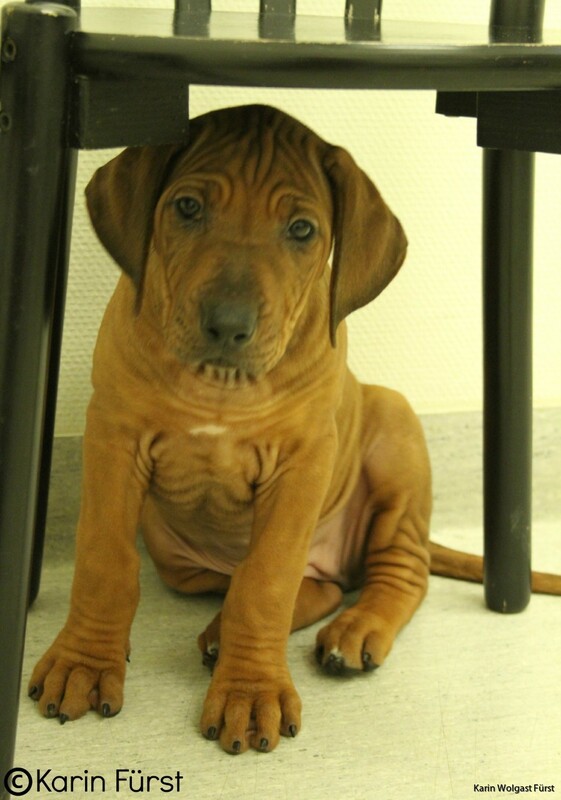 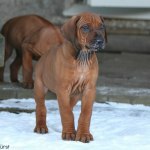 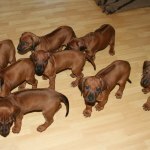 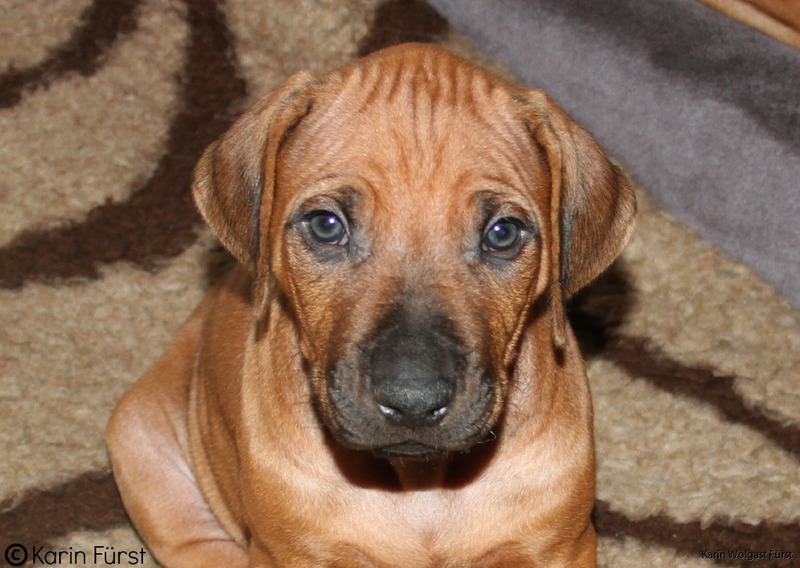 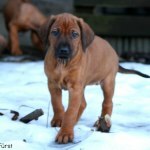 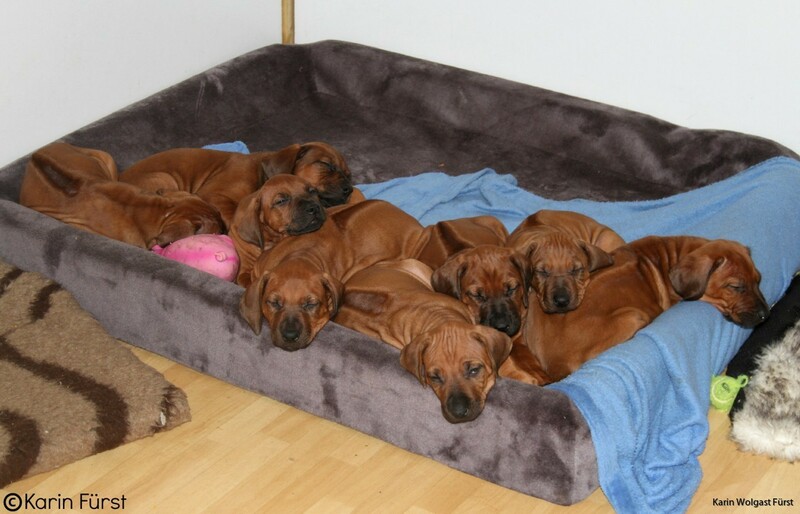 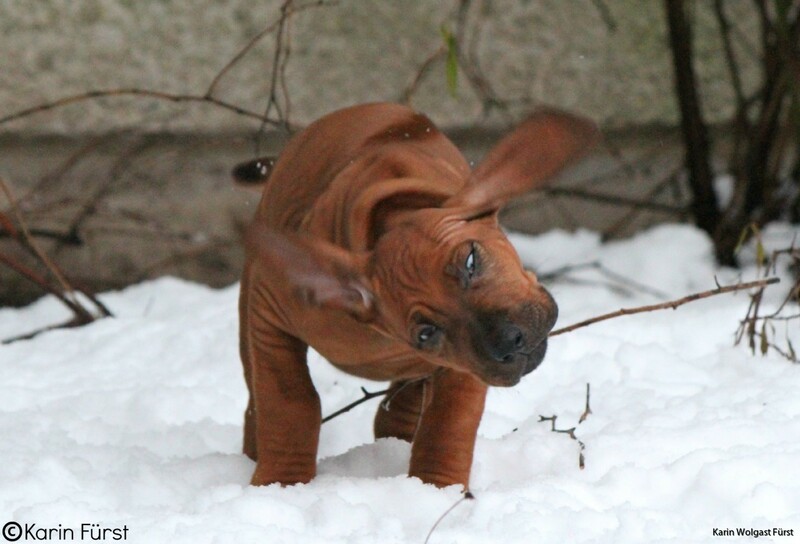 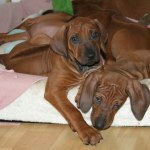 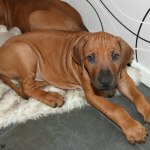 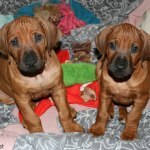 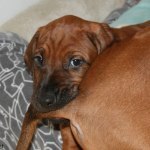 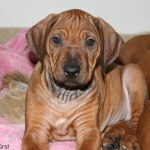 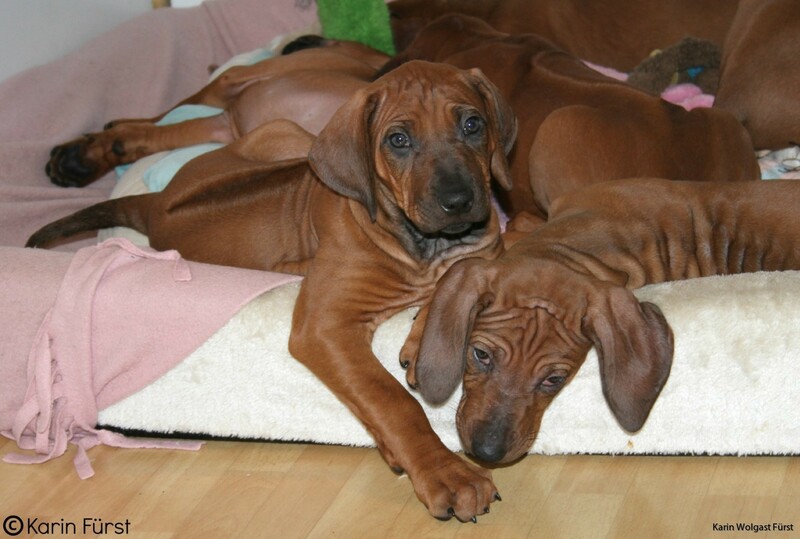 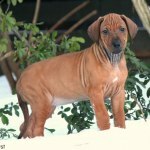 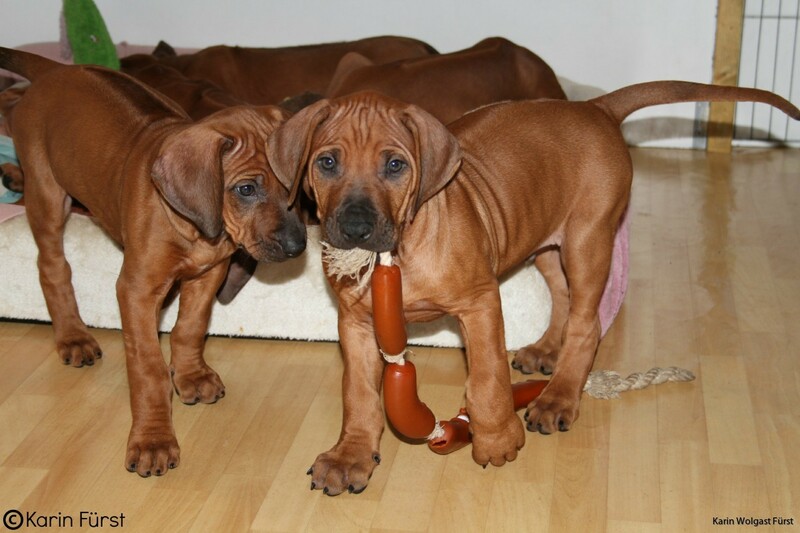 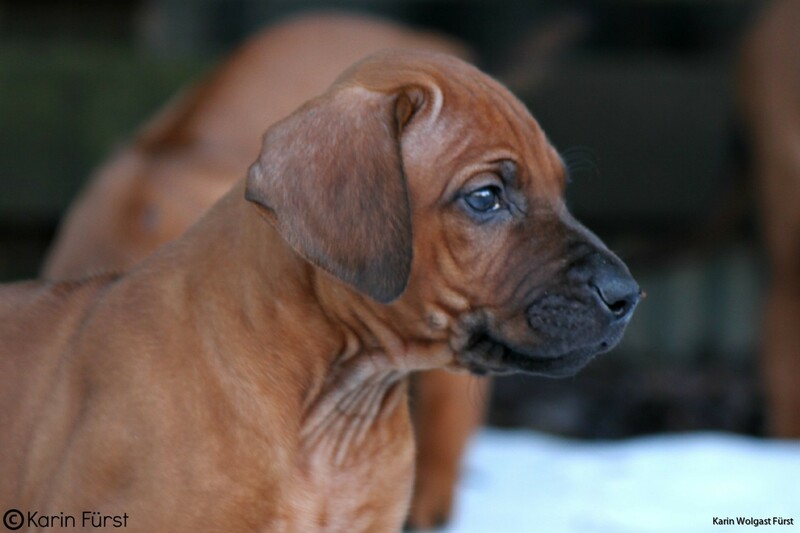 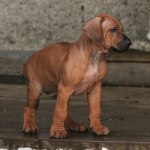 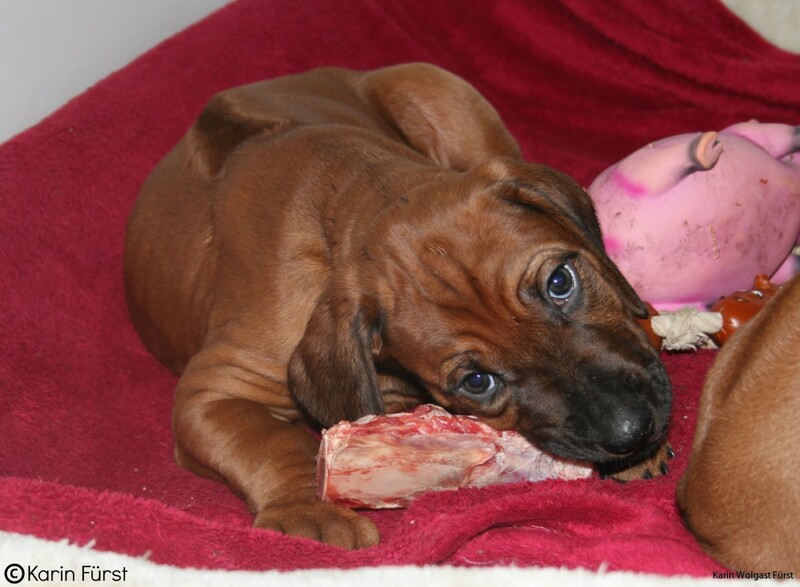 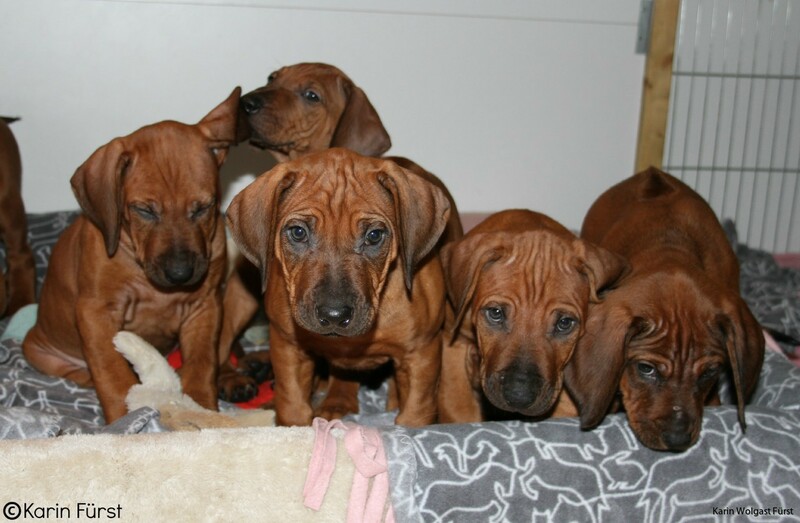 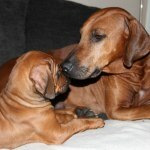 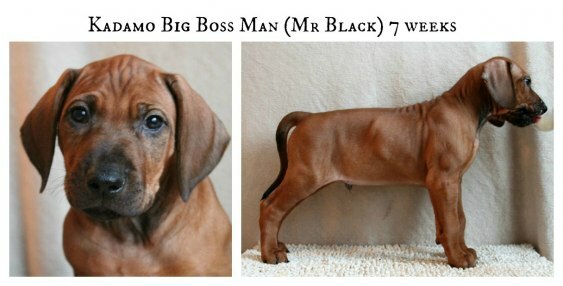 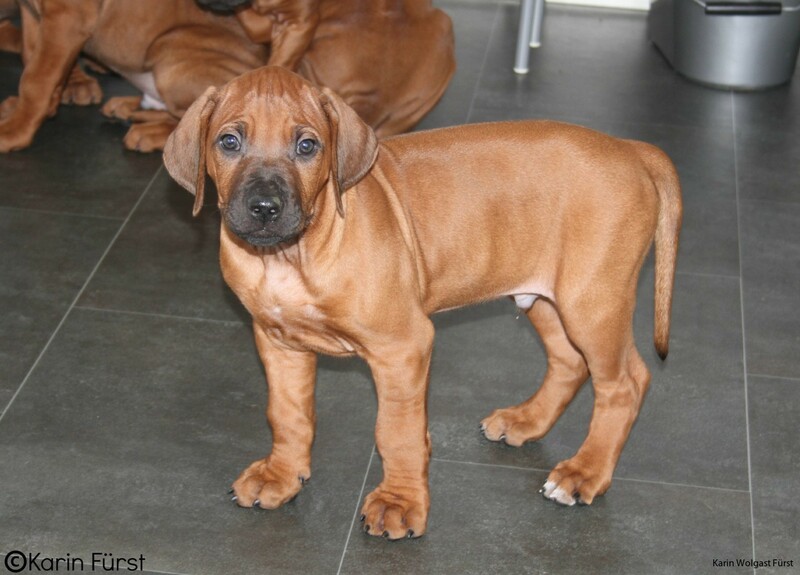 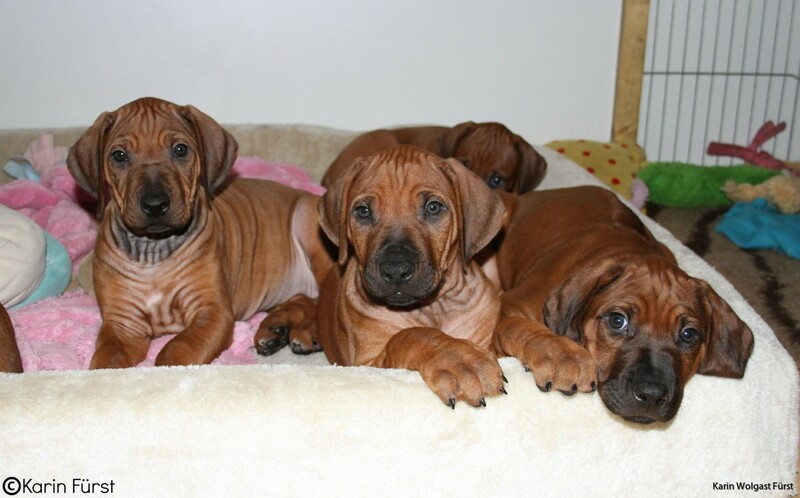 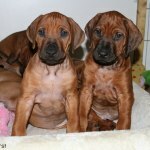 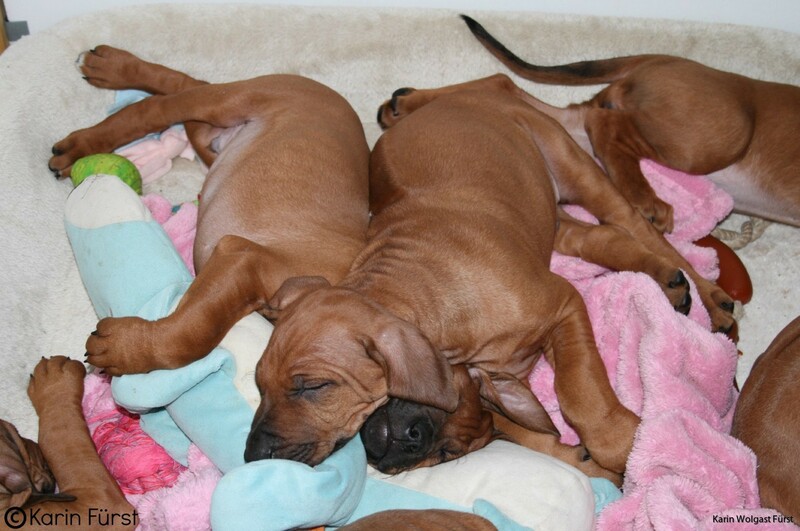 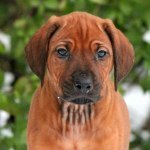 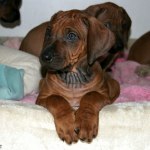 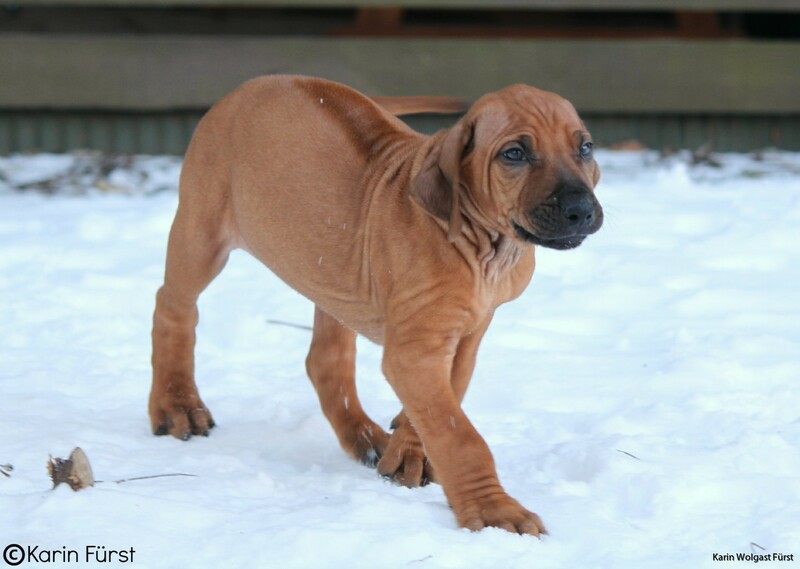 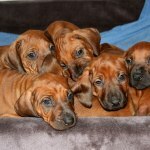 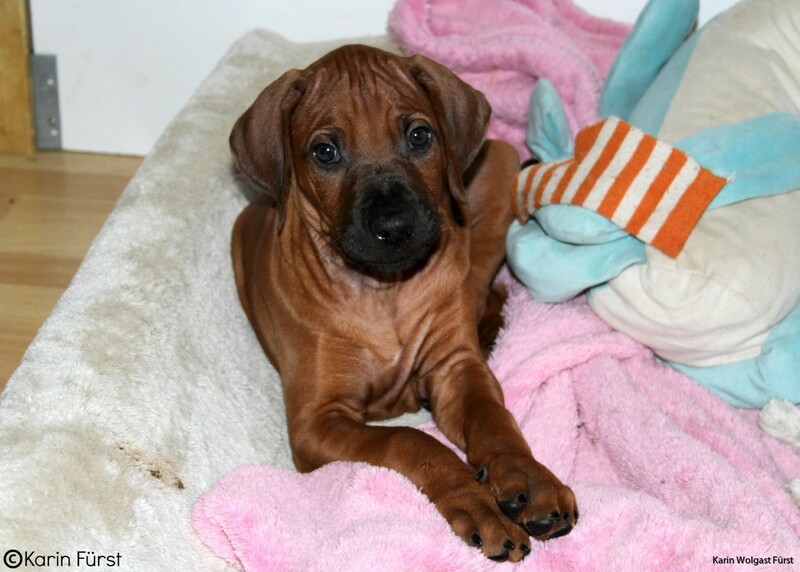 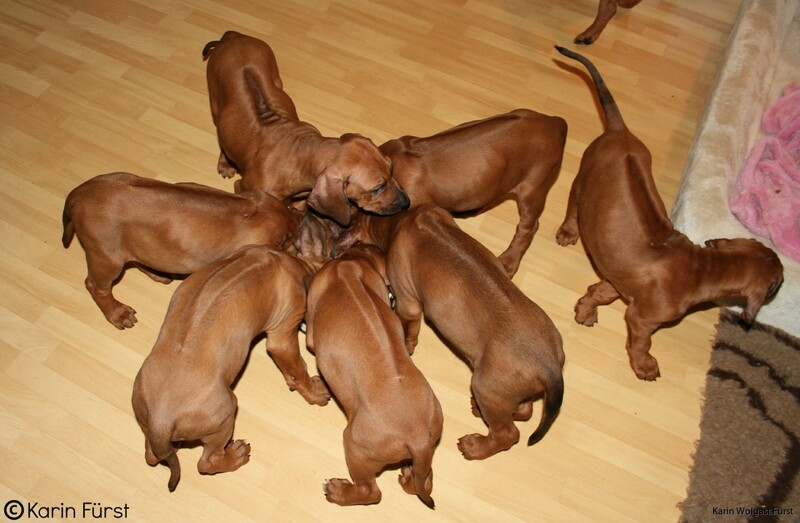 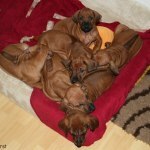 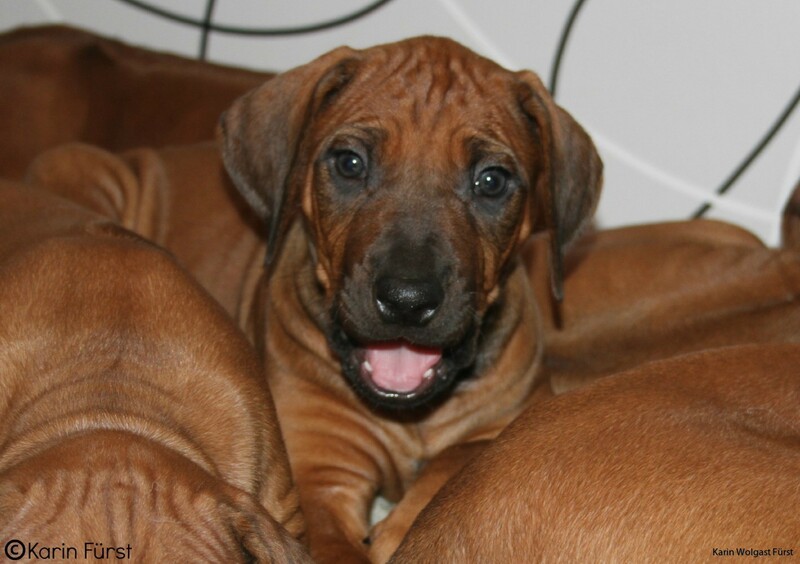 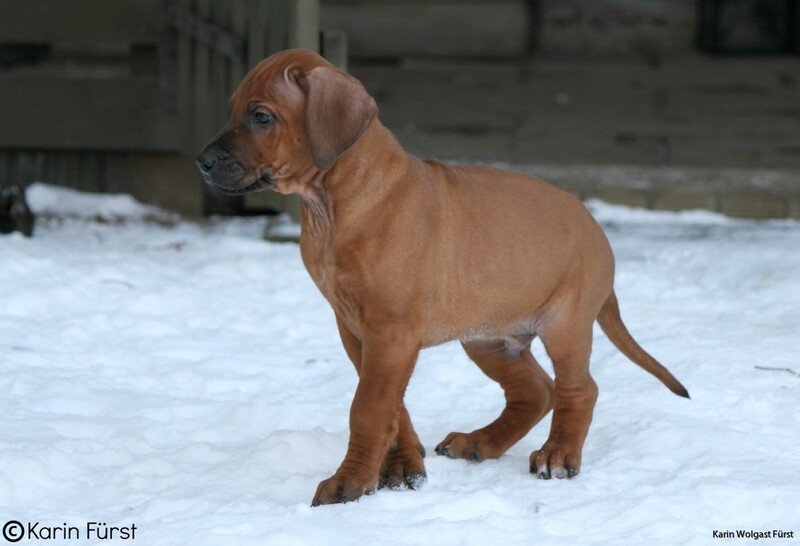 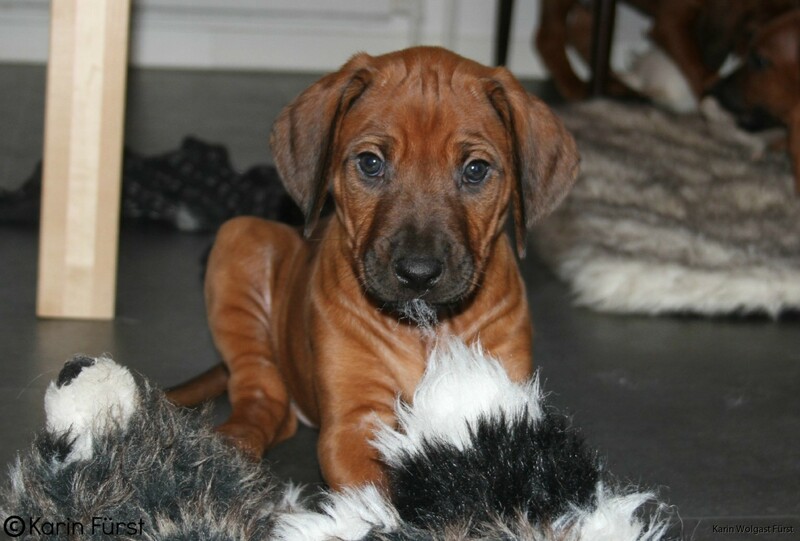 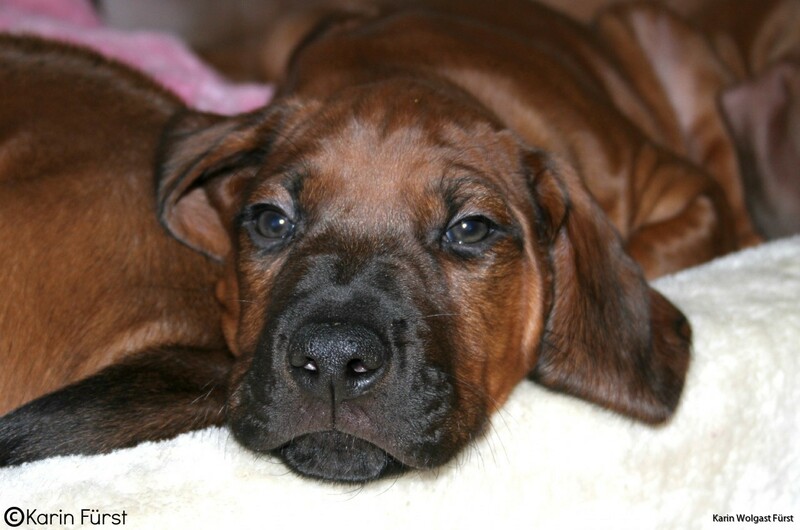 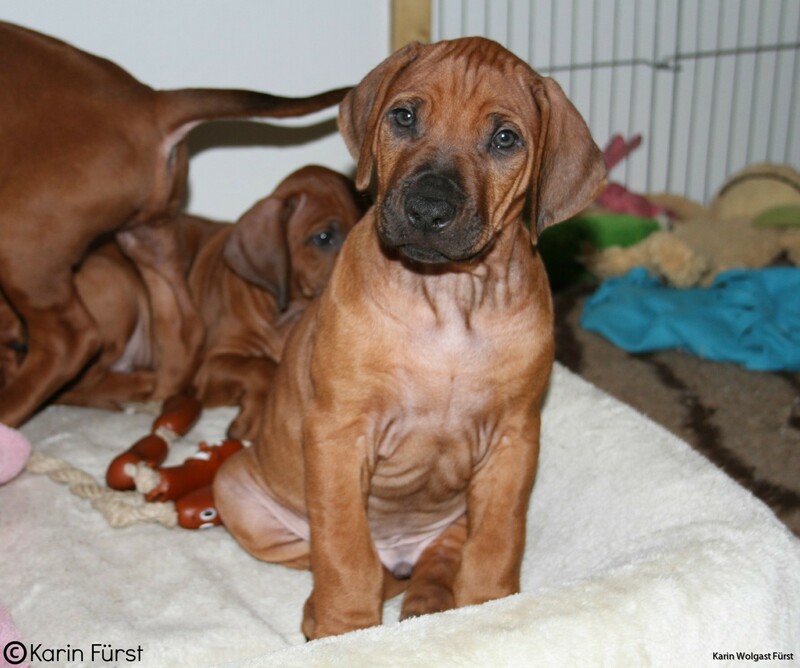 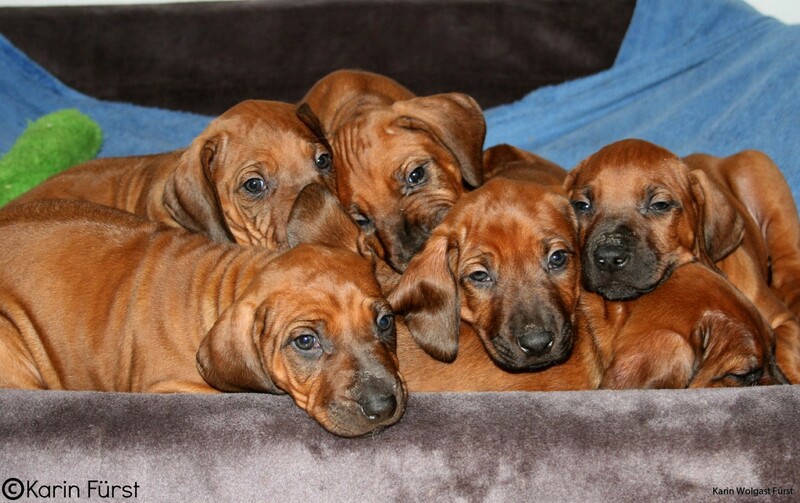 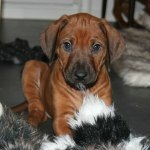 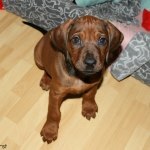 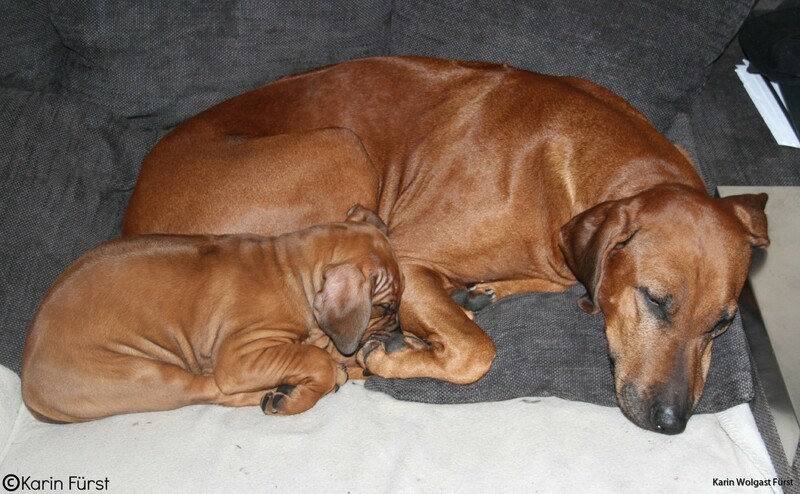 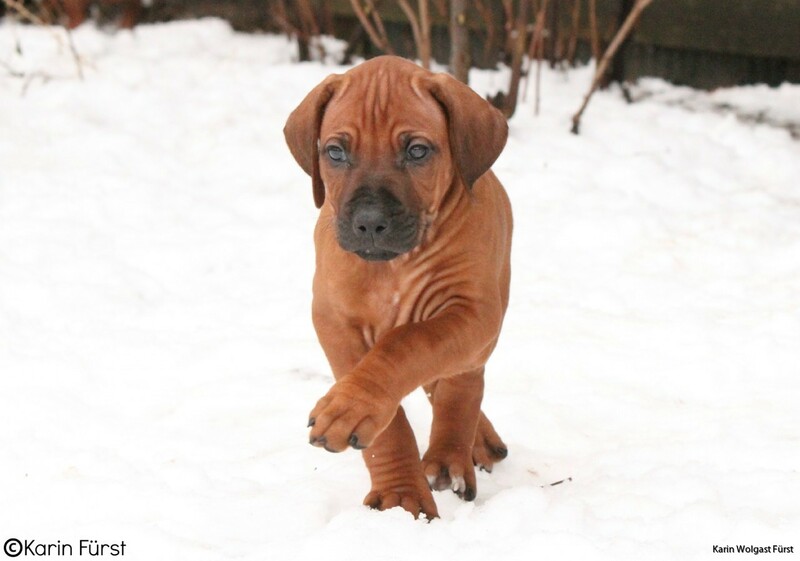 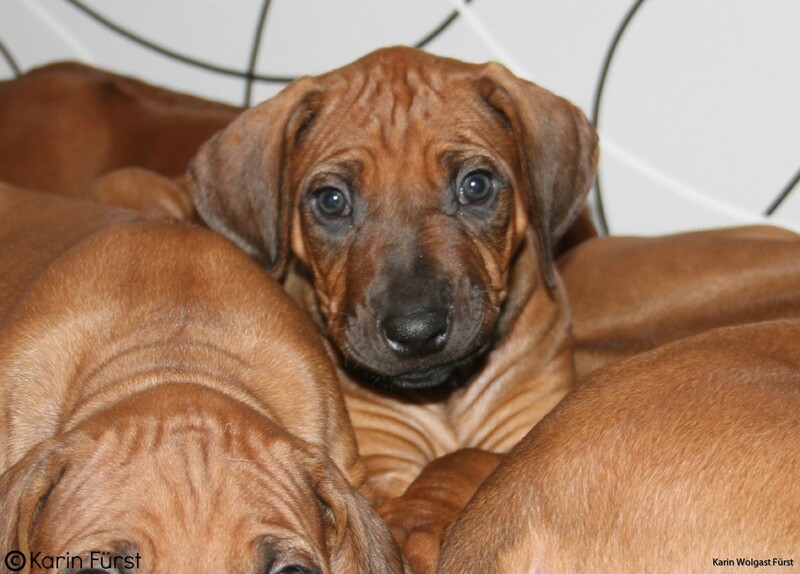 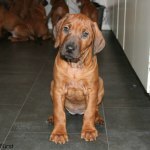 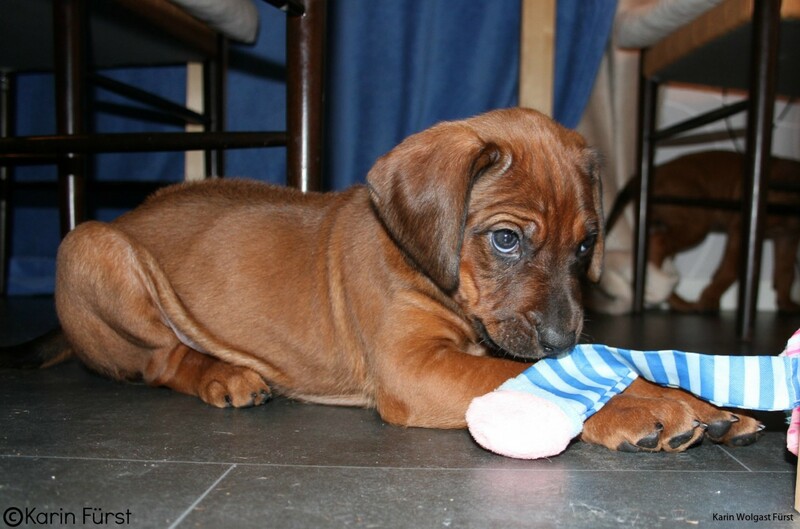 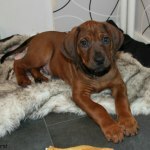 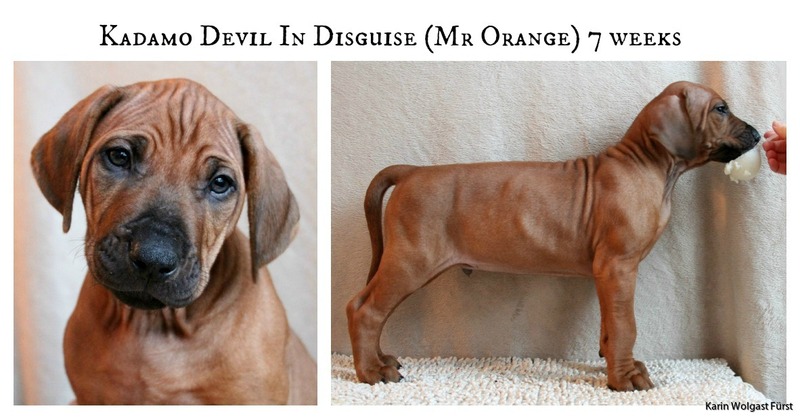 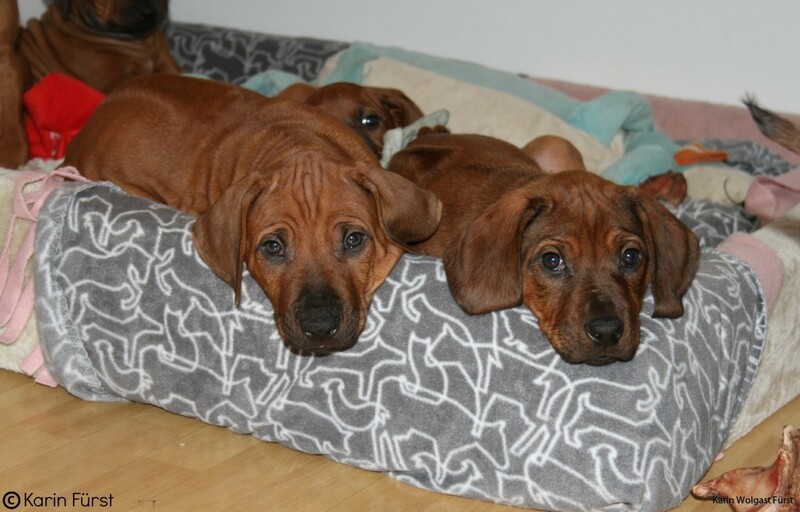 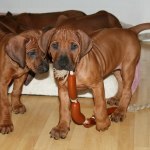 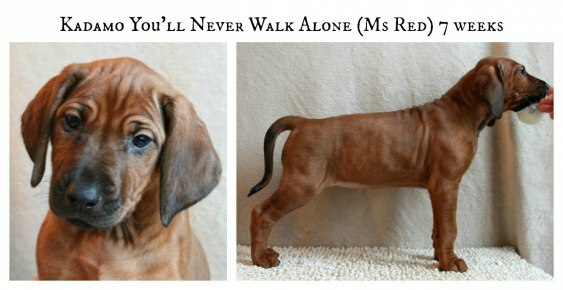 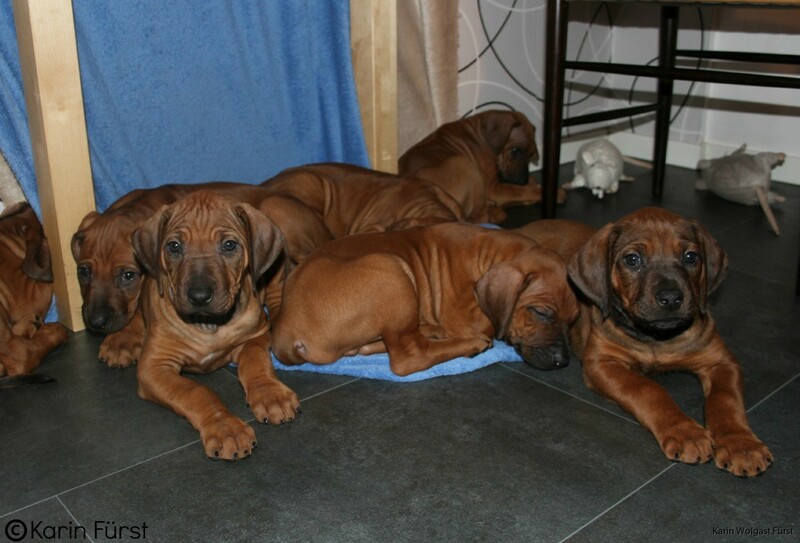 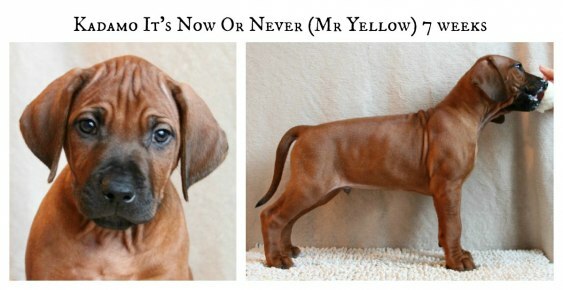 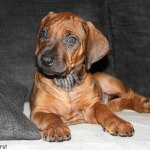 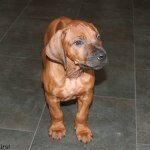 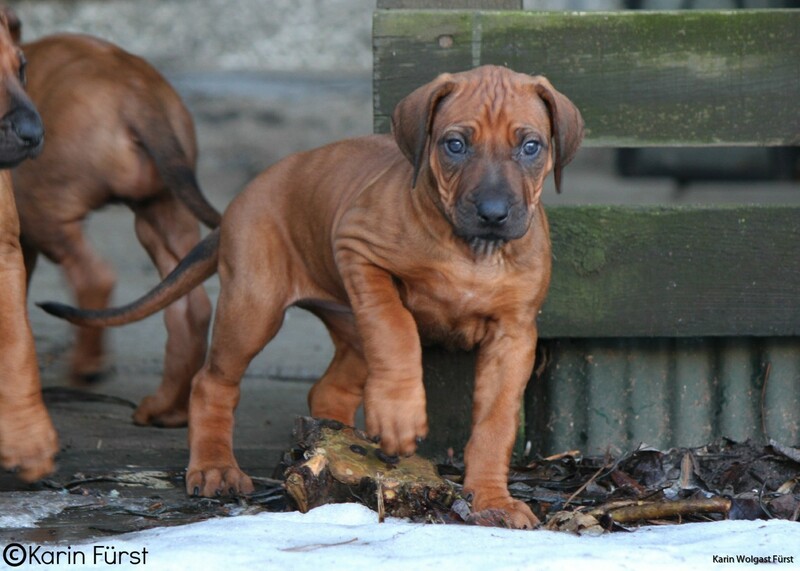 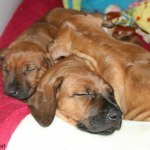 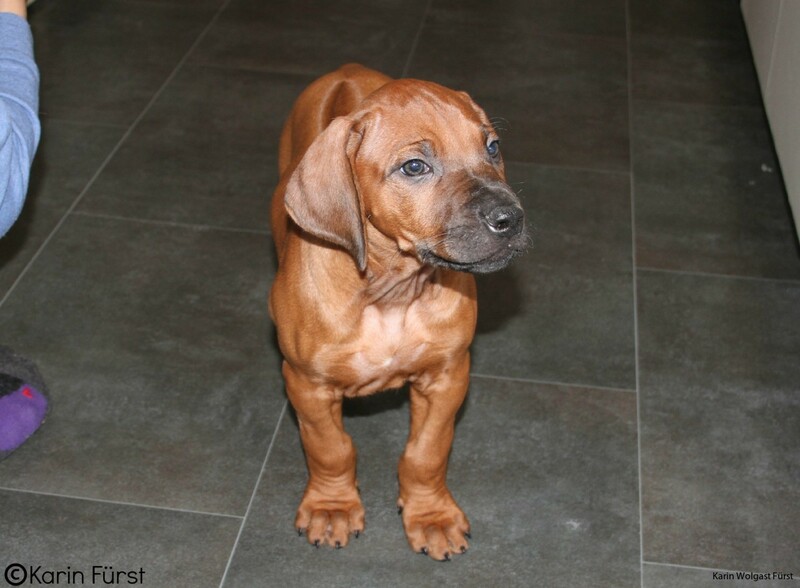 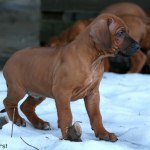 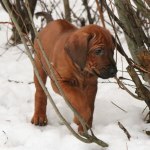 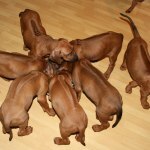 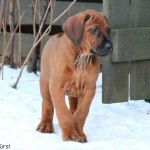 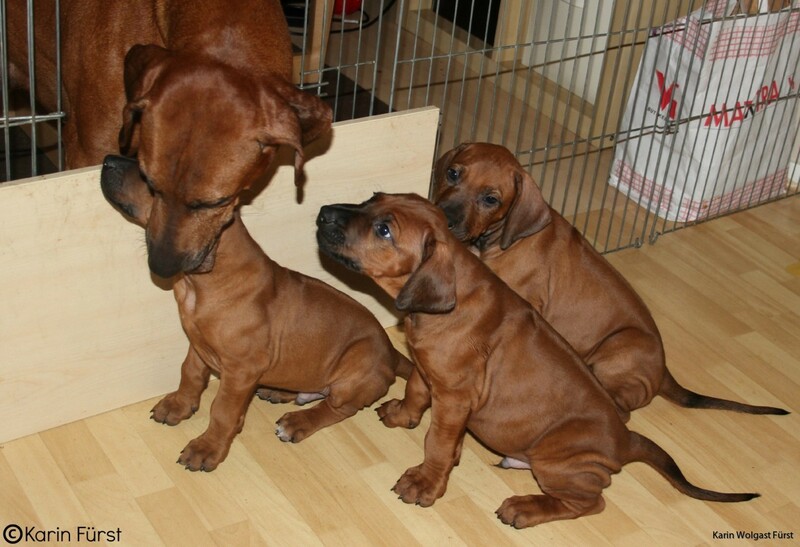 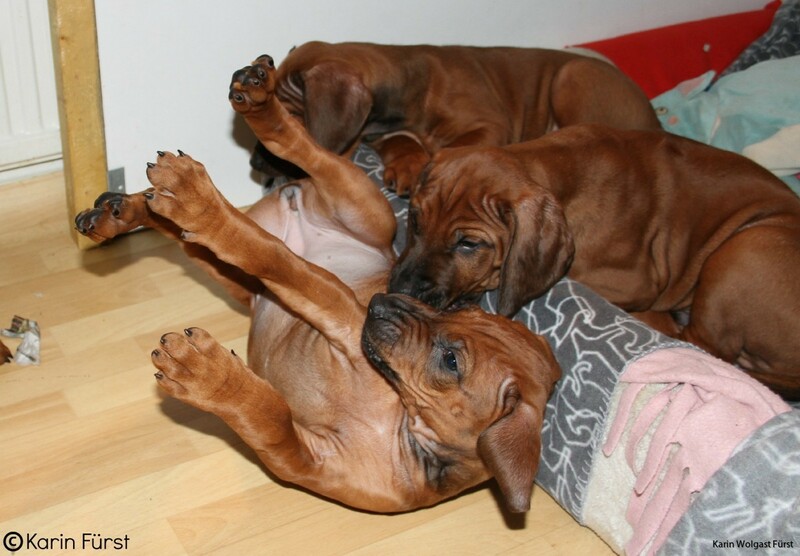 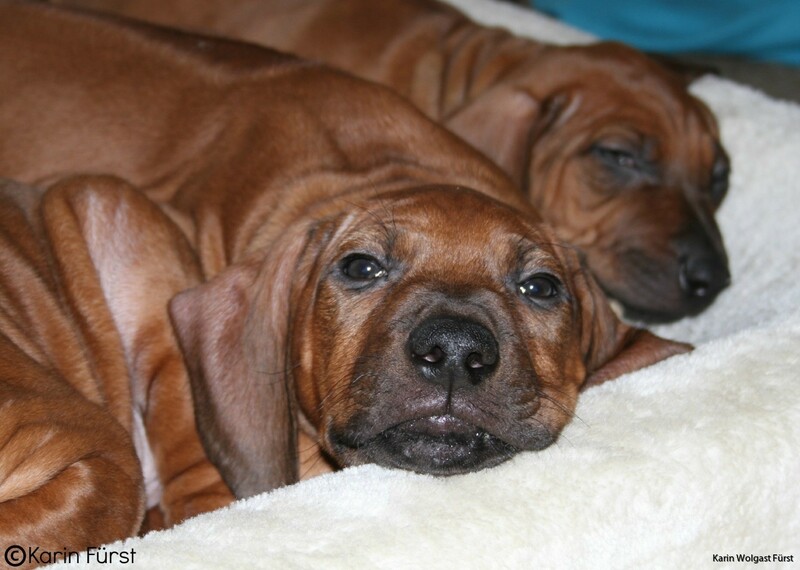 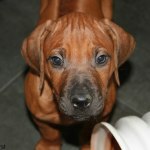 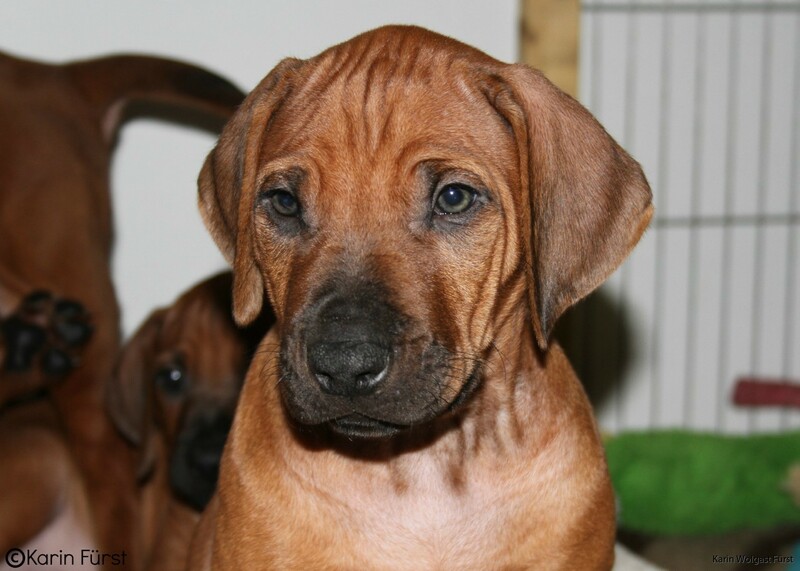 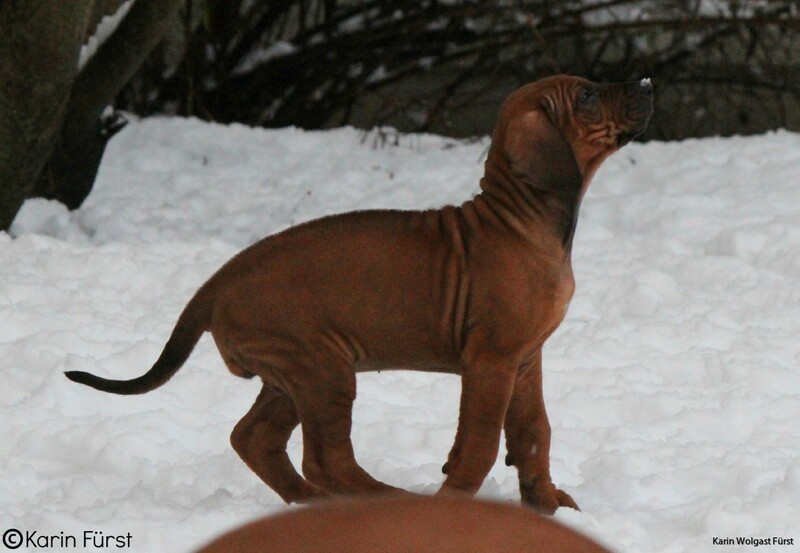 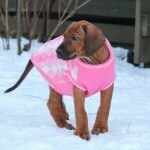 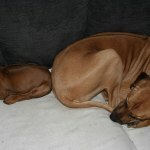 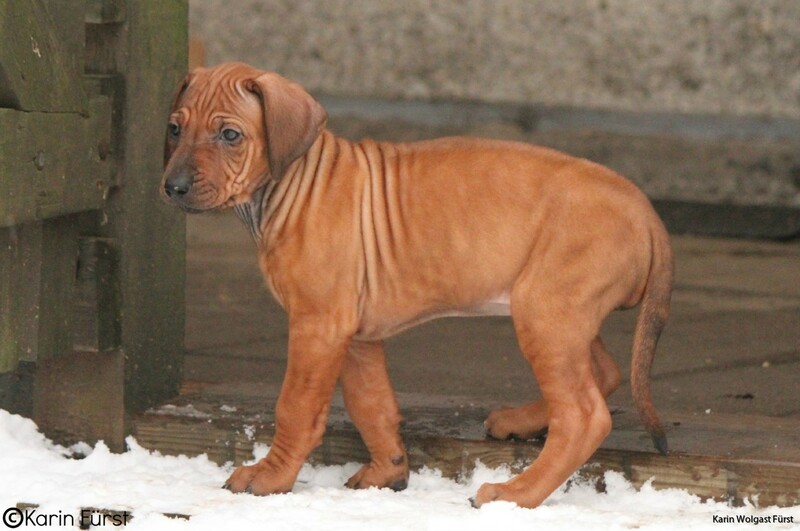 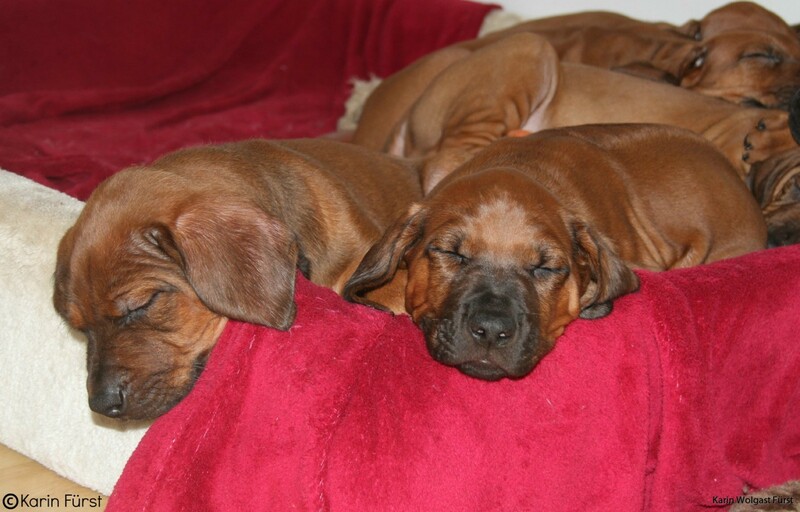 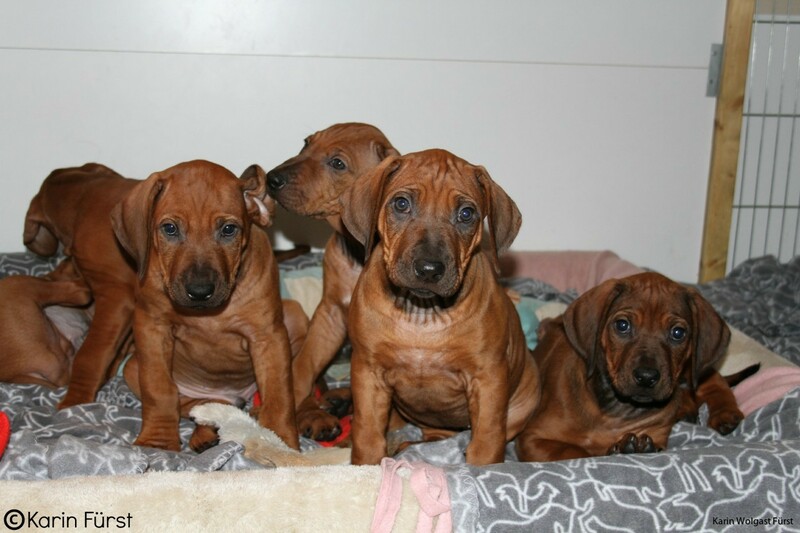 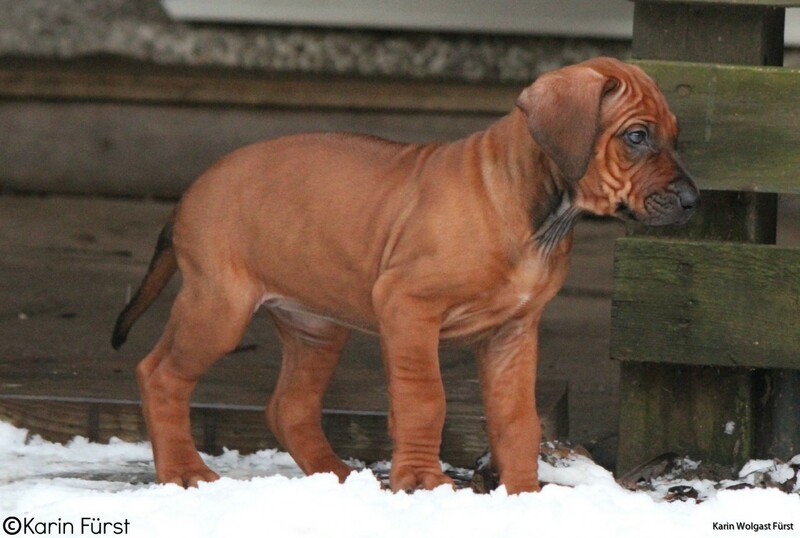 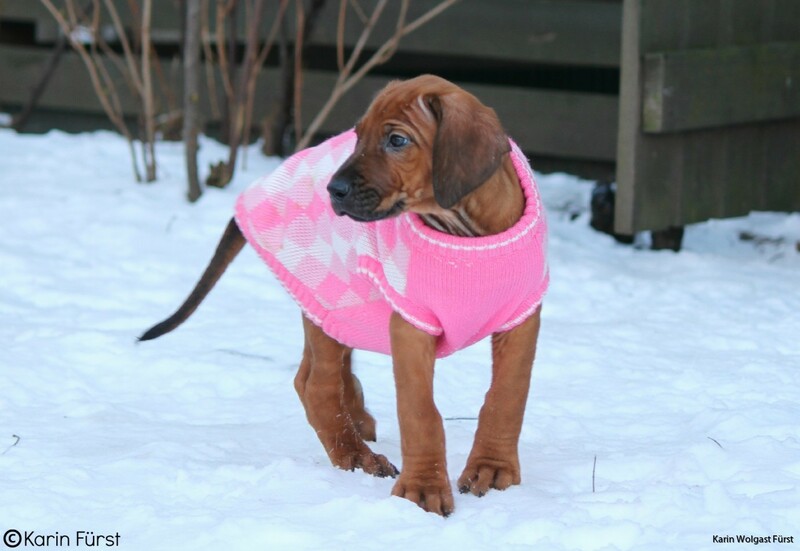 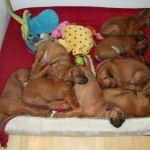 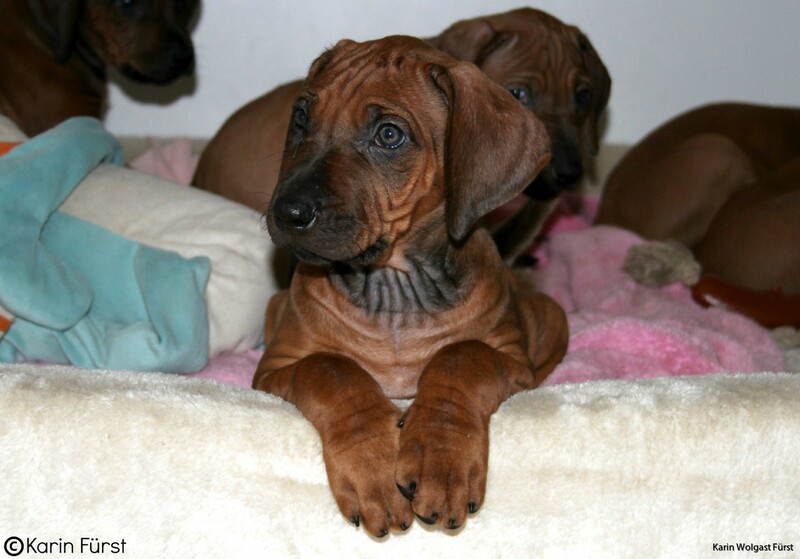 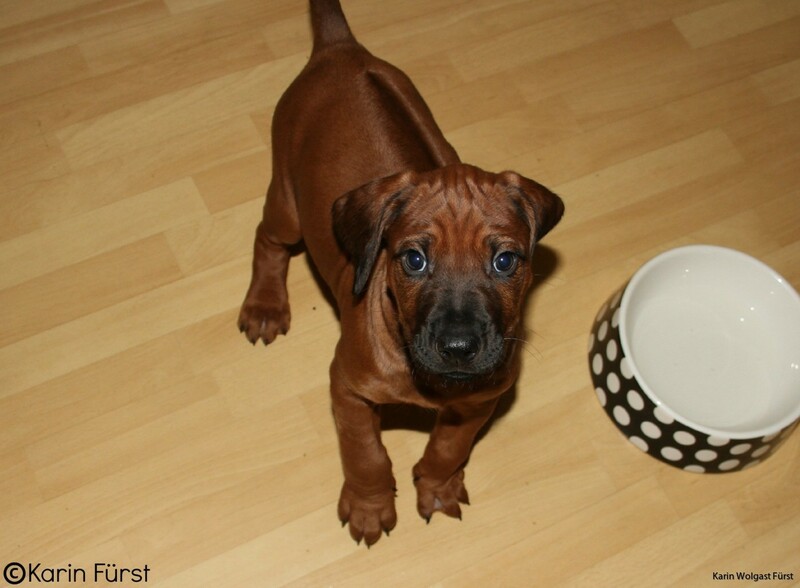 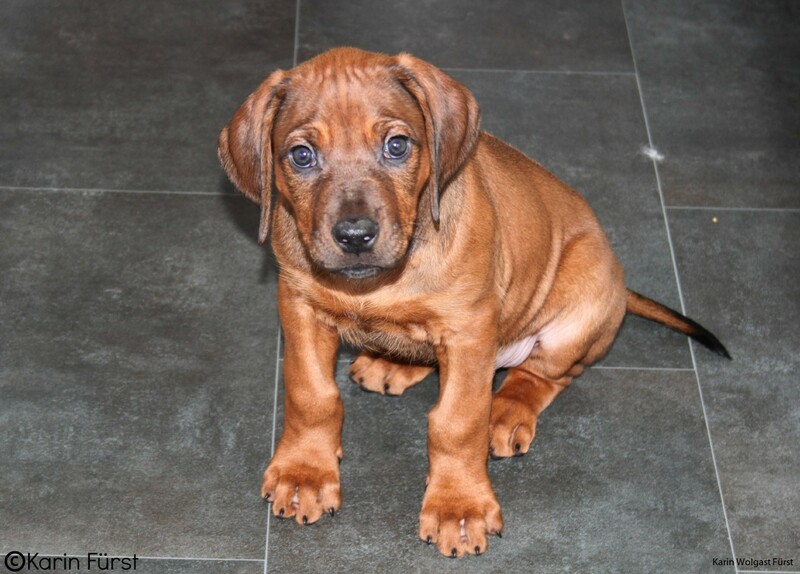 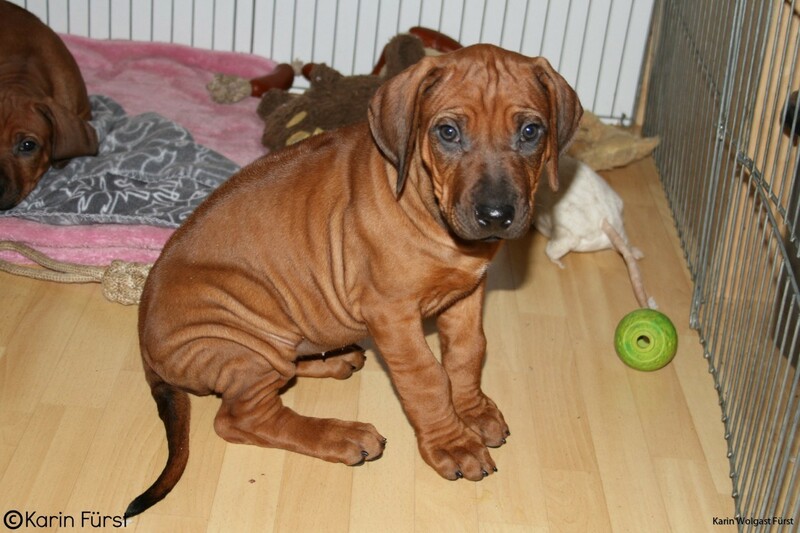 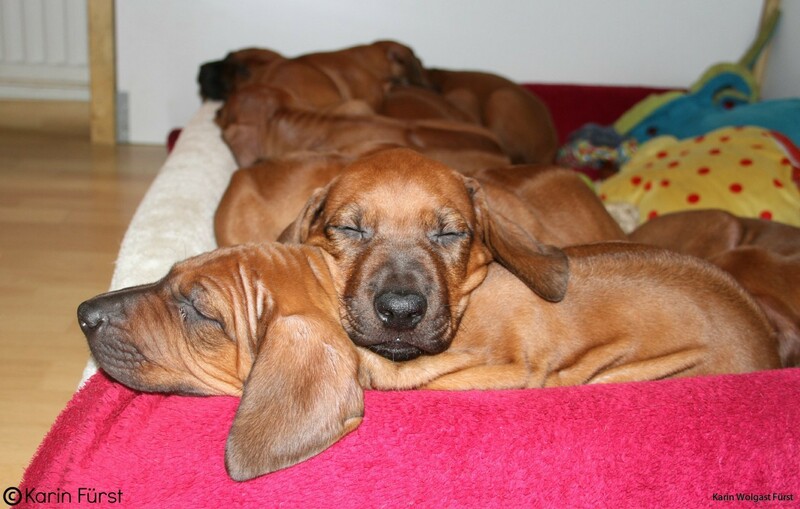 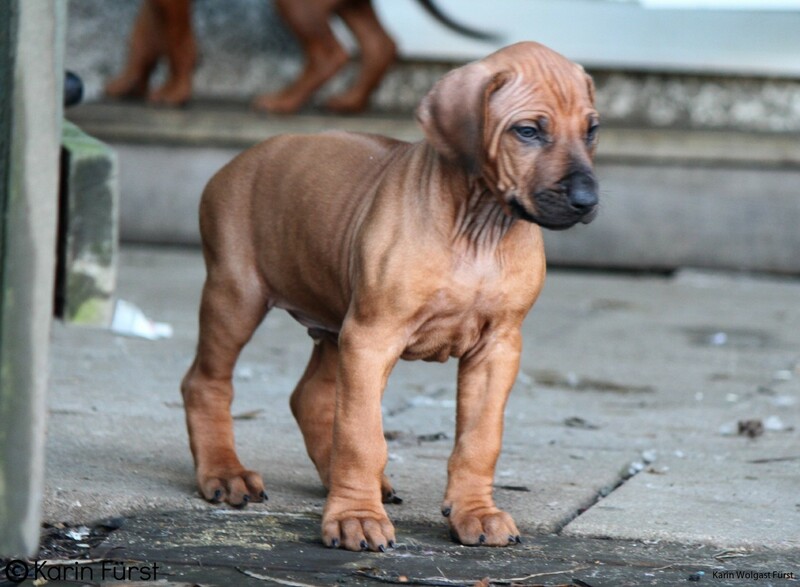 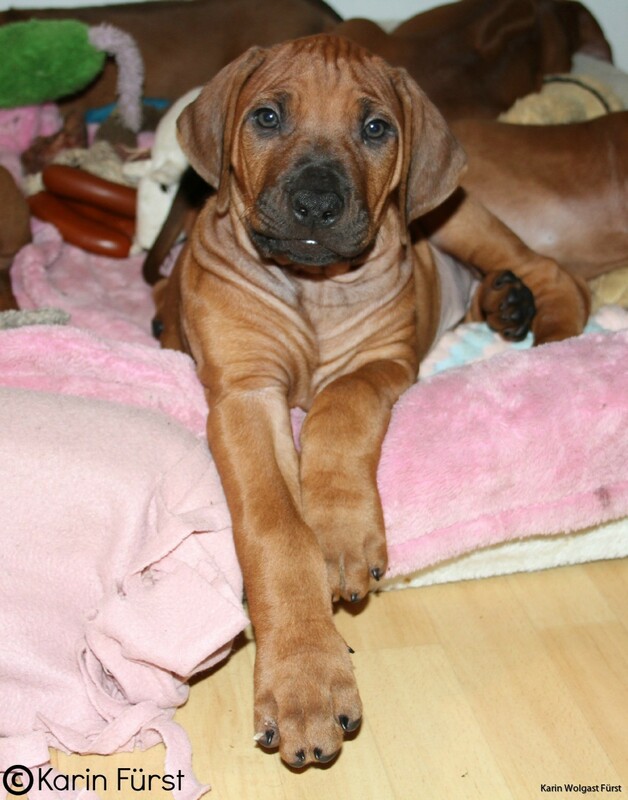 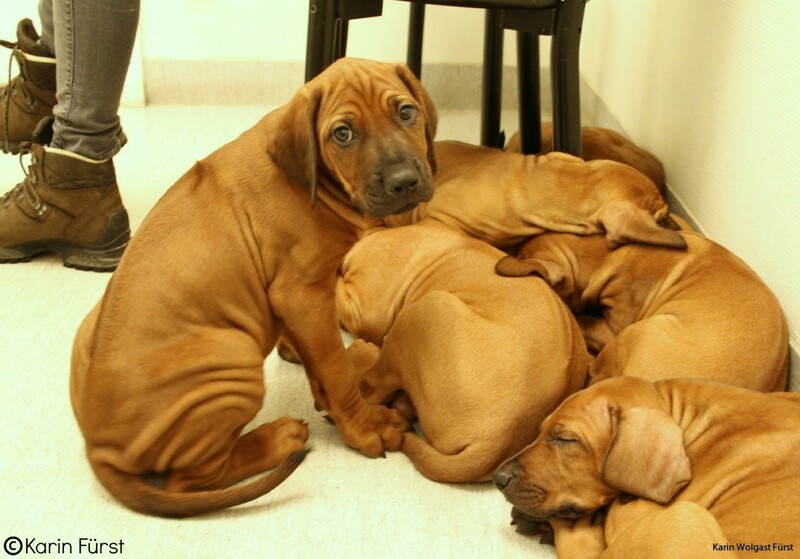 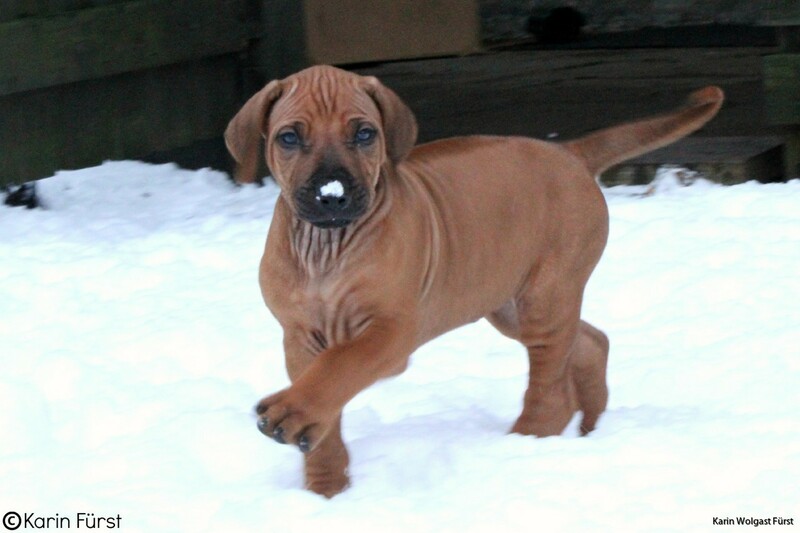 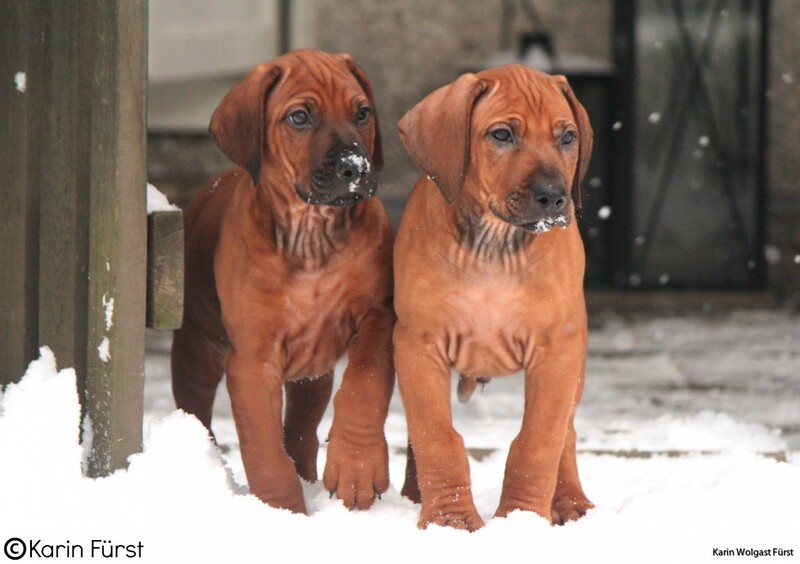 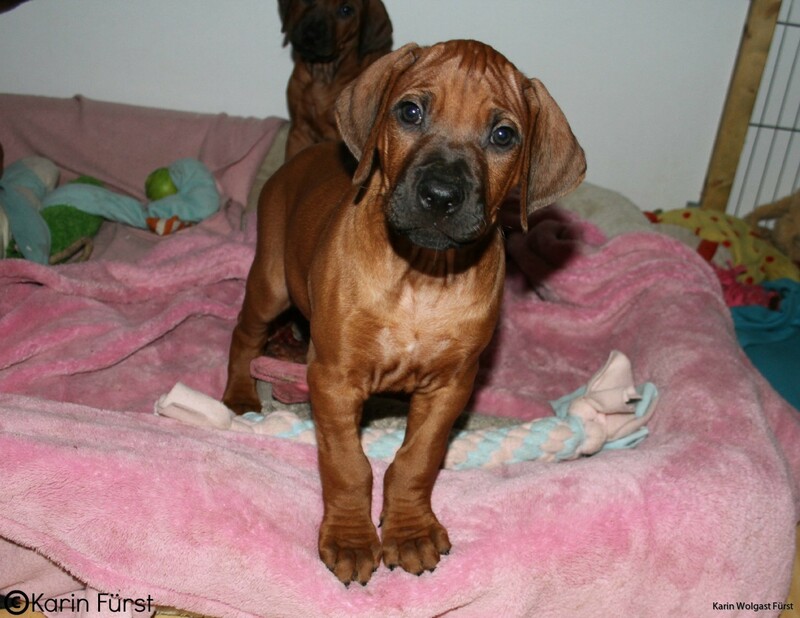 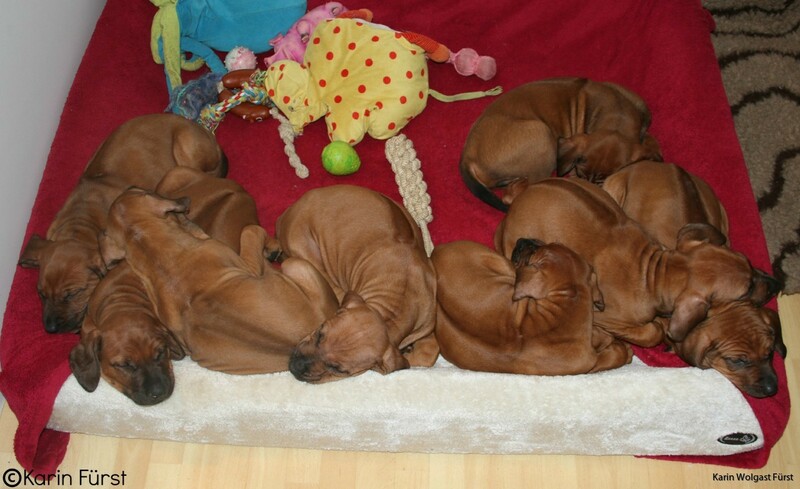 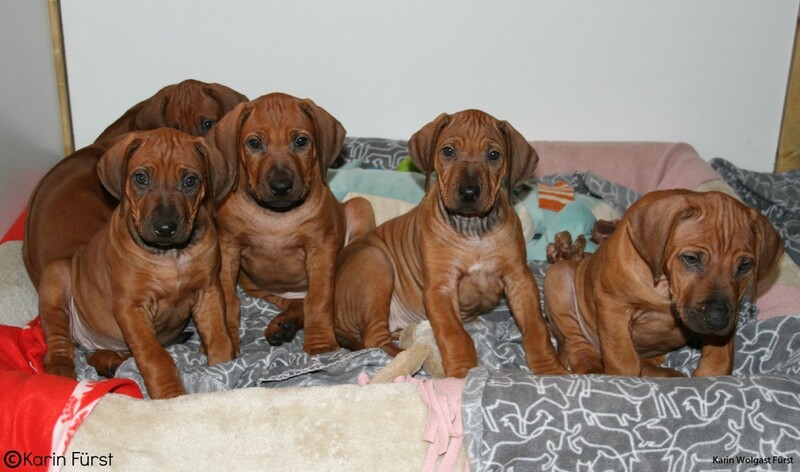 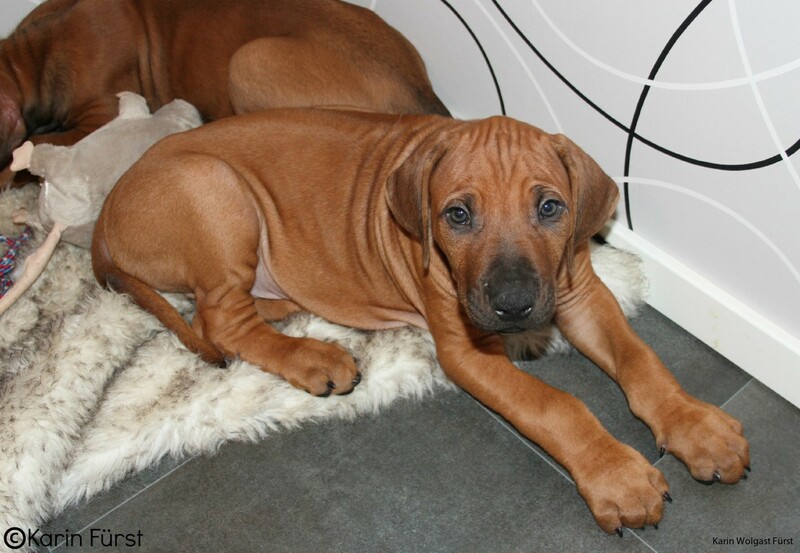 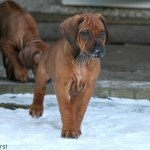 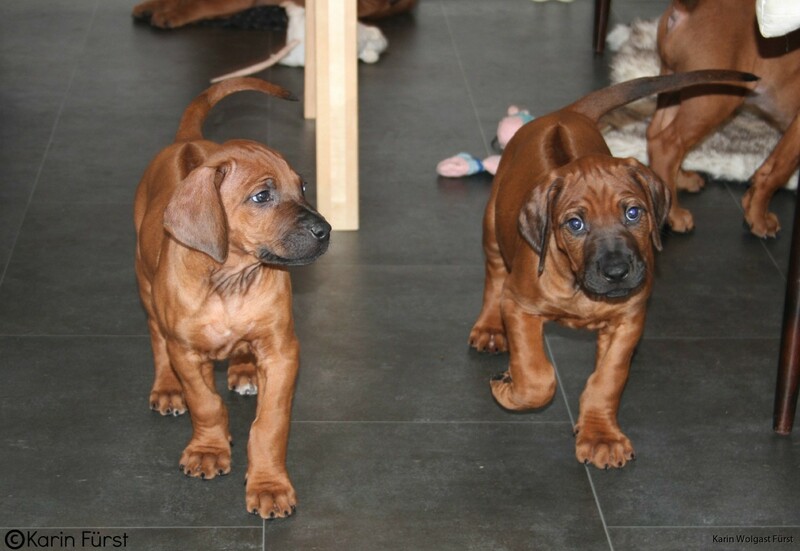 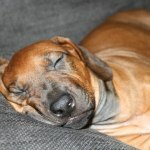 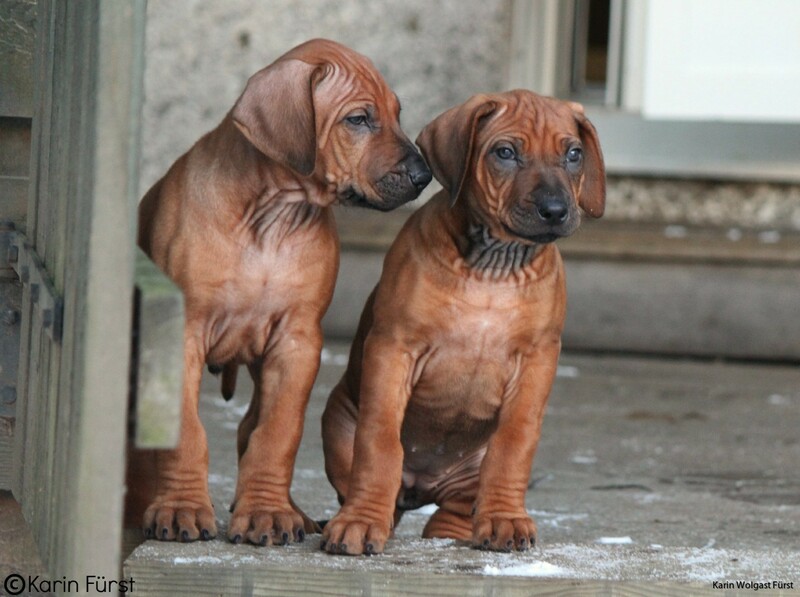 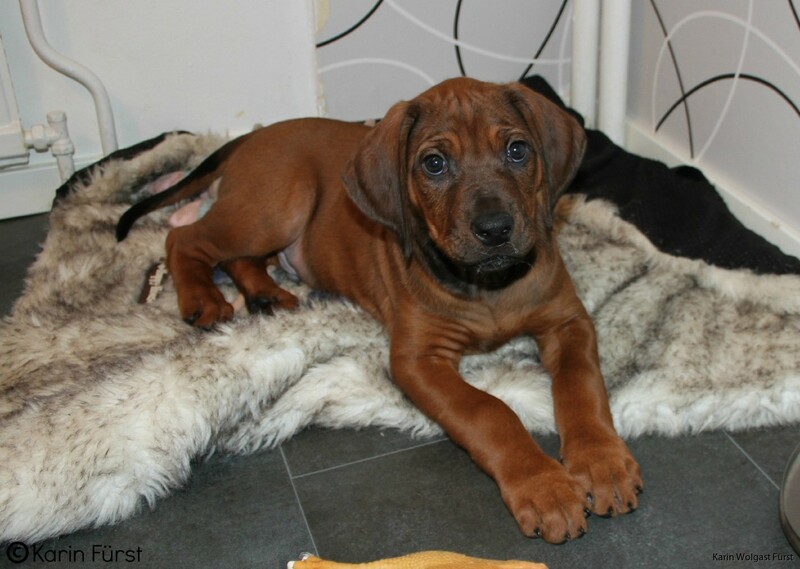 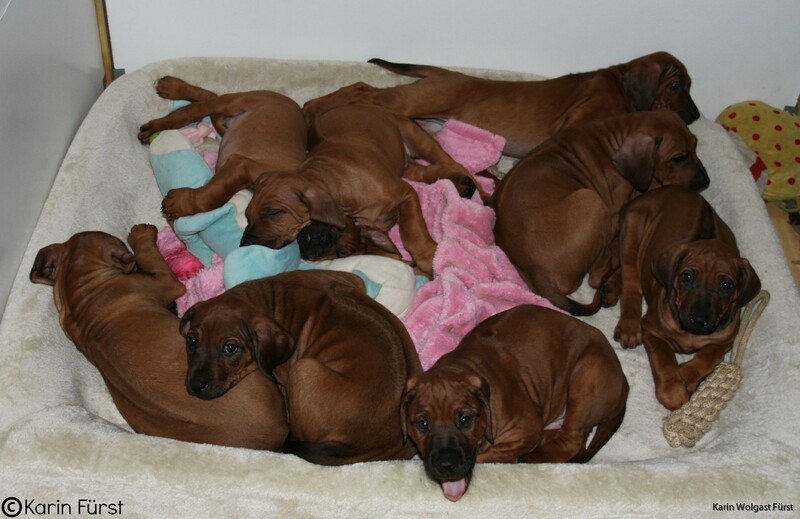 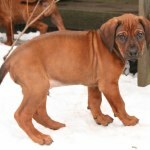 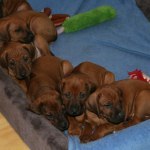 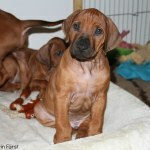 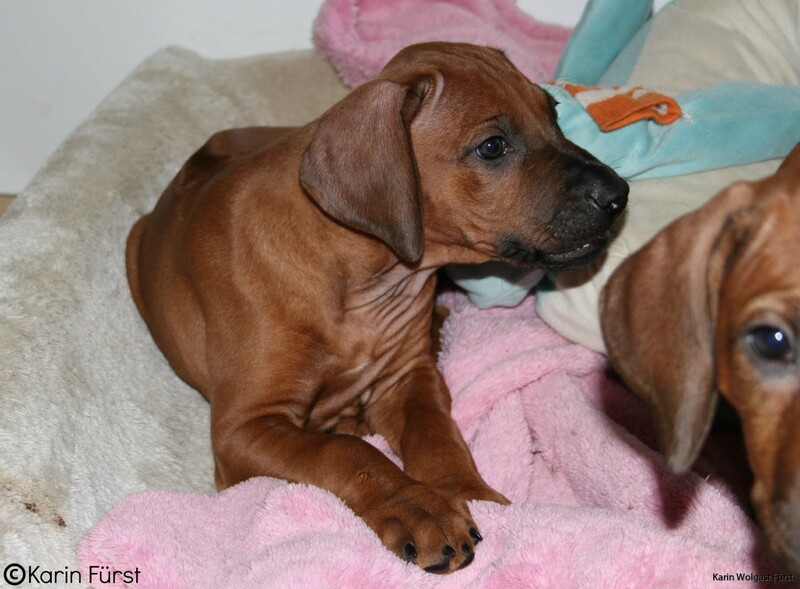 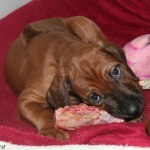 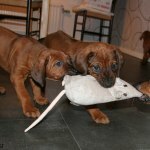 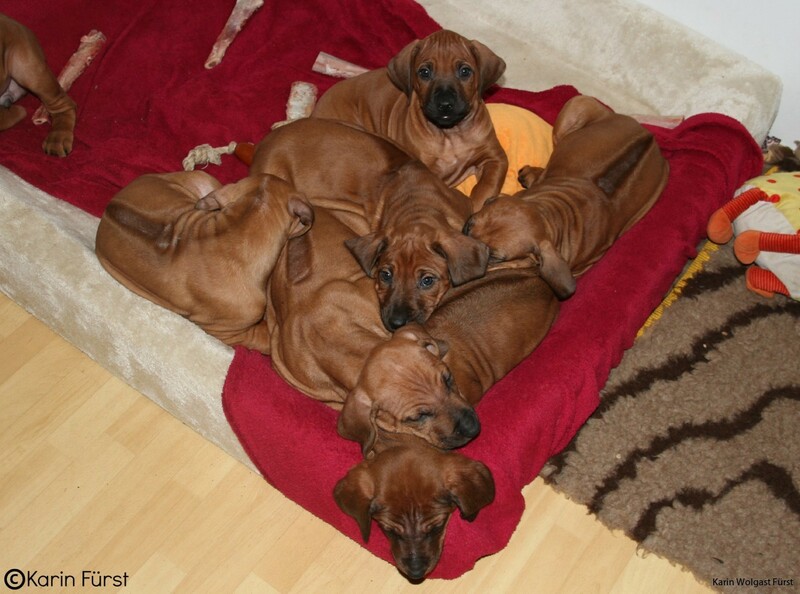 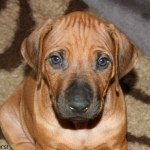 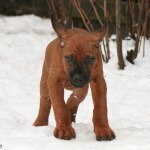 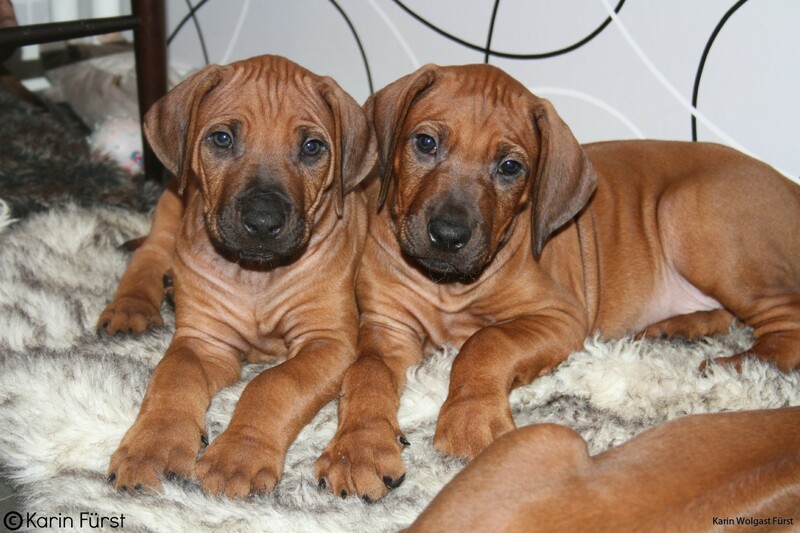 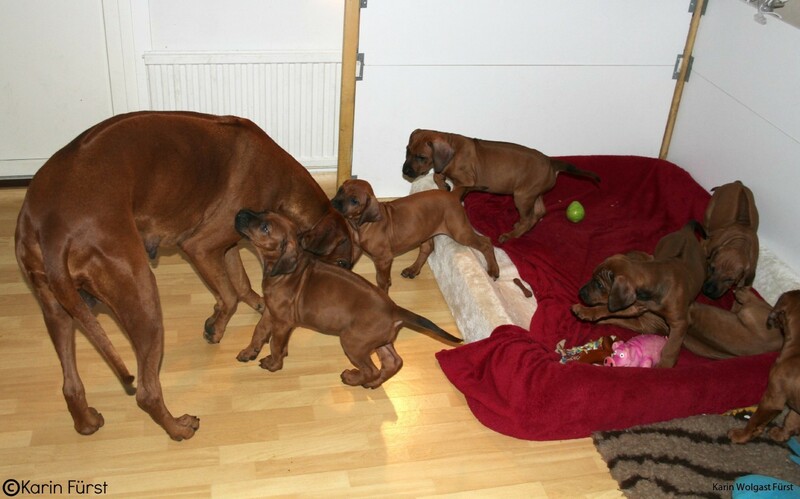 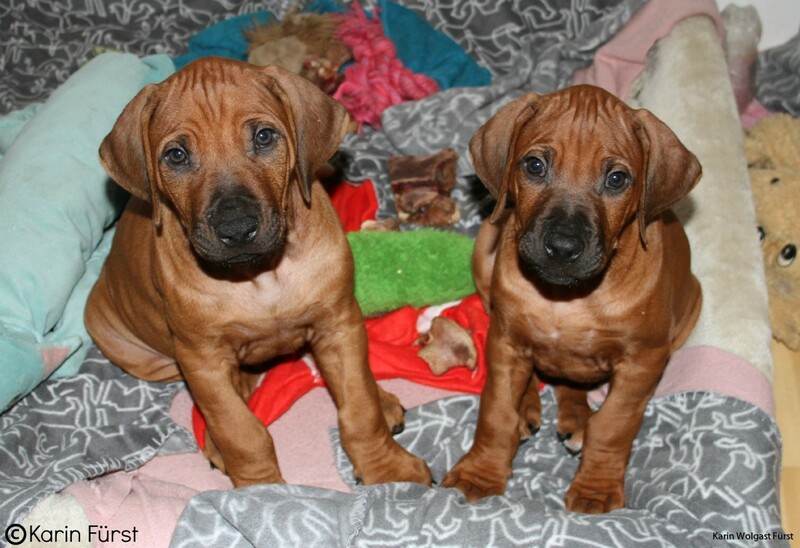 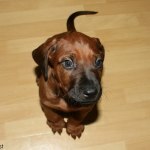 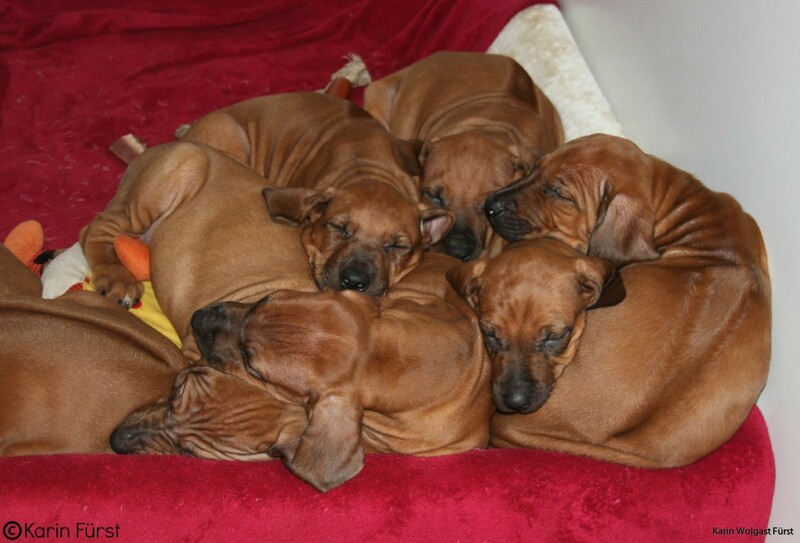 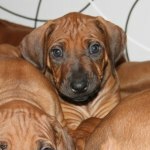 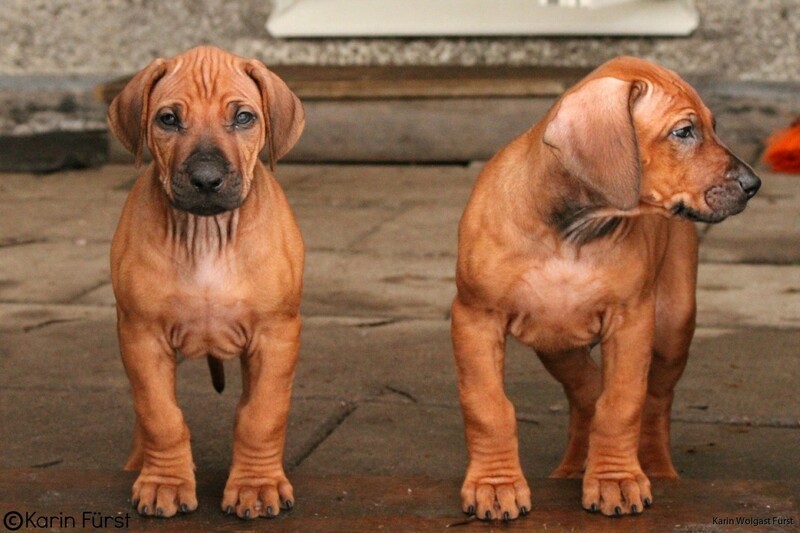 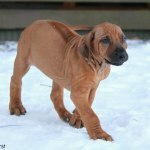 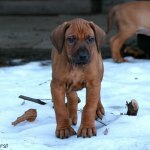 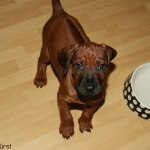 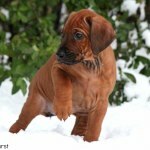 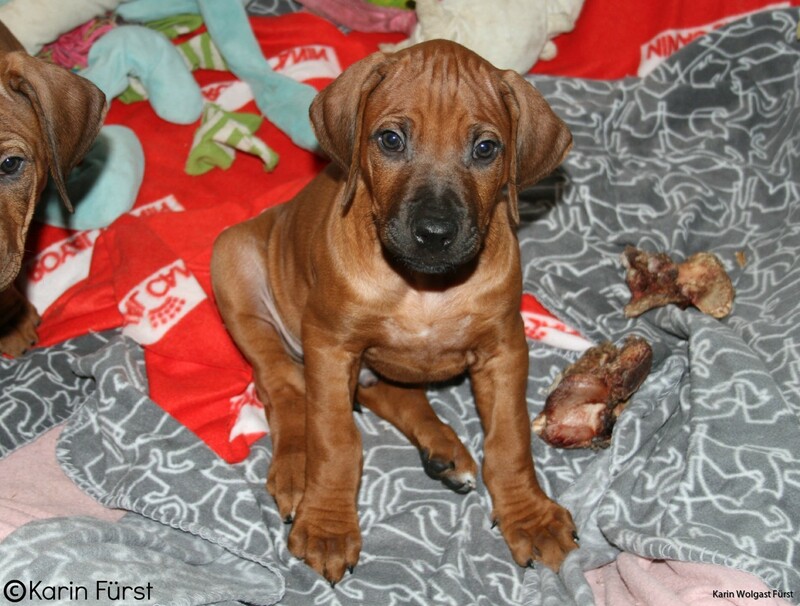 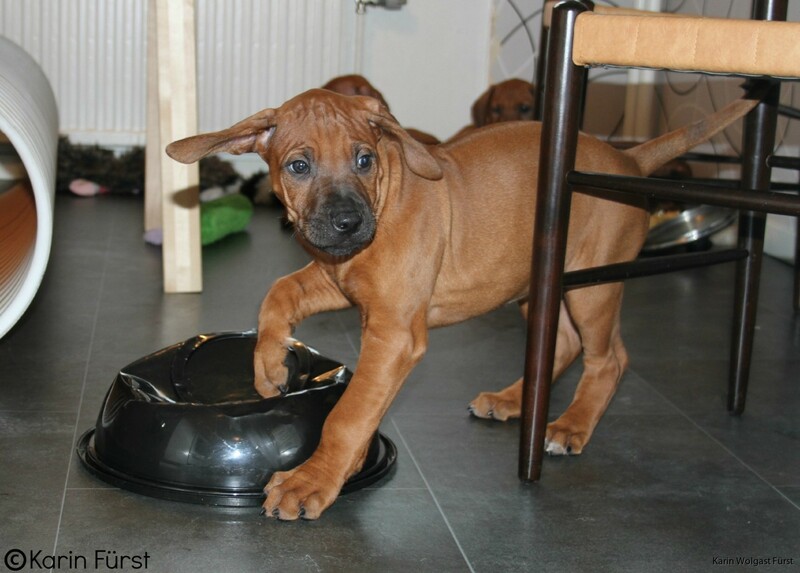 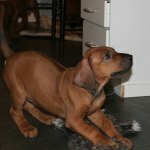 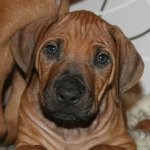 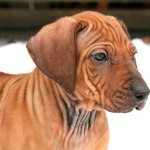 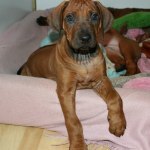 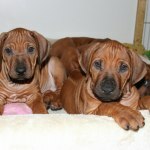 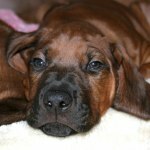 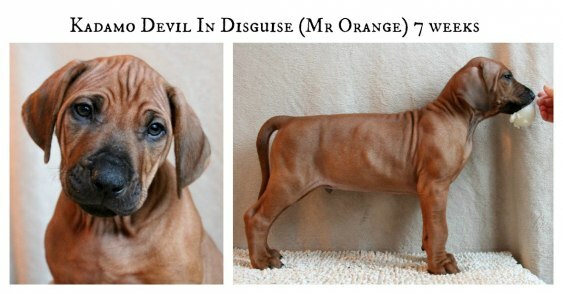 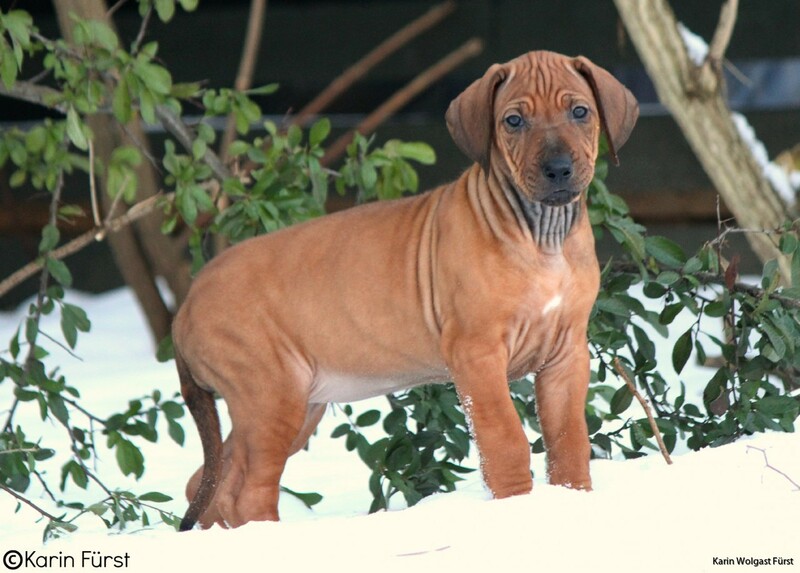 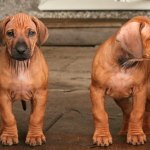 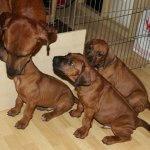 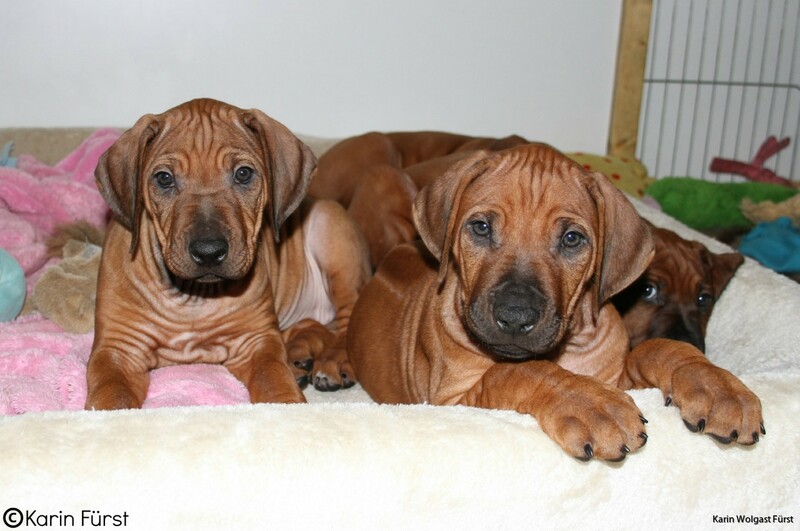 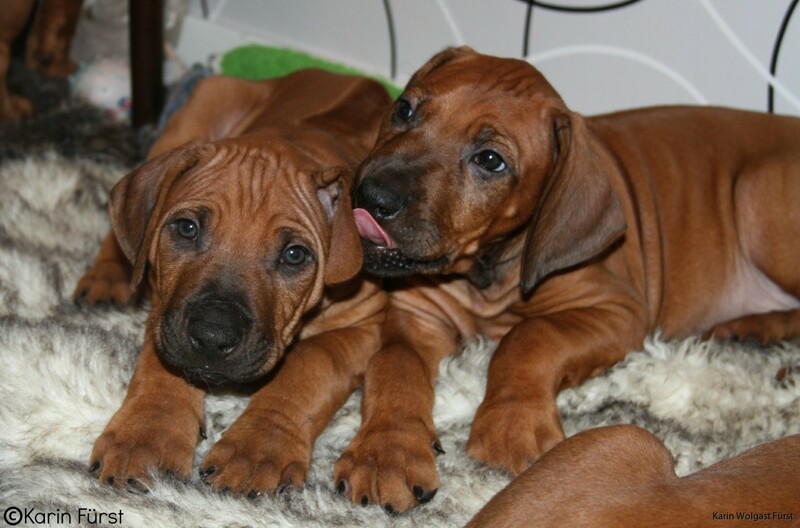 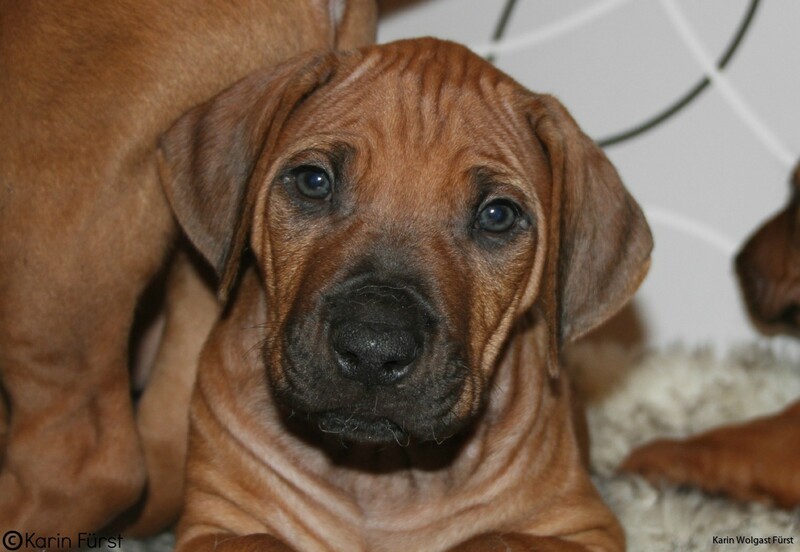 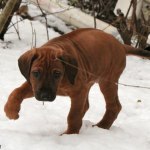 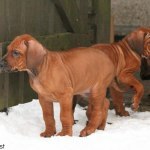 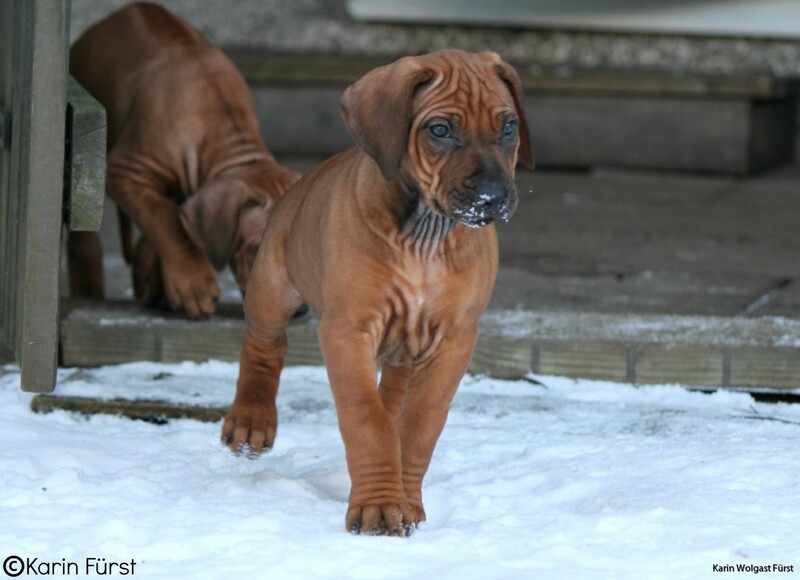 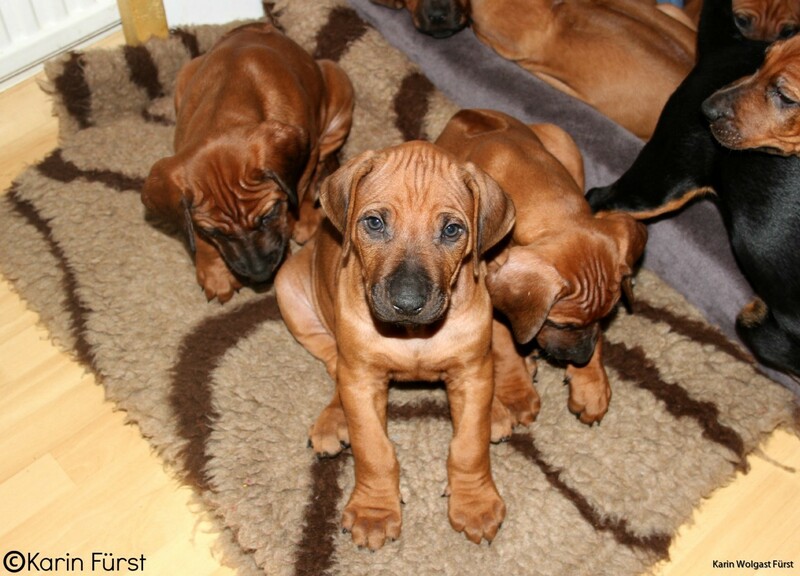 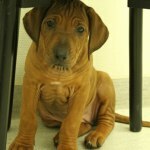 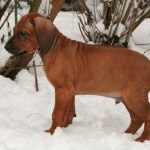 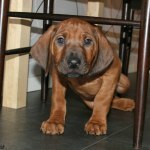 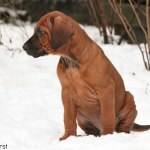 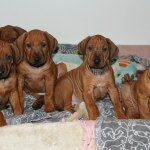 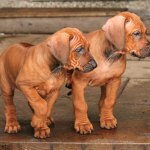 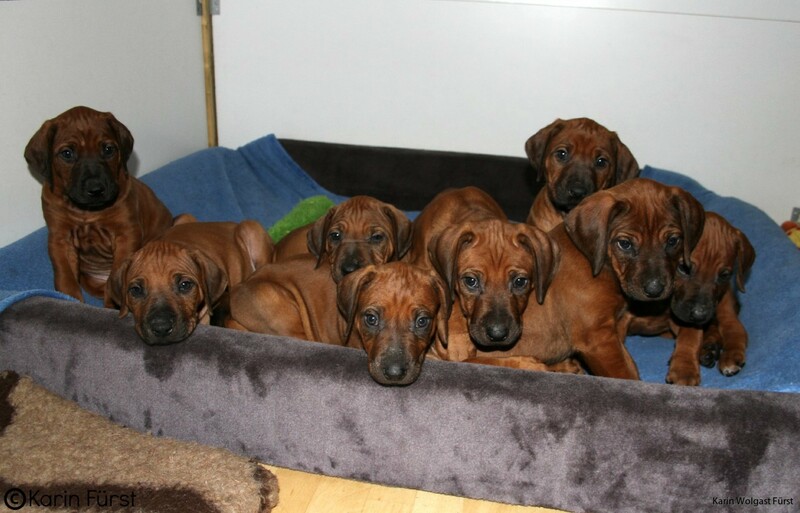 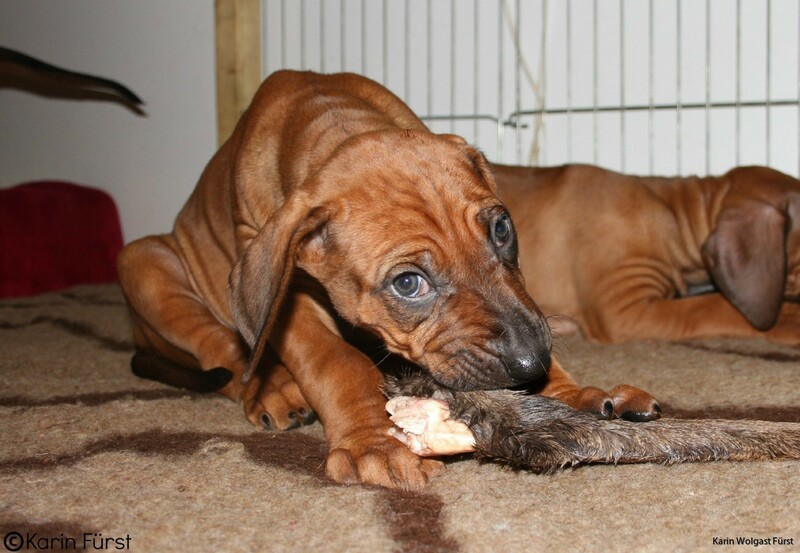 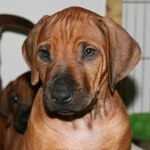 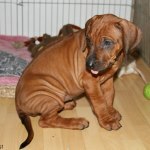 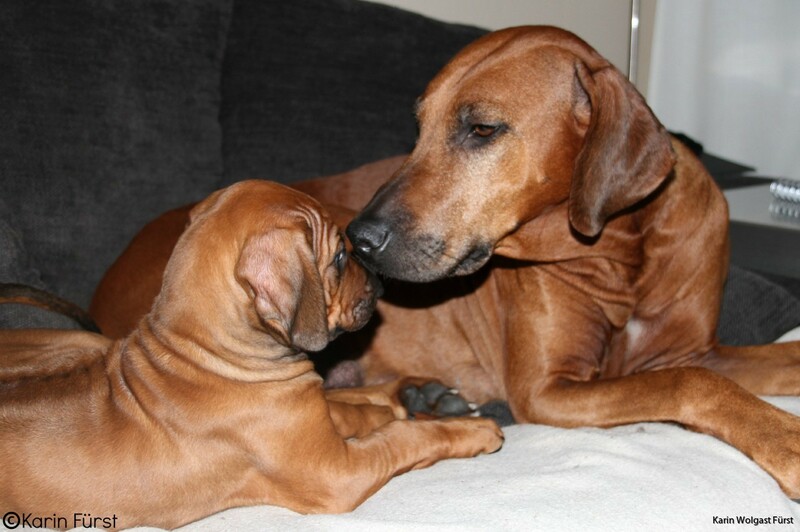 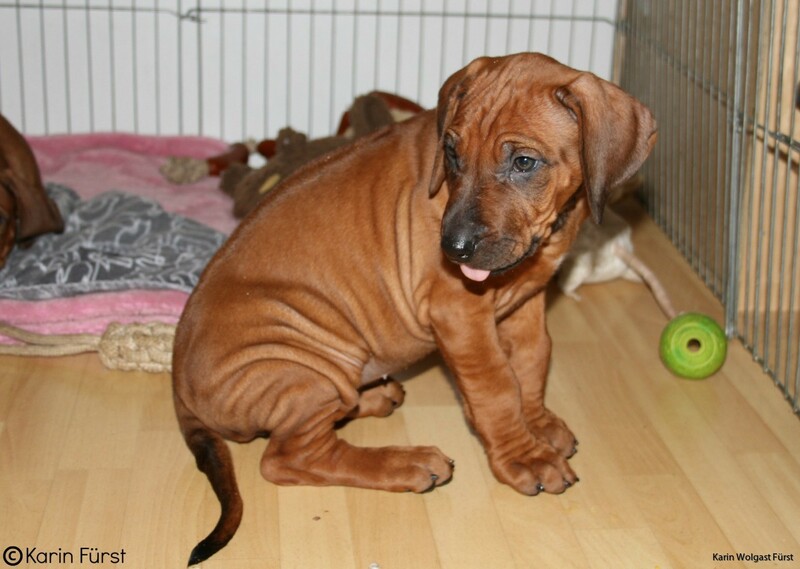 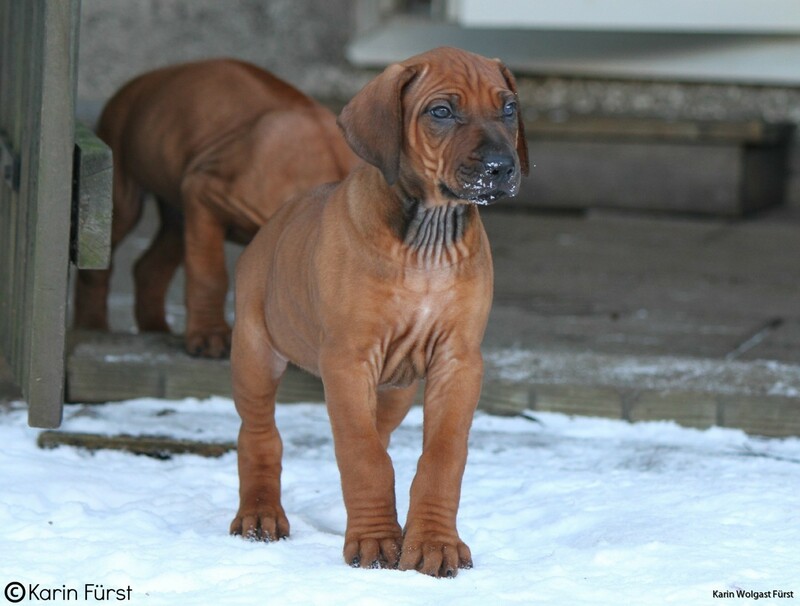 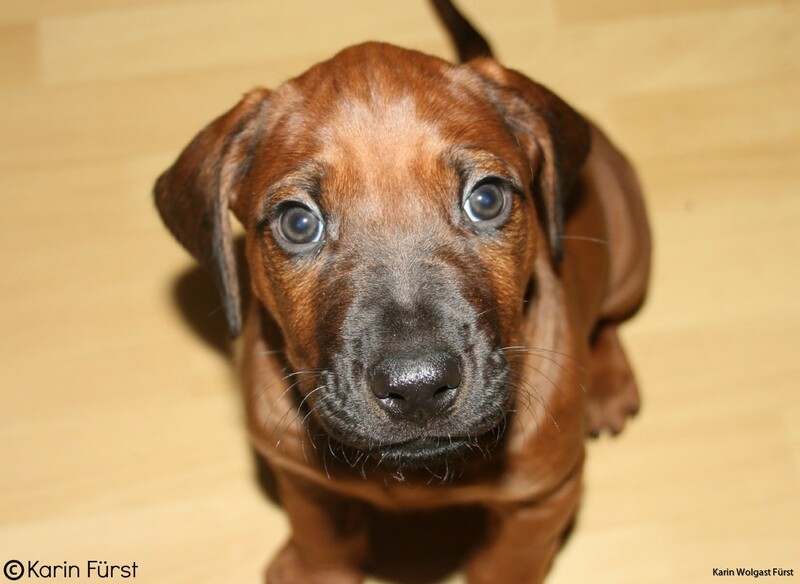 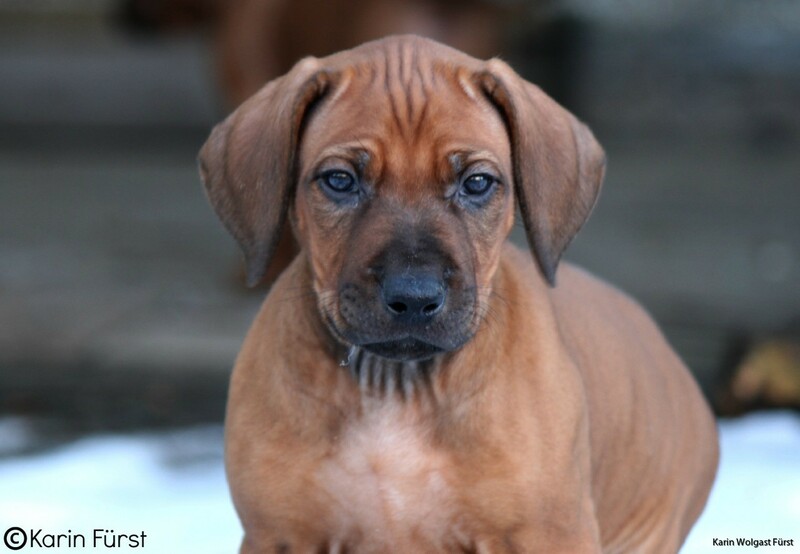 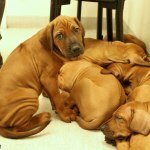 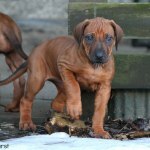 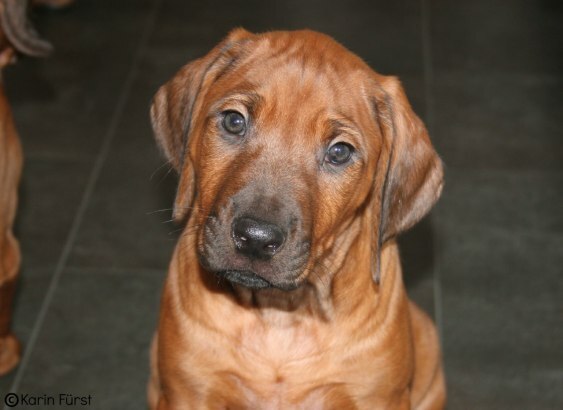 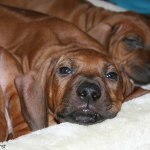 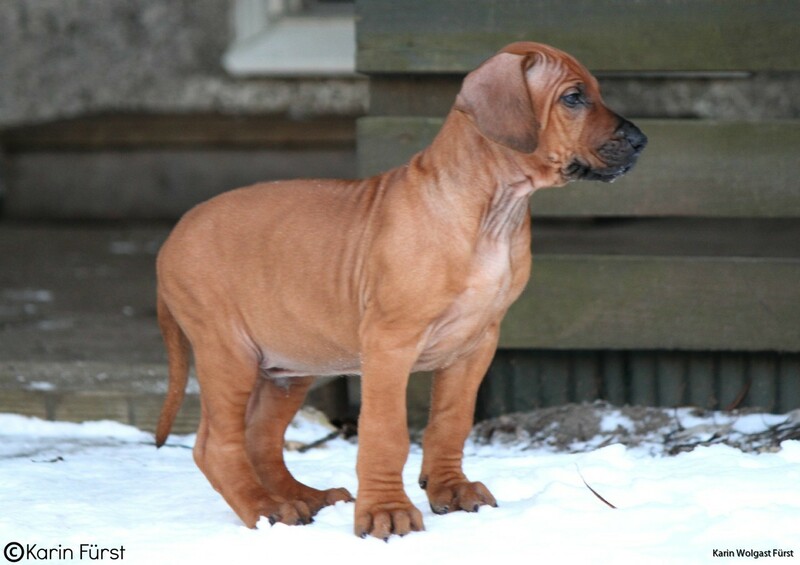 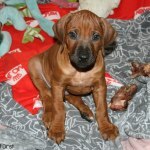 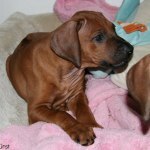 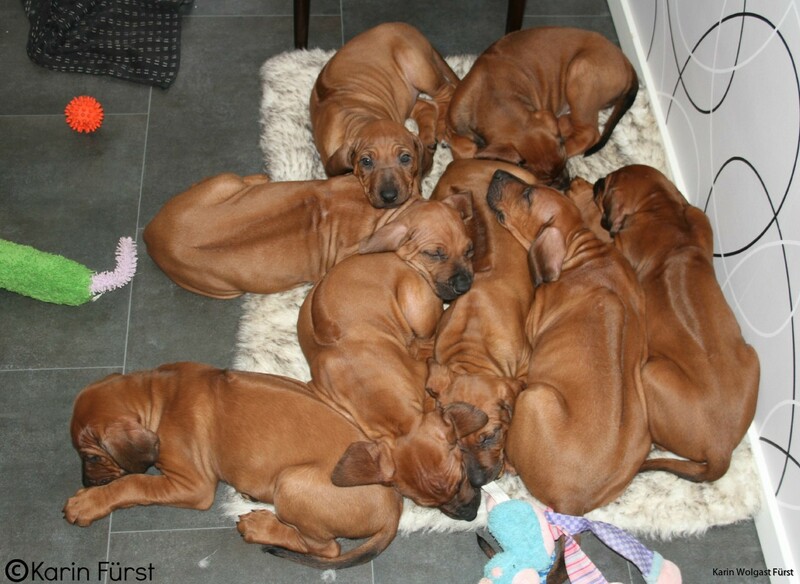 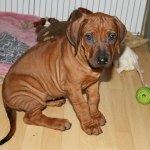 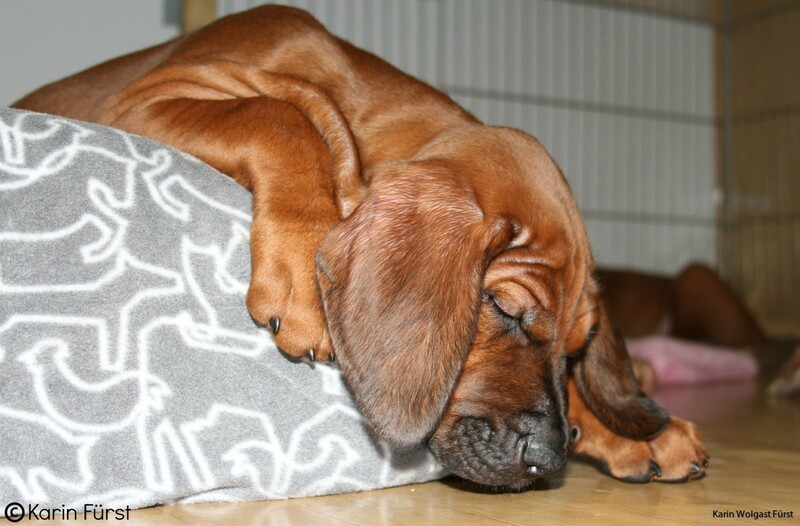 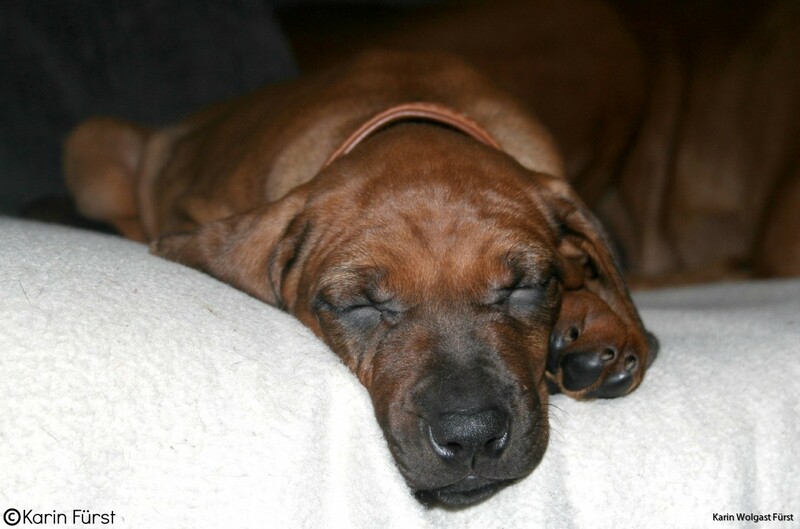 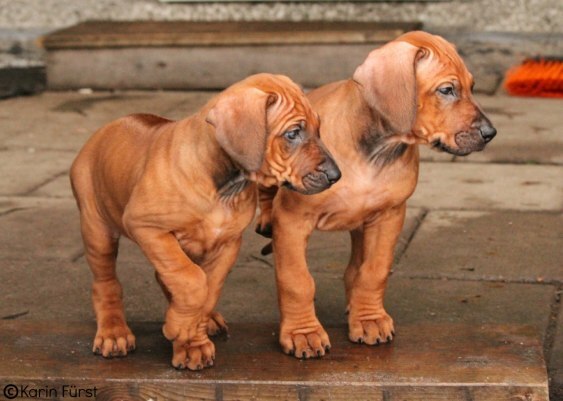 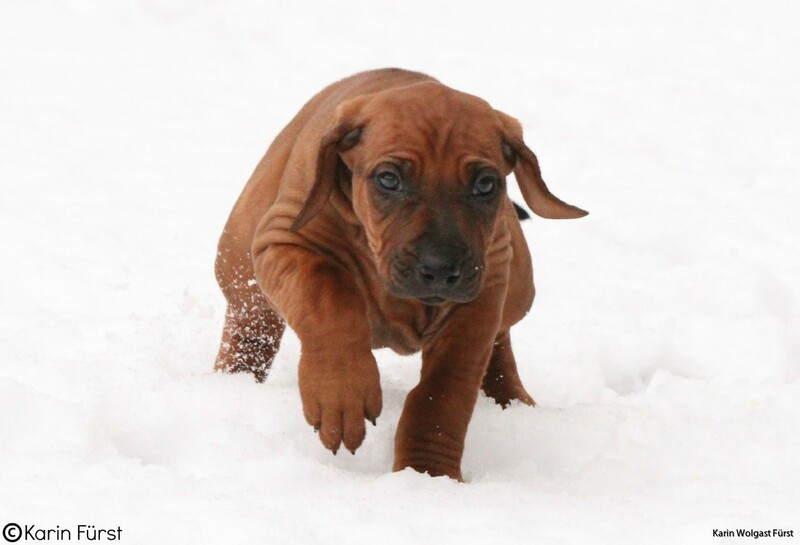 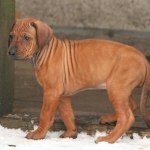 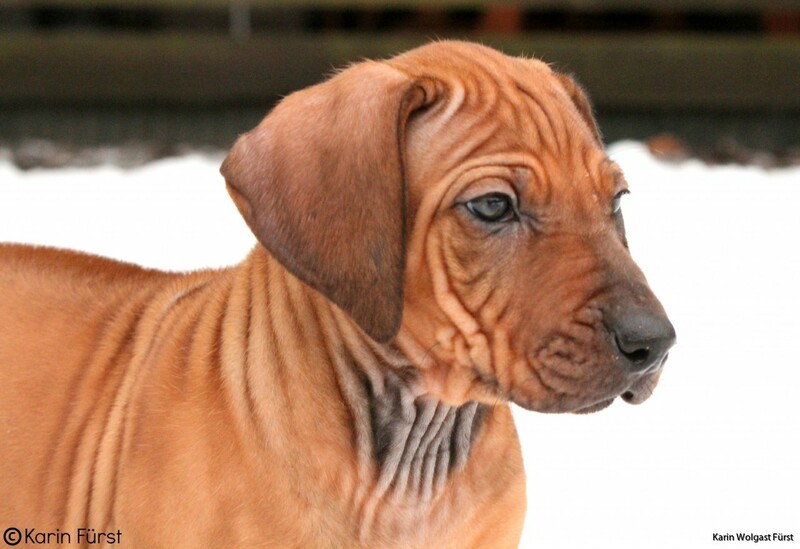 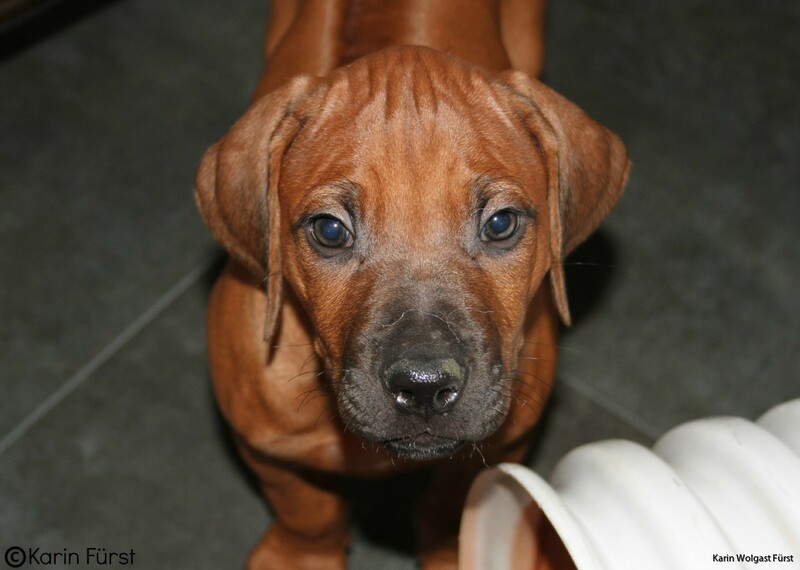 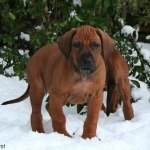 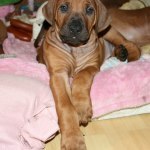 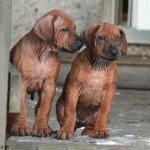 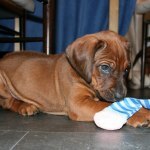 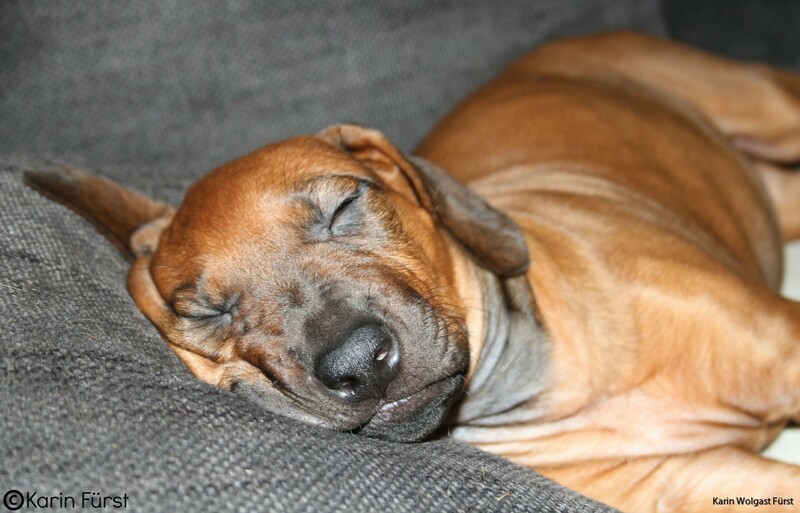 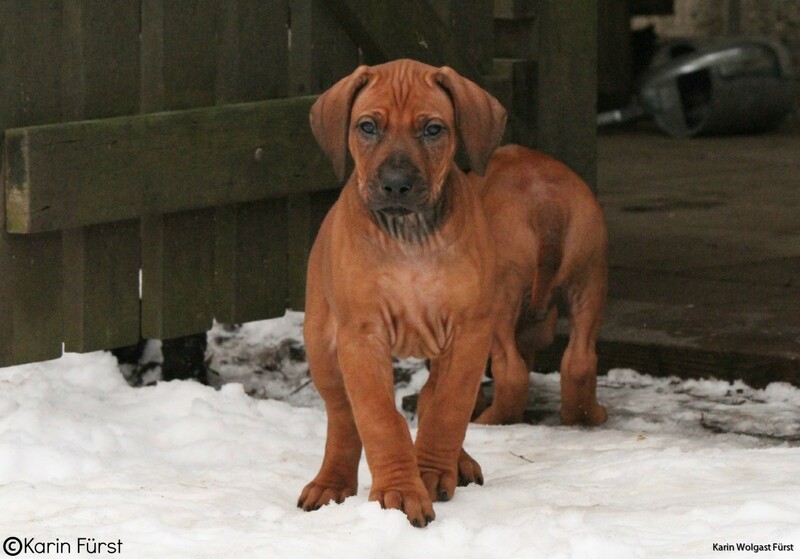 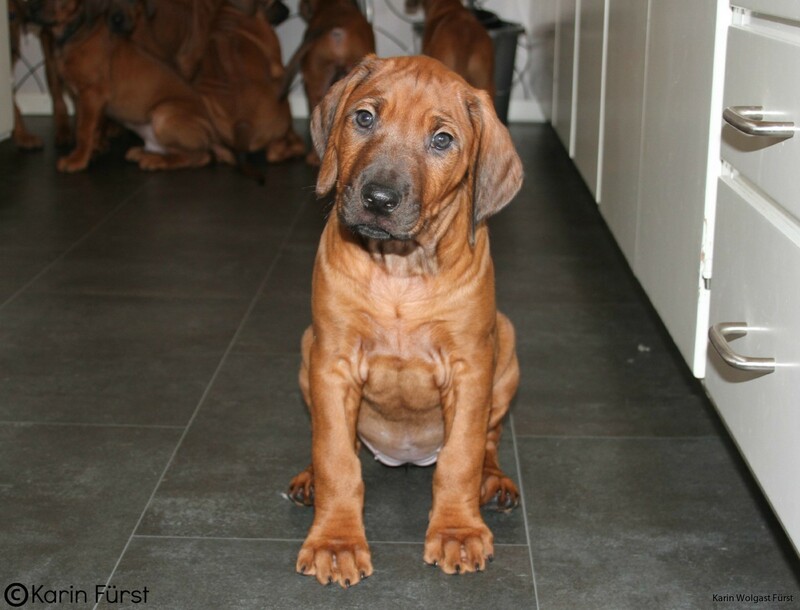 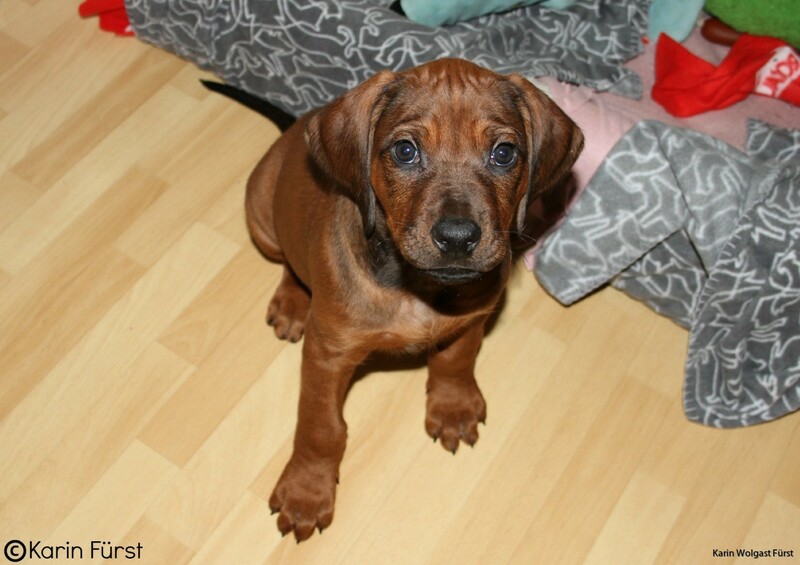 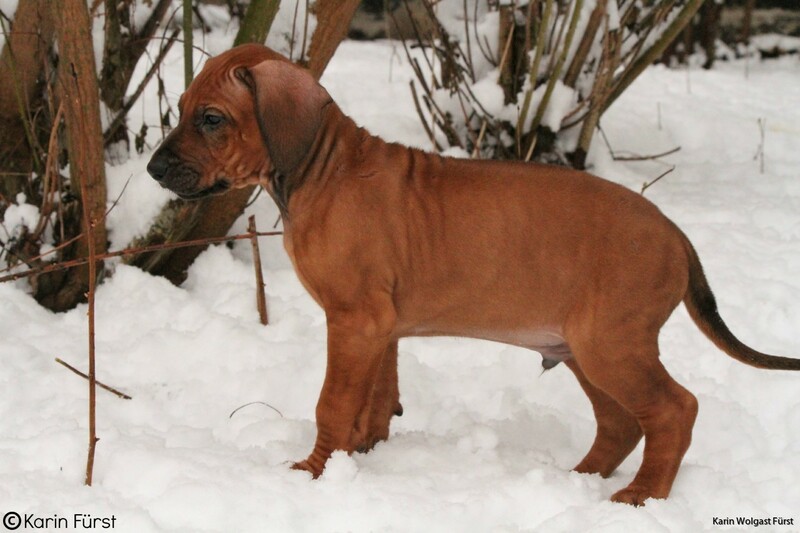 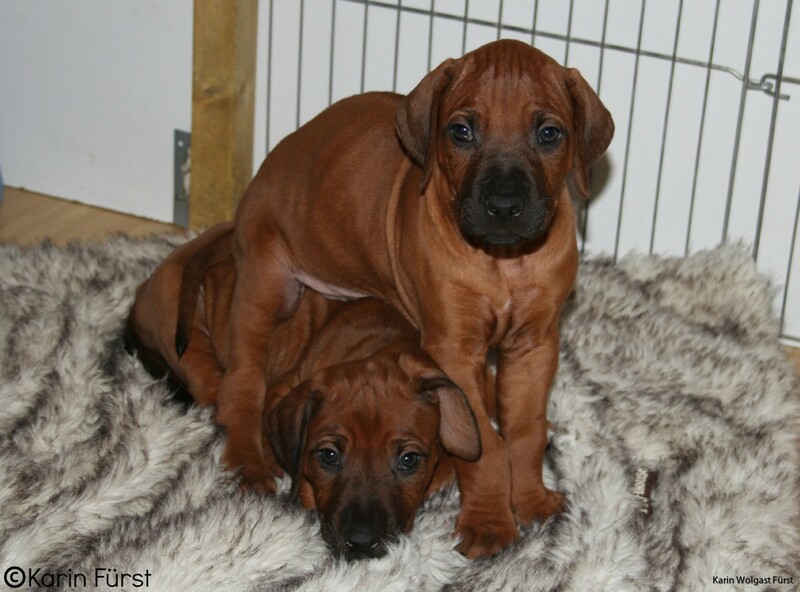 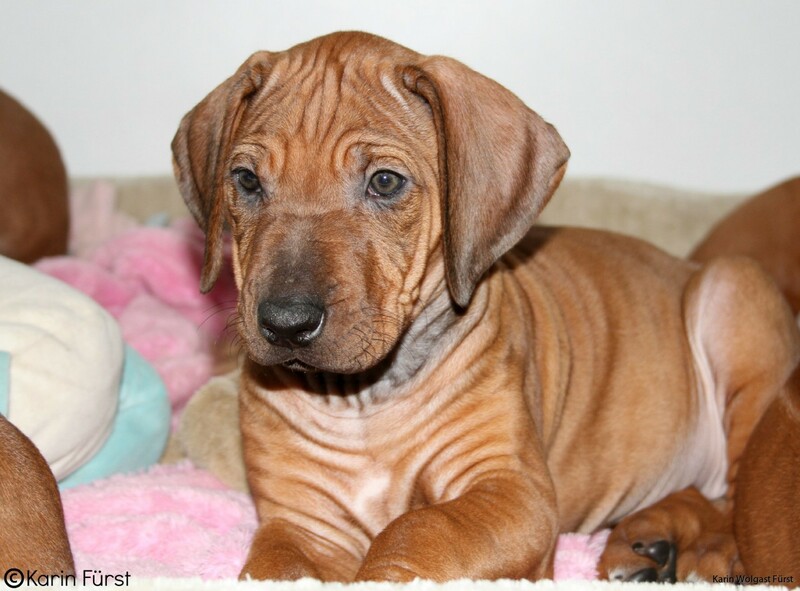 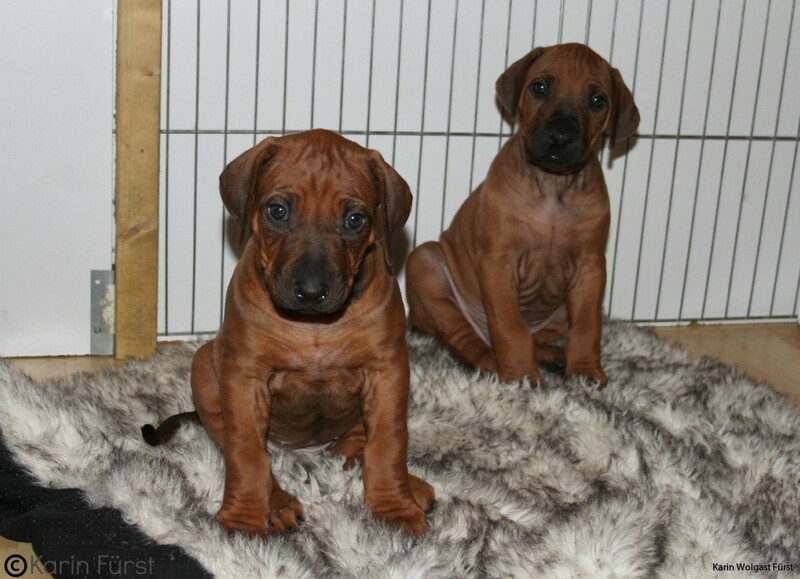 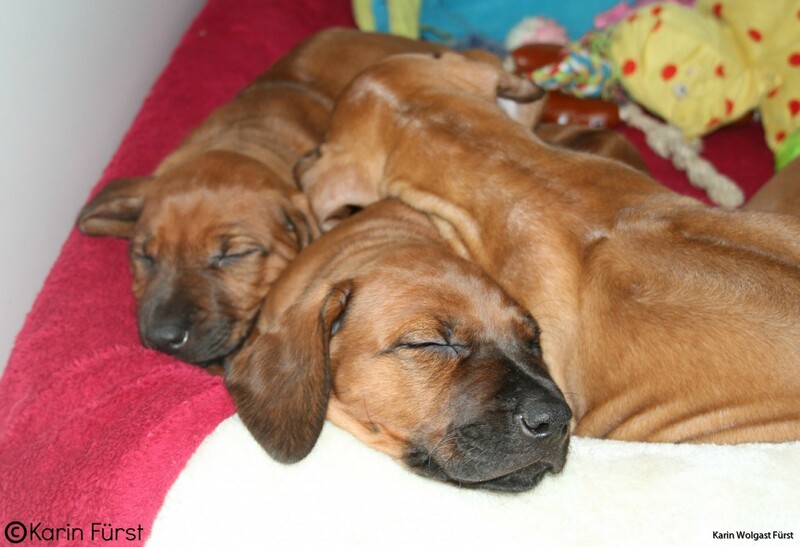 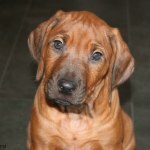 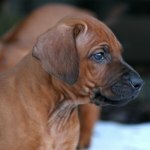 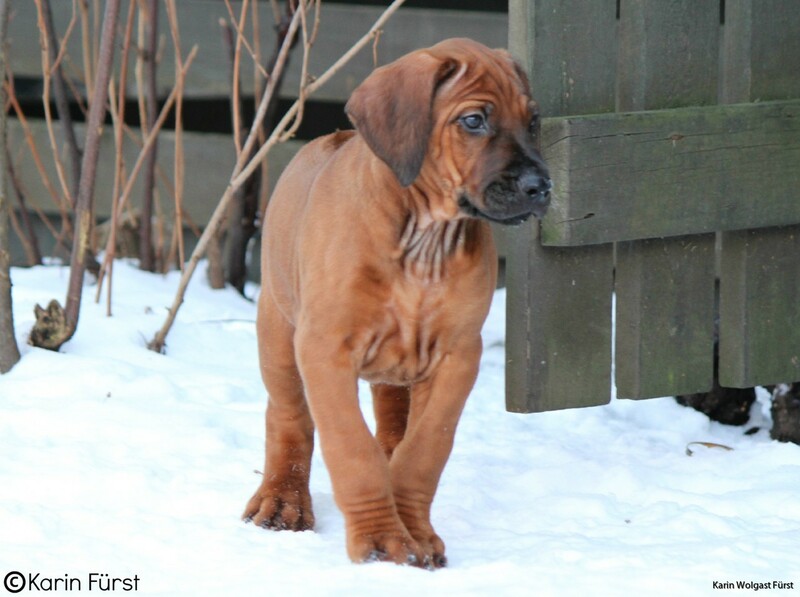 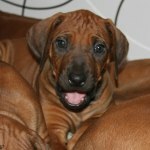 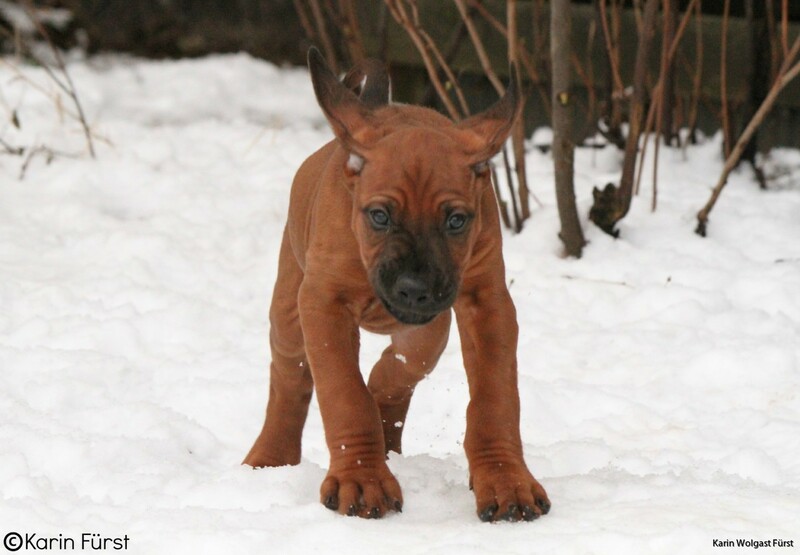 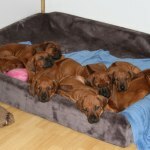 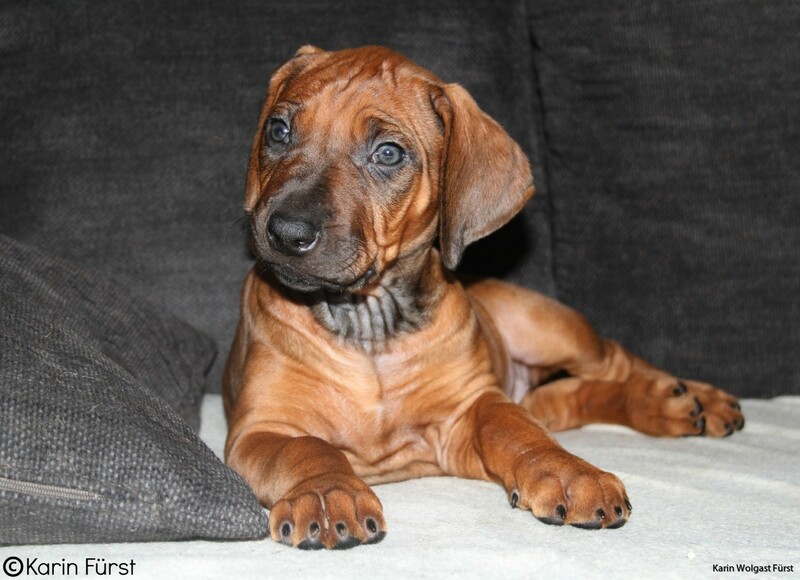 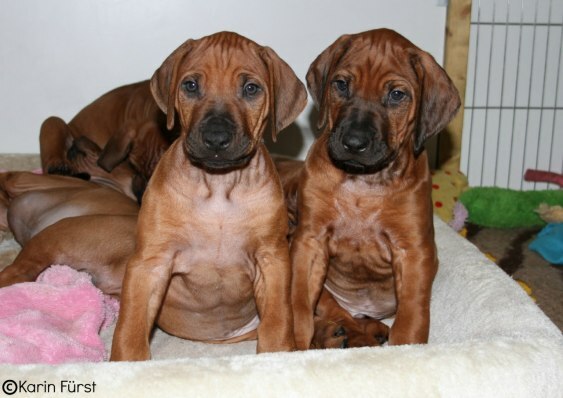 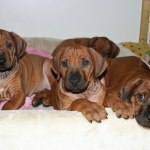 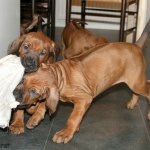 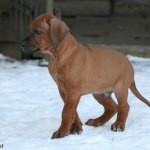 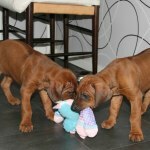 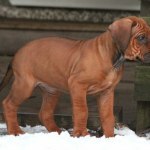 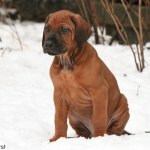 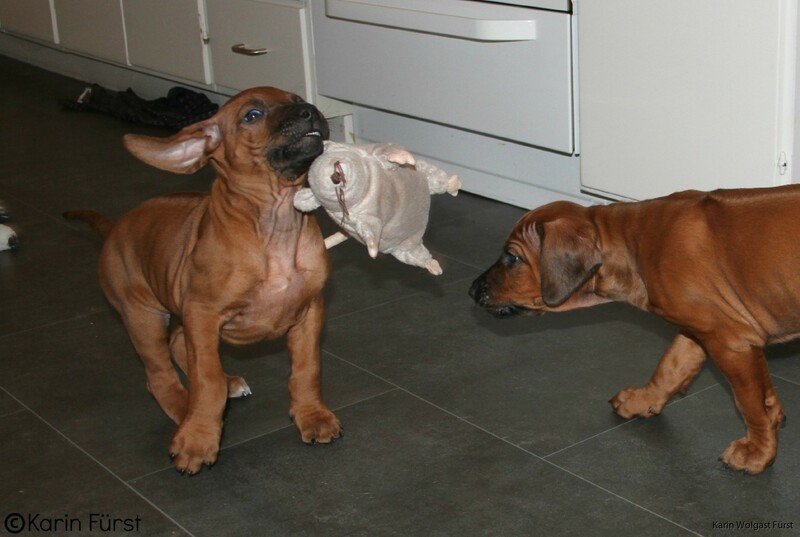 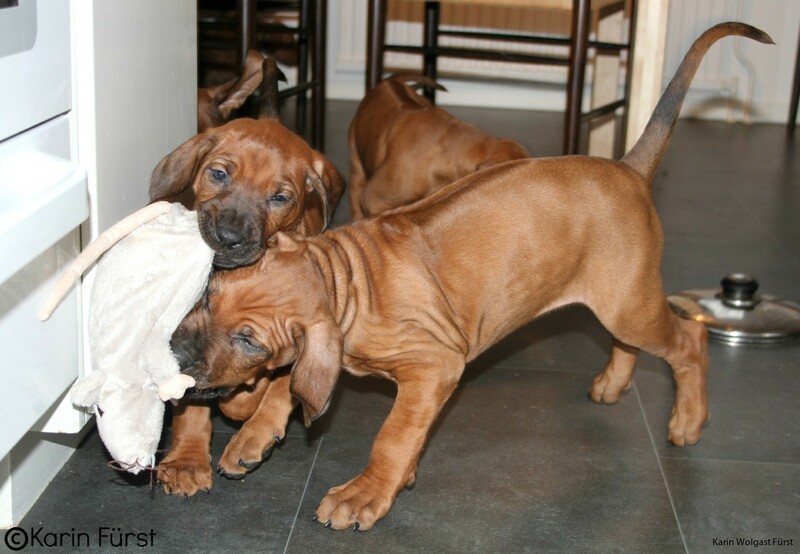 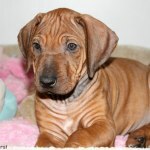 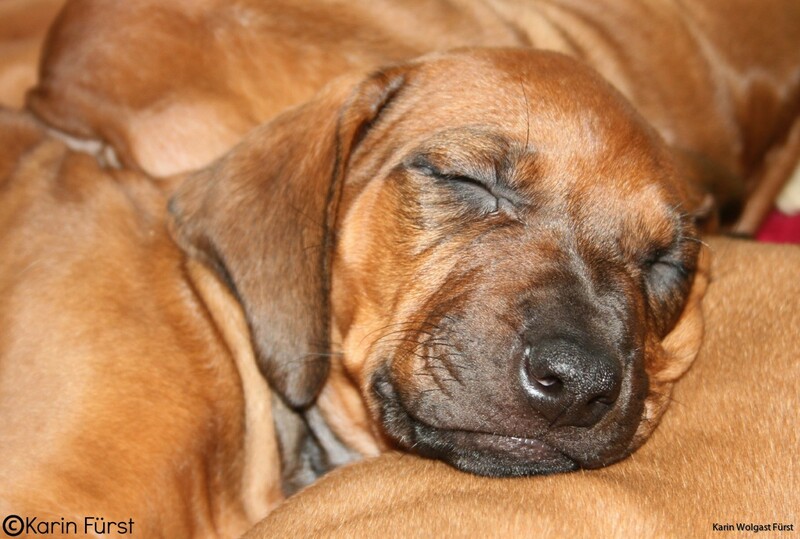 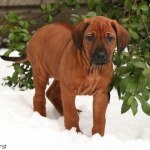 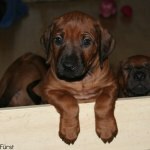 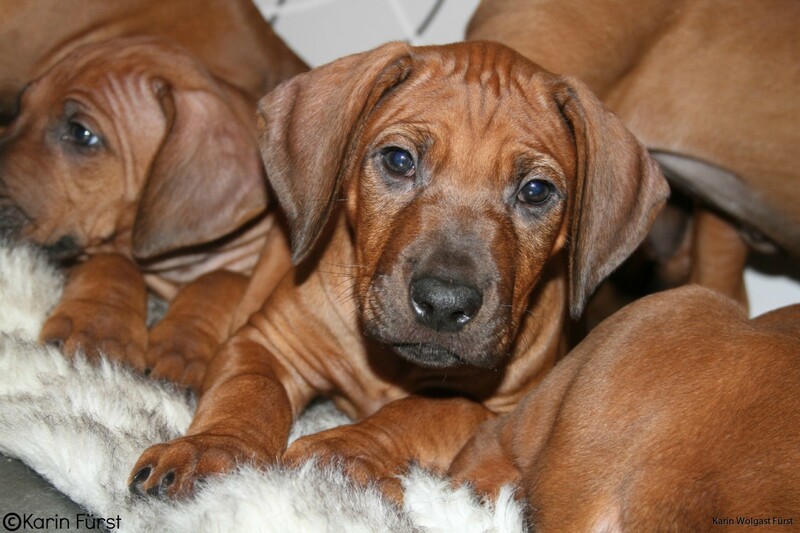 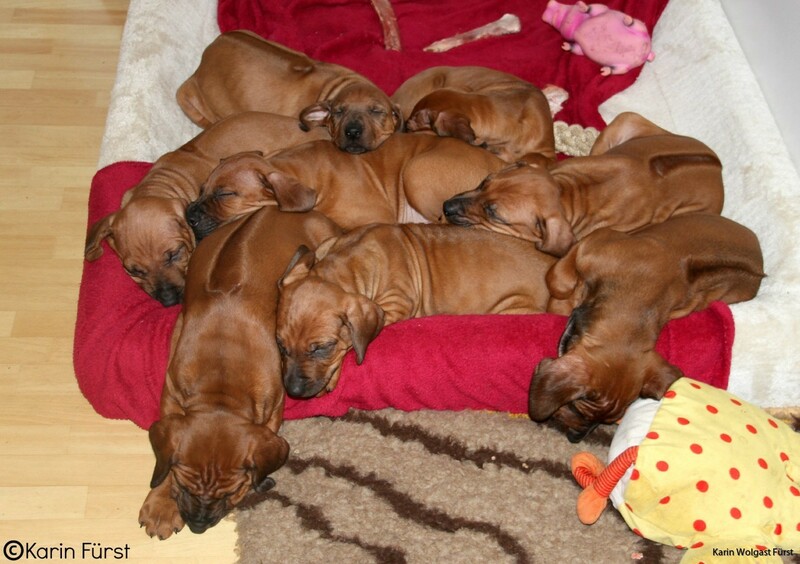 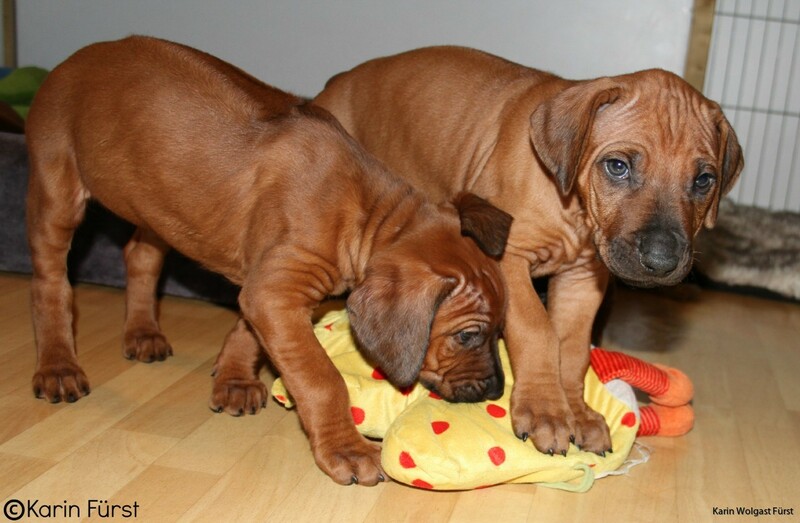 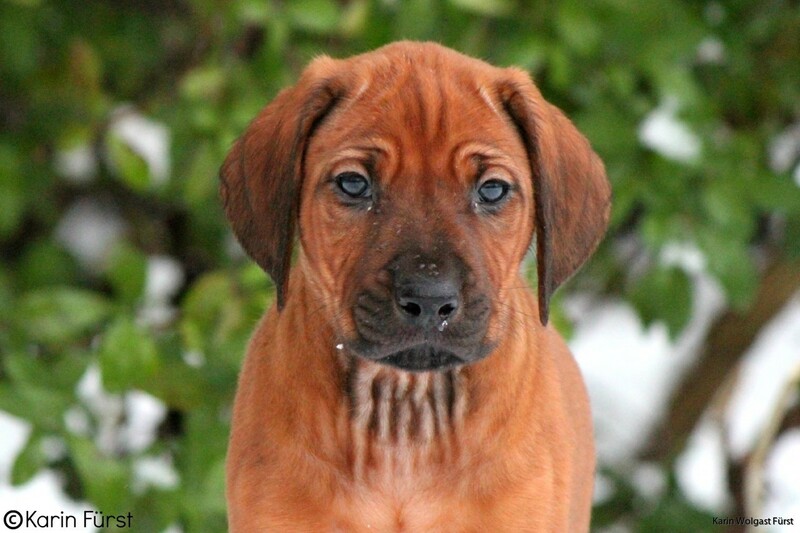 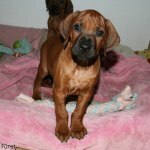 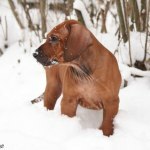 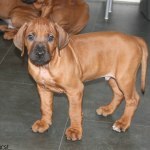 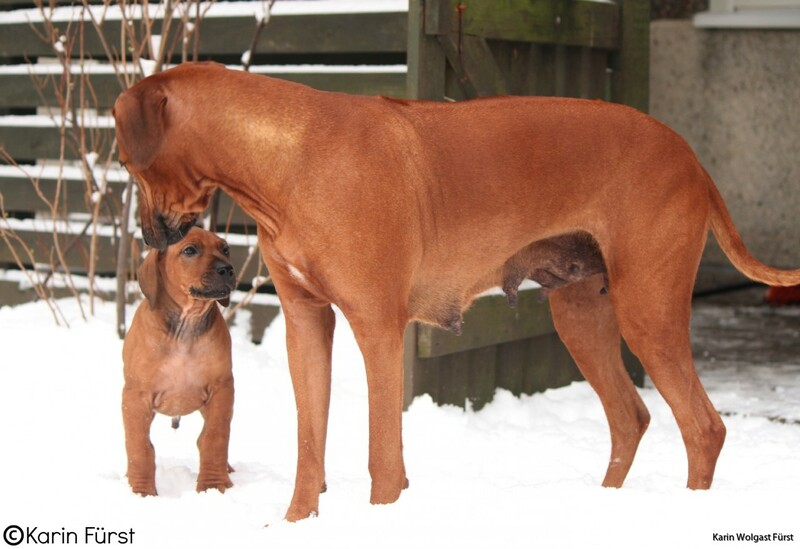 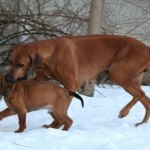 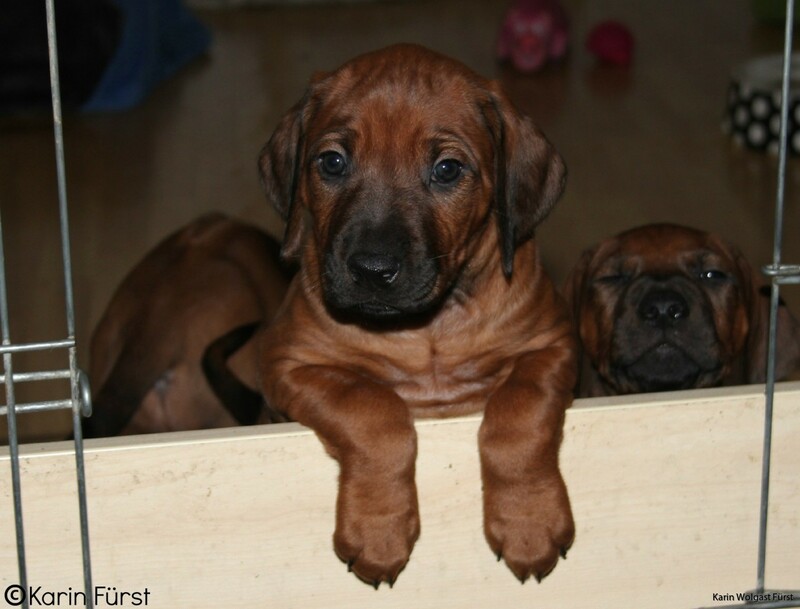 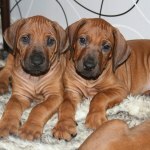 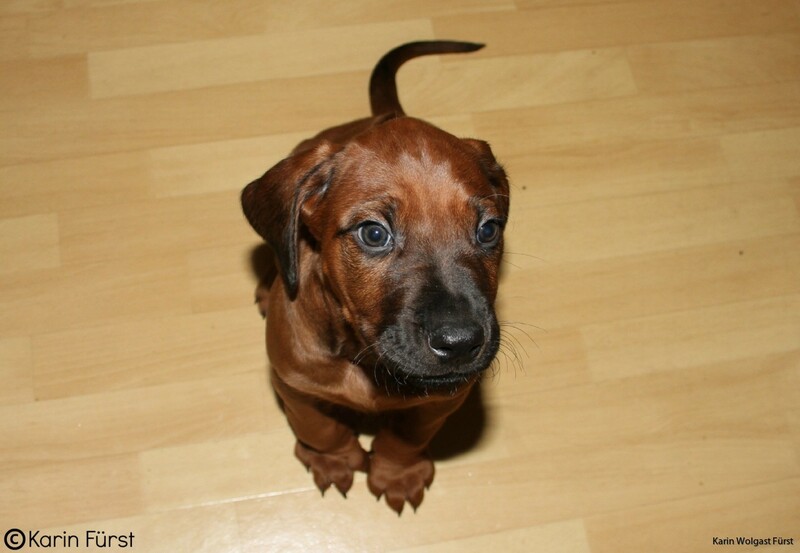 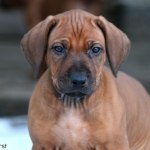 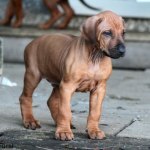 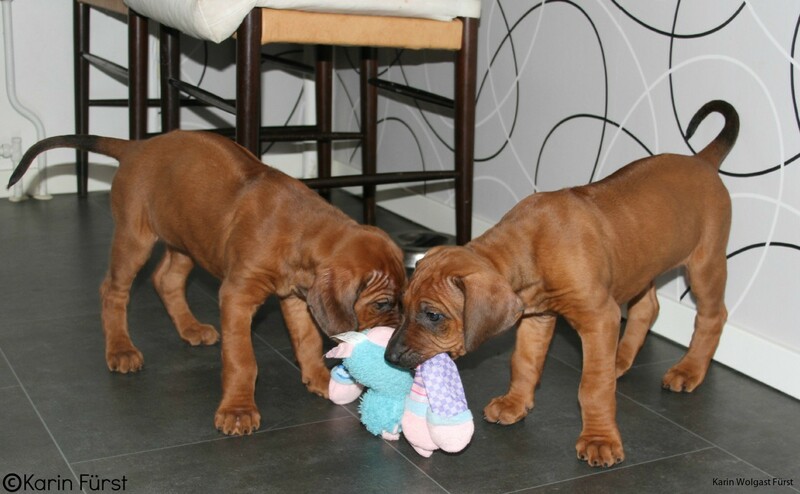 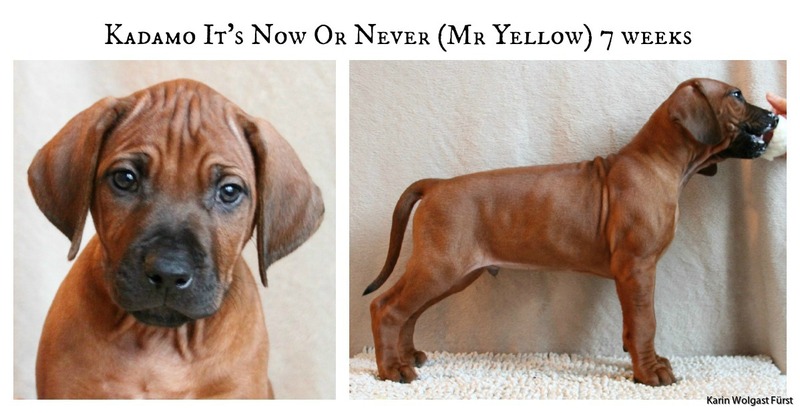 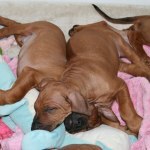 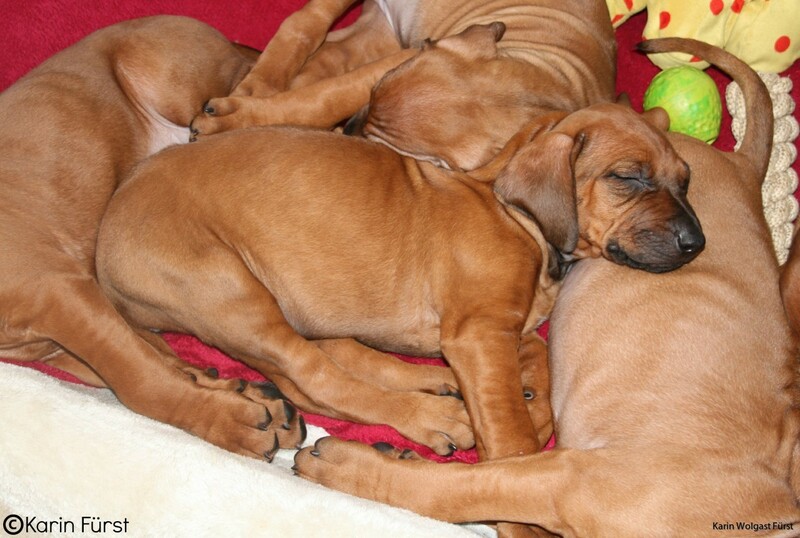 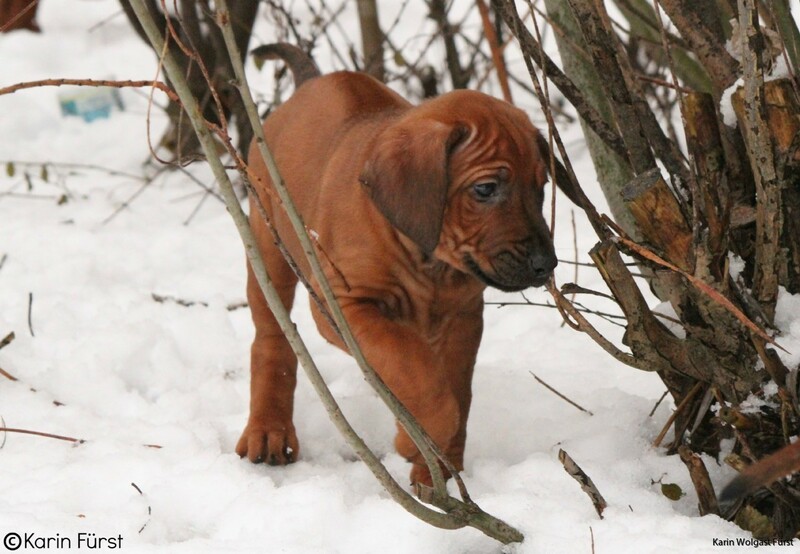 No typical ridgebacks here! 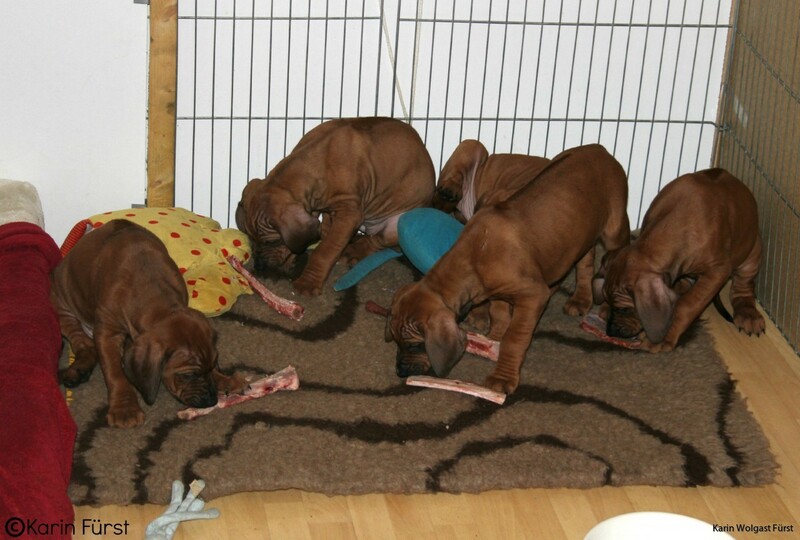 In the afternoon today they got some nice meatbones to chew on and that kept them busy for an hour or so. 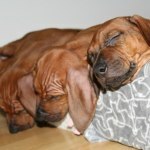 After that they fell asleep and slept heavily for a while! 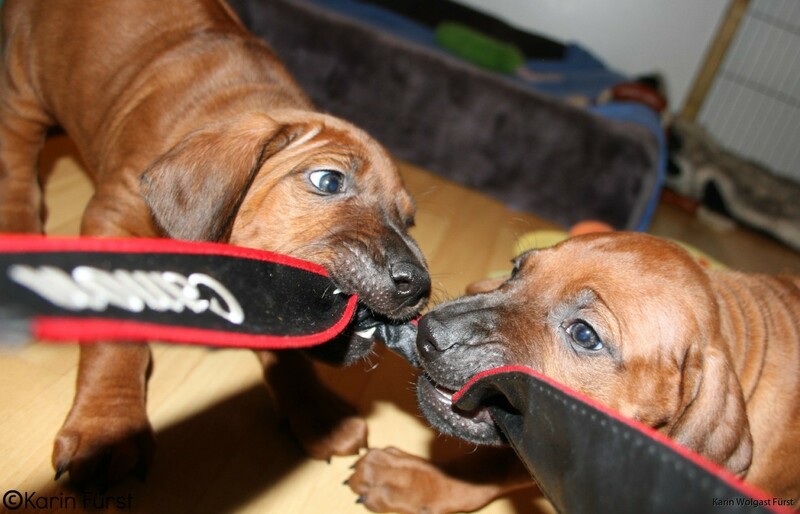 Perfect way to entertain young puppies! 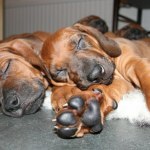 Now both puppies and me are tired so time to get ready for bed! 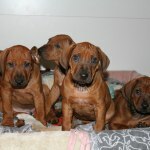 On Tuesday we are going to the veterianarian to have them all healthchecked and vaccinated before they start so move on Thursday. 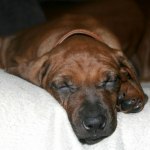 Below are some pictures and a video from this weekend, enjoy! 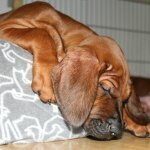 Just another day has gone by. 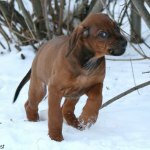 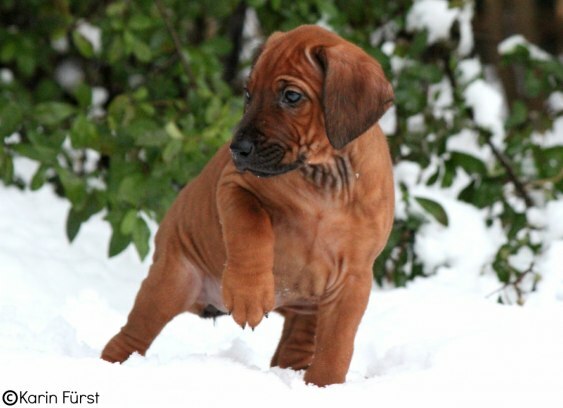 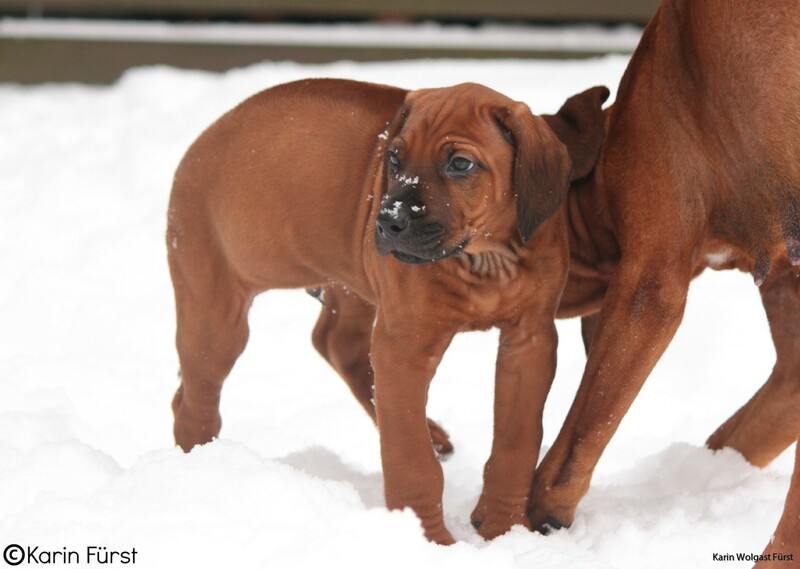 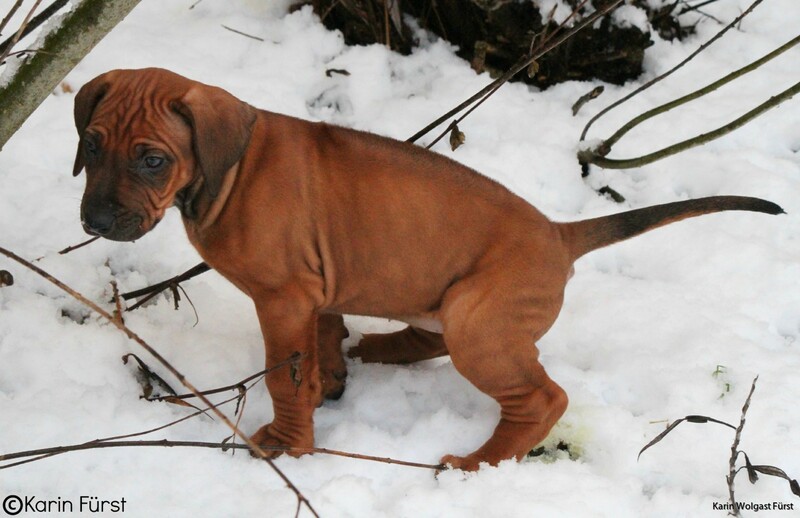 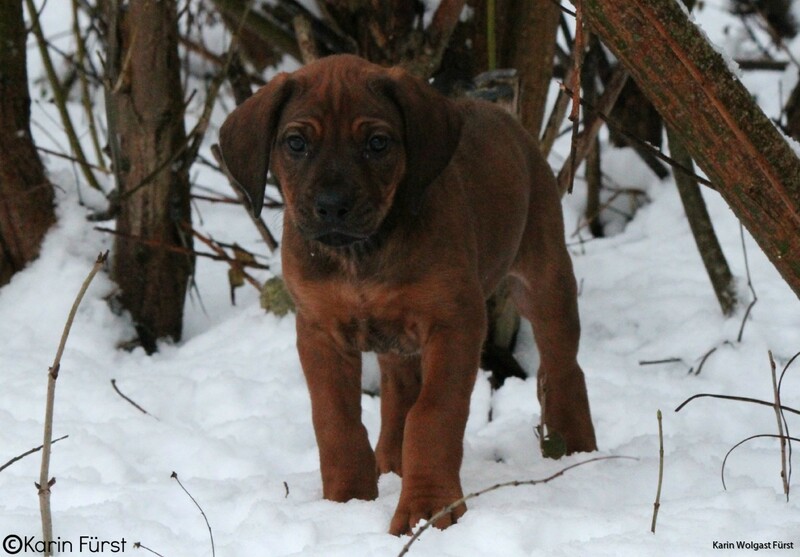 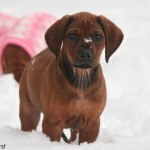 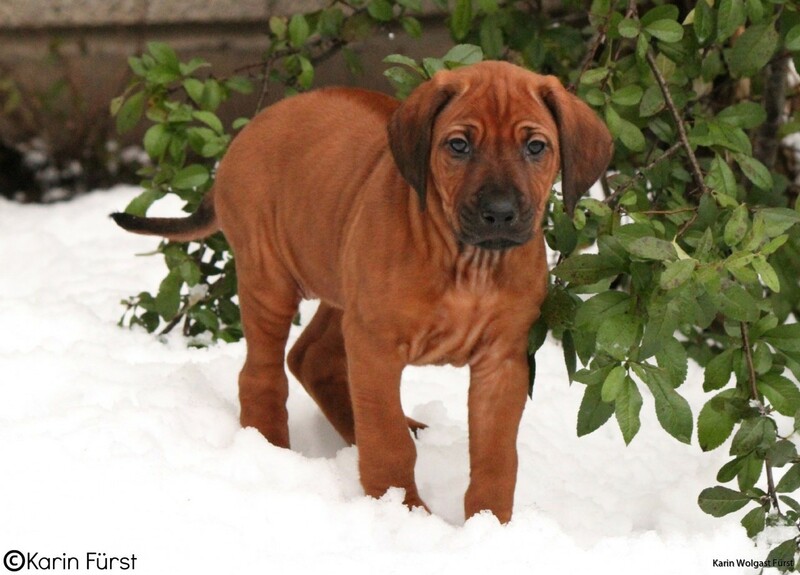 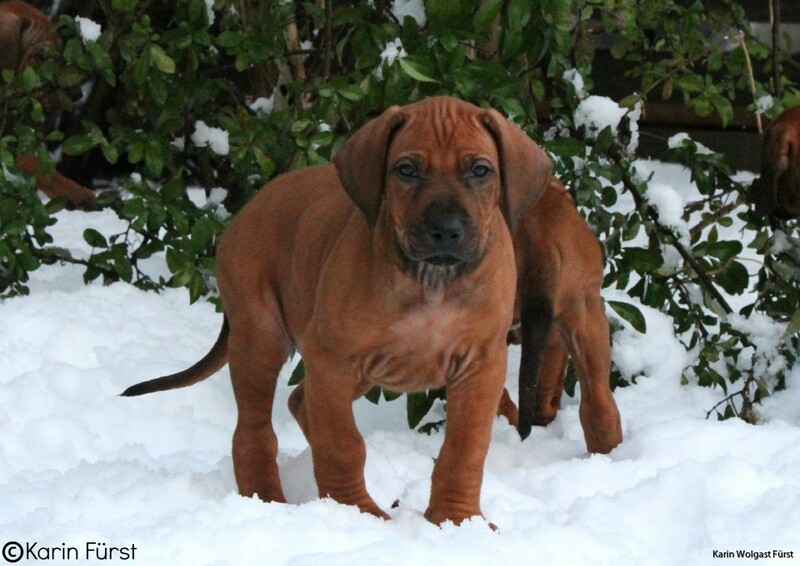 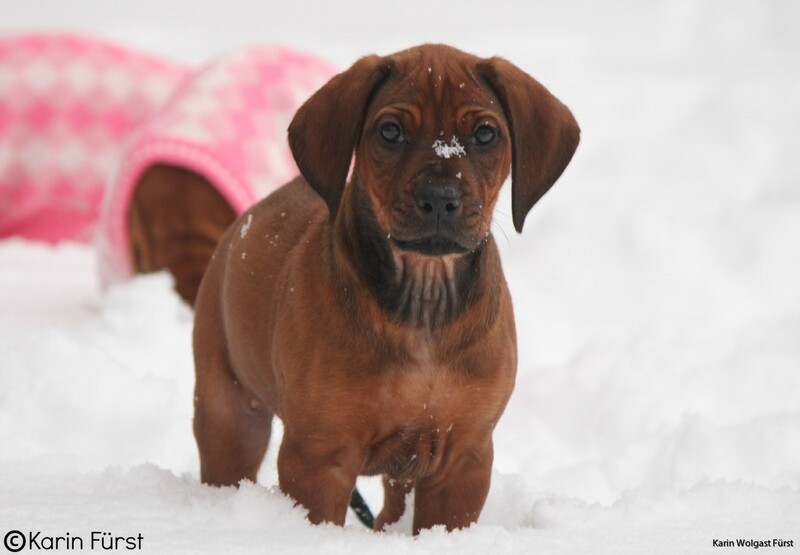 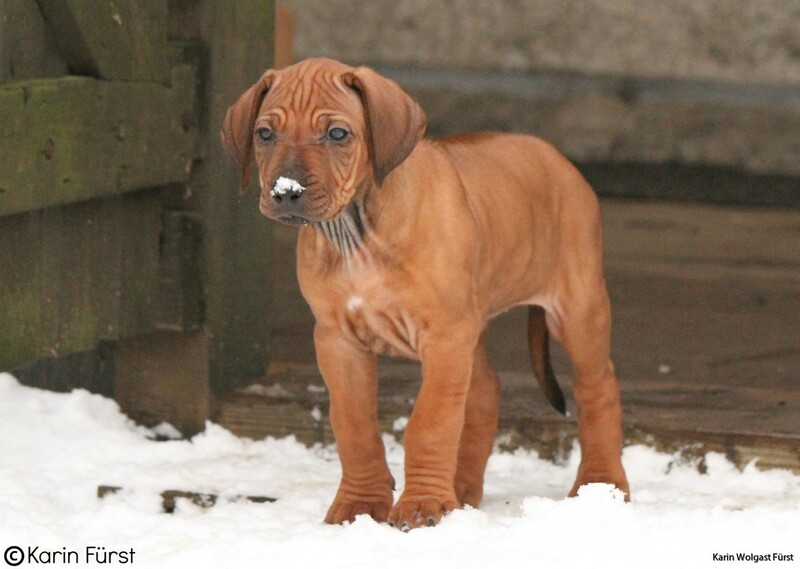 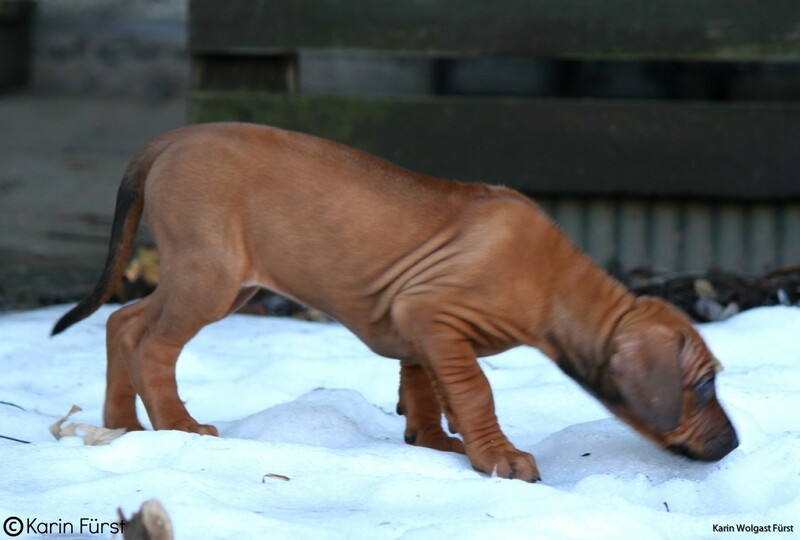 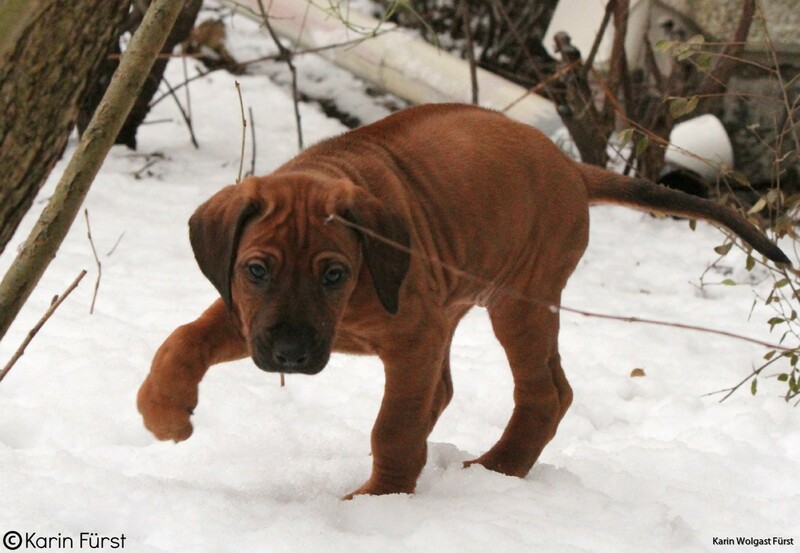 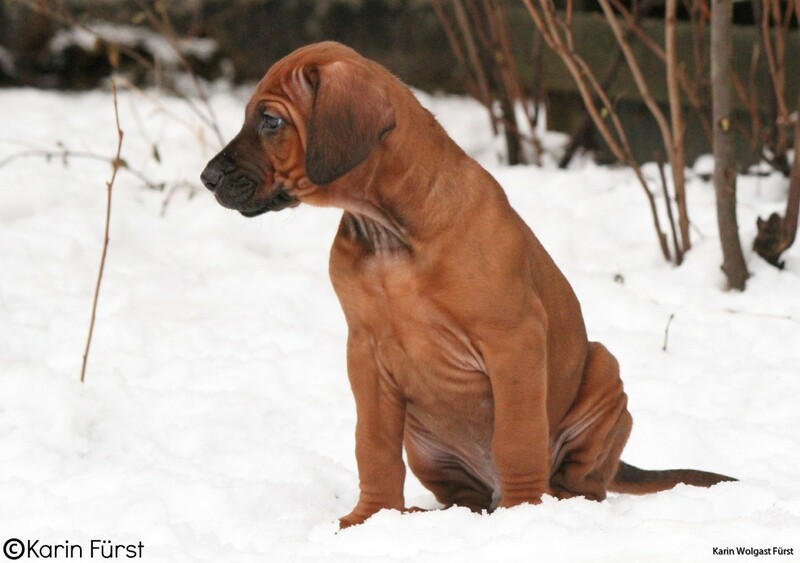 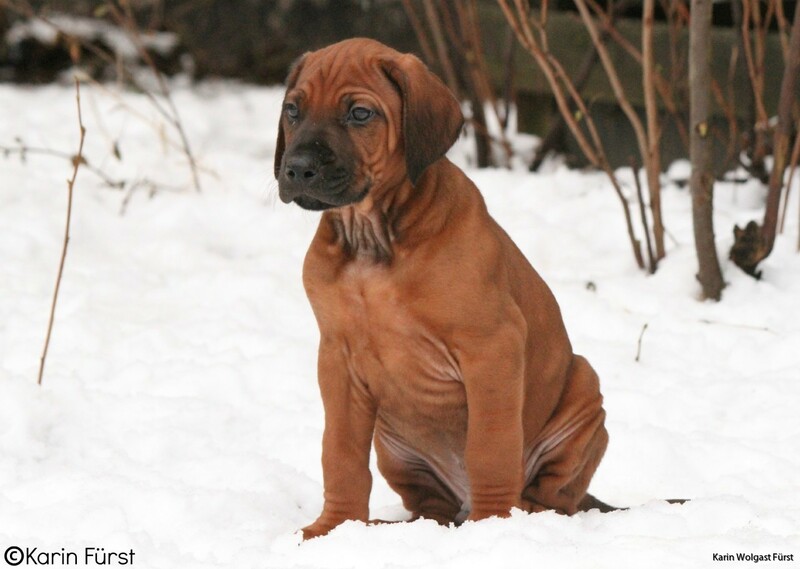 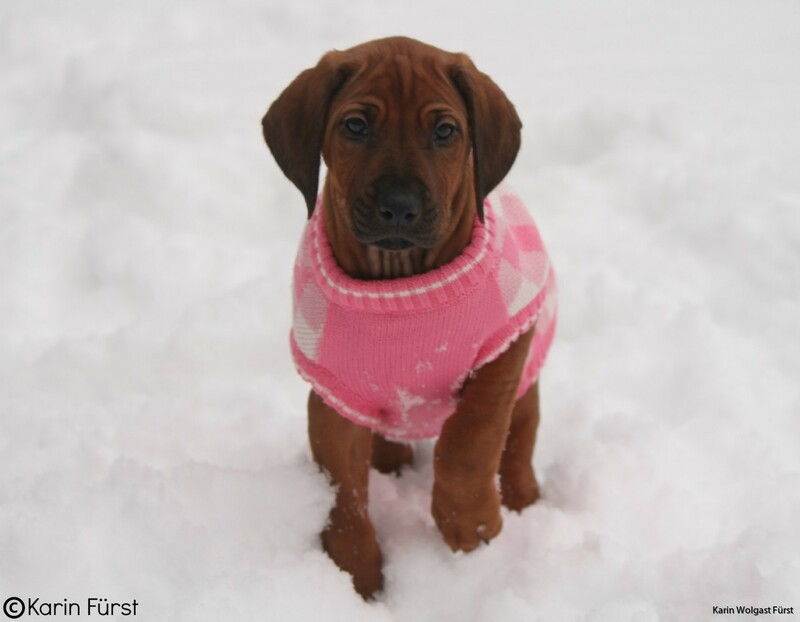 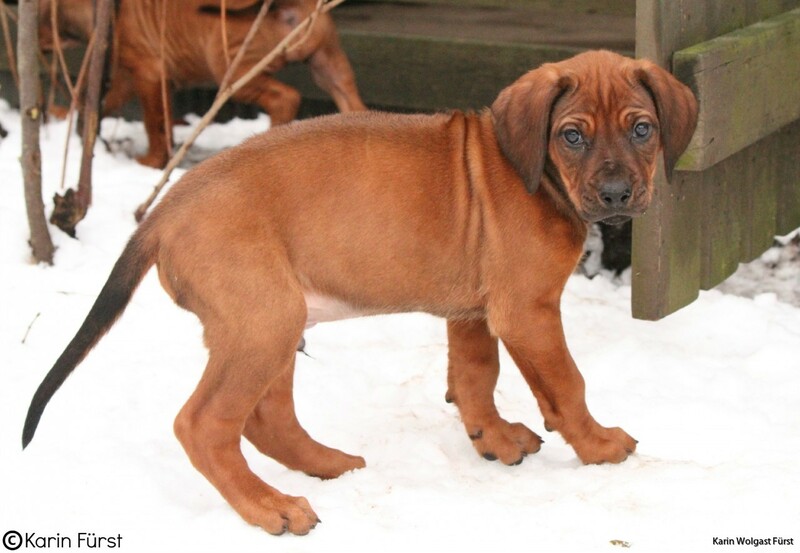 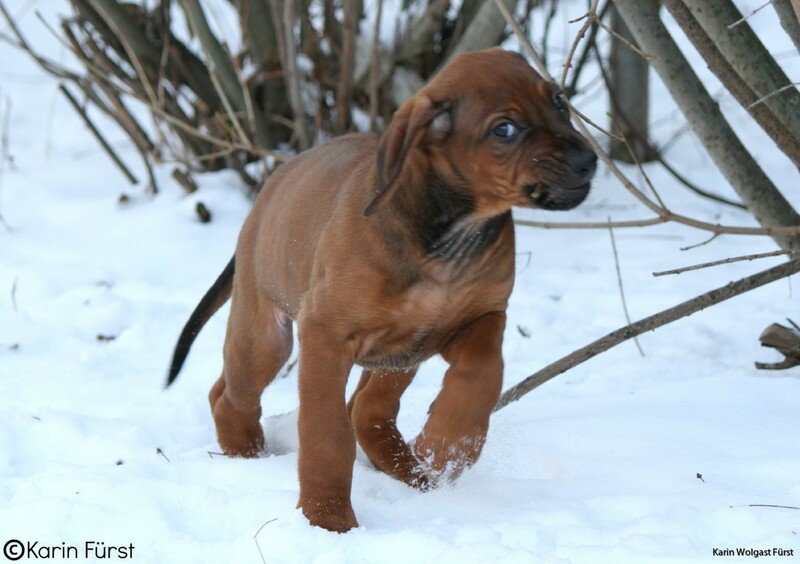 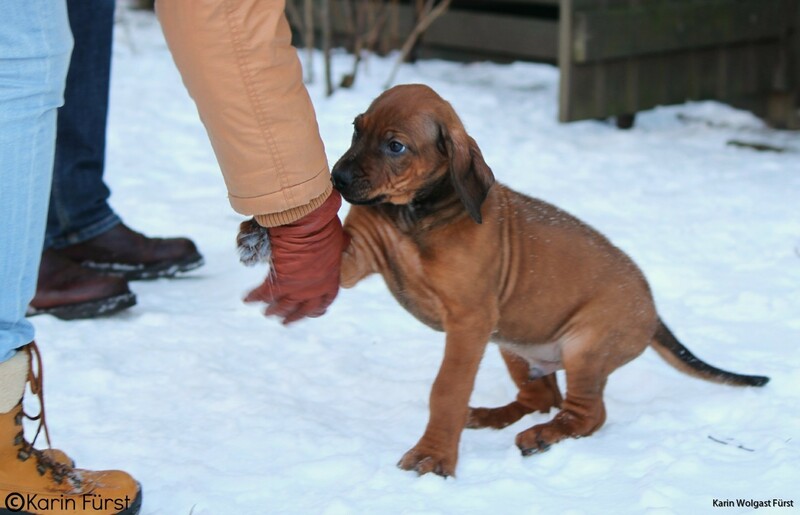 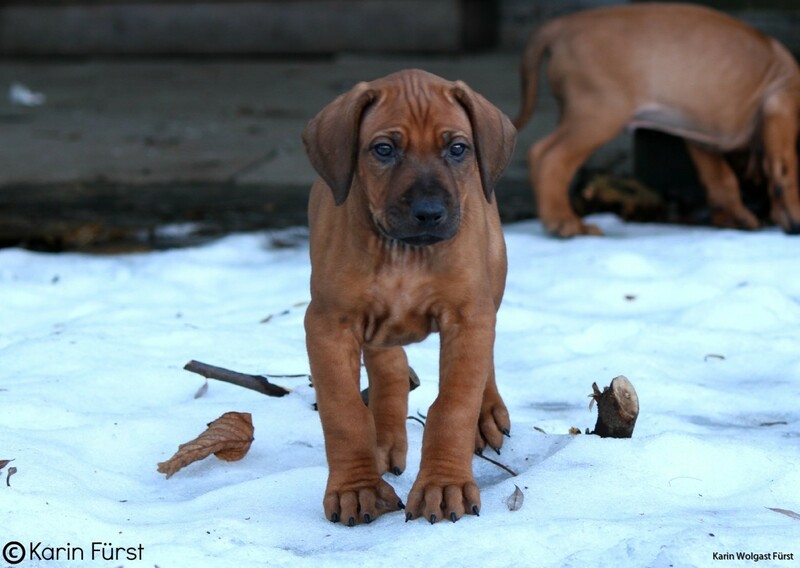 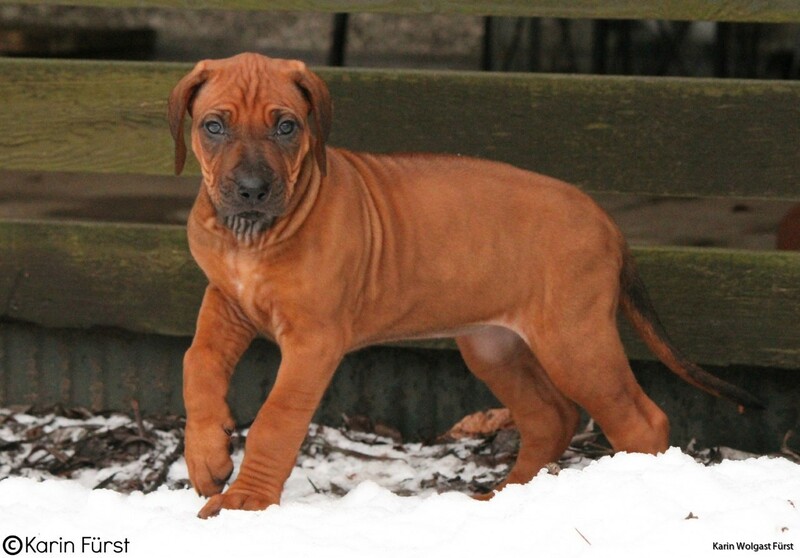 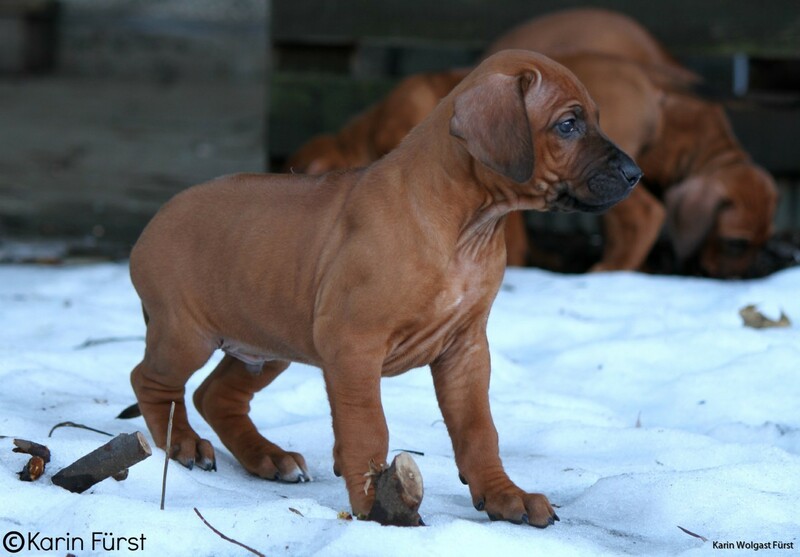 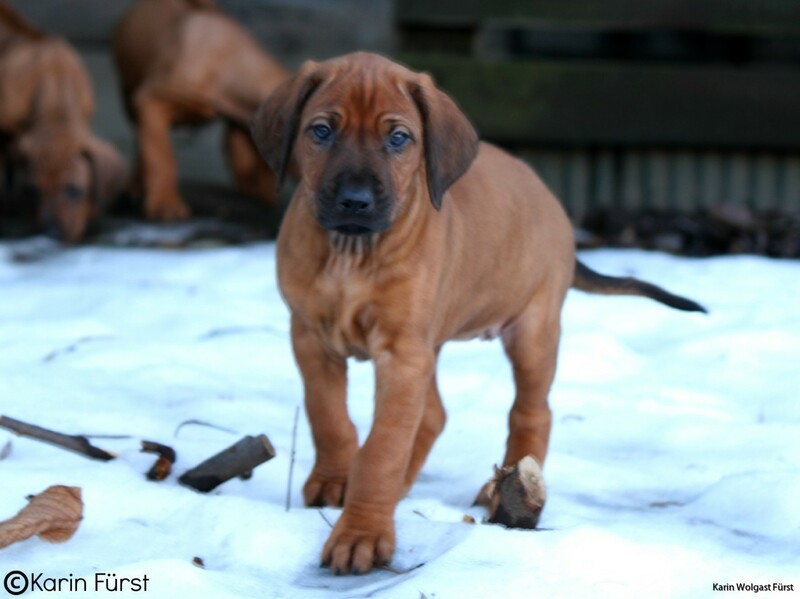 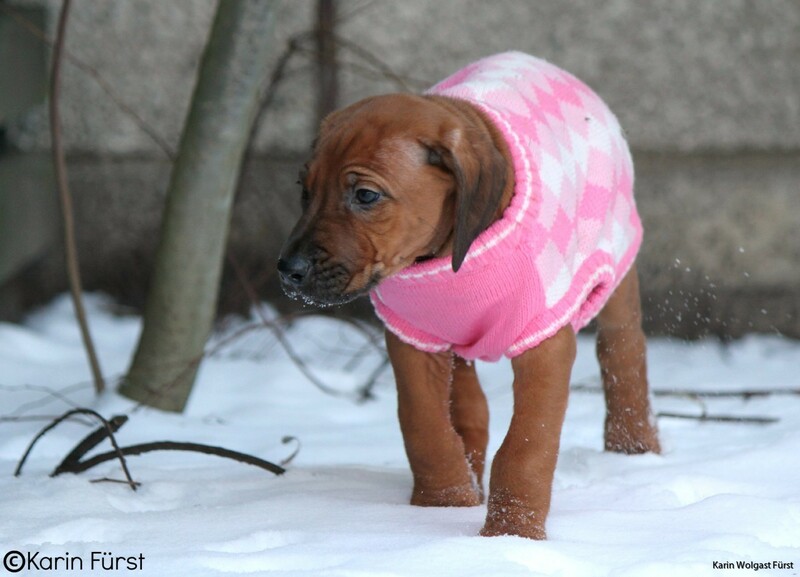 The puppies has enjoyed some playtime outside in the snow, seems like a big favorite. 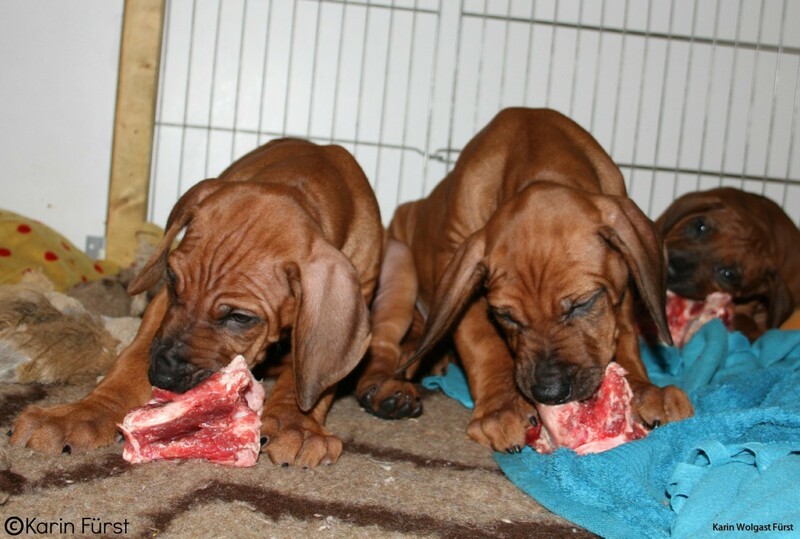 In the afternoon they got to taste roedeerhoofs for the very first time and they loved it. 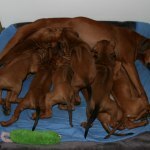 So hopefully we have some future Bloodtracking Champions in this litter! 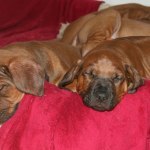 We have had a couple of visits and now resting for tomorrows photoshoot! 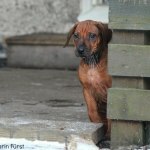 Some new pictures from today for you to enjoy until tomorrow! 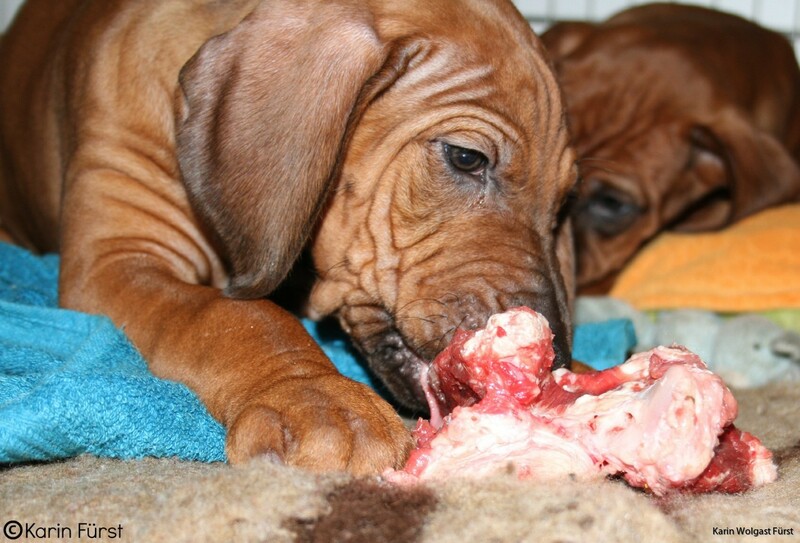 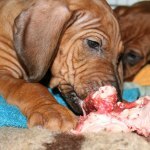 After this the puppies got some tasty bones and after that slept nicely for a while! 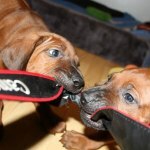 I took the opportunity to prepare the puppies backpacks that they are getting when they move. 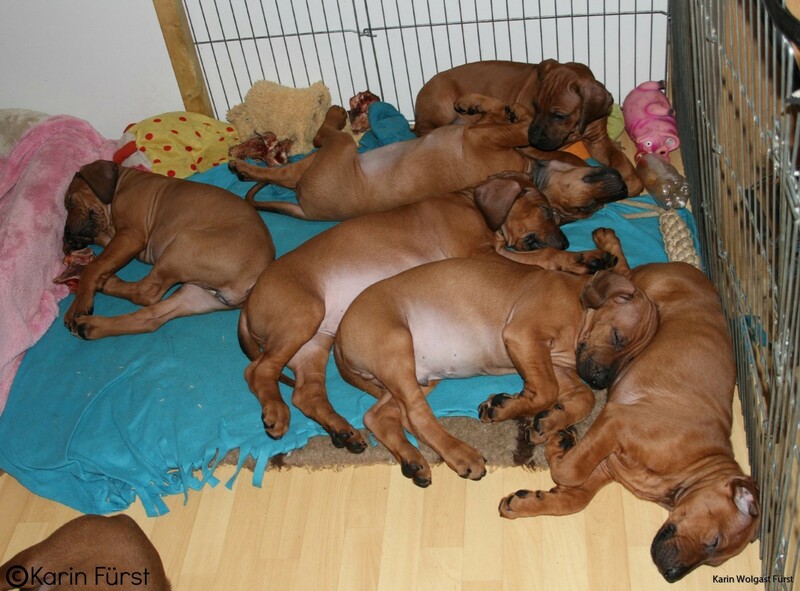 Also printed all their papers starting to make everything ready for next week. 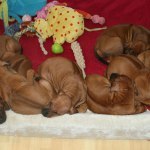 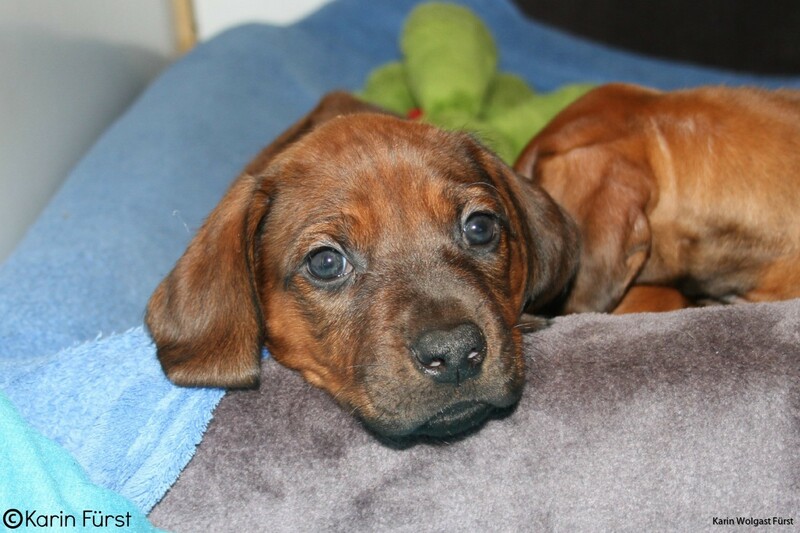 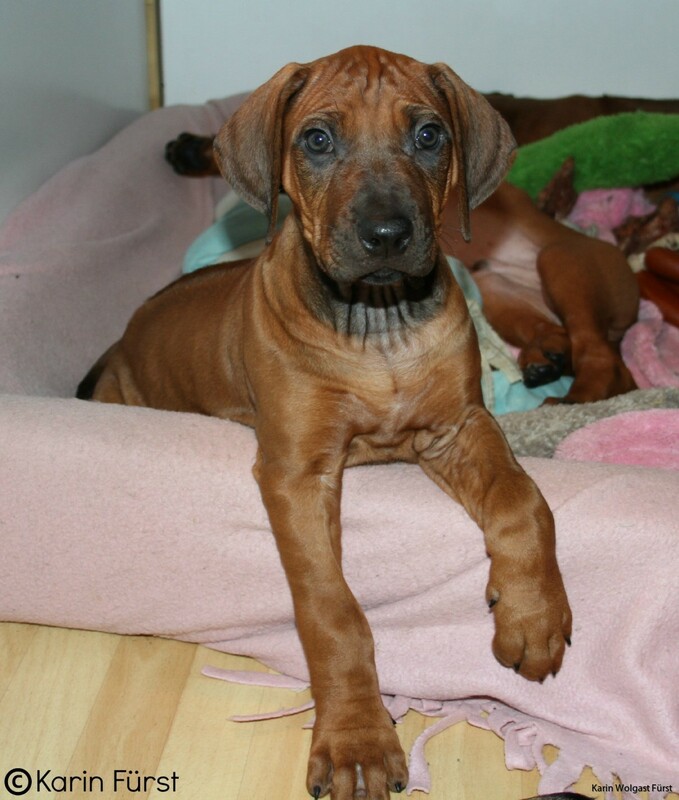 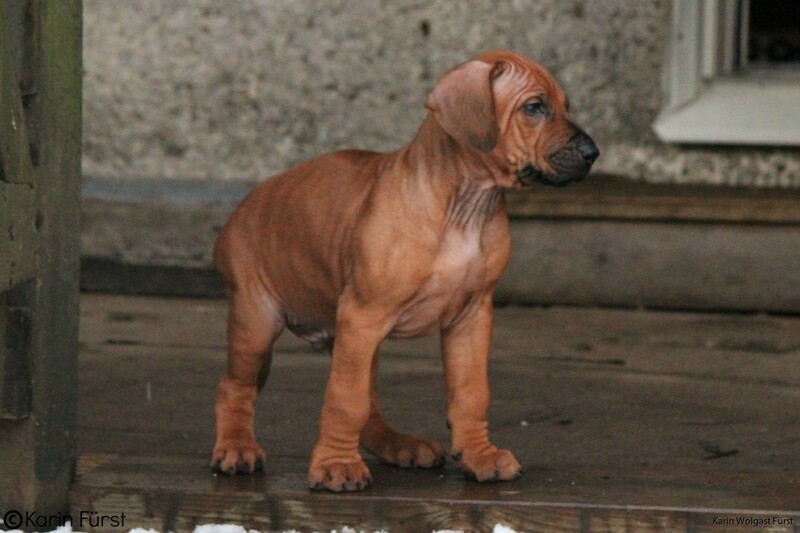 Can't believe it is just a little over a week left until most of the puppies move to their new homes. 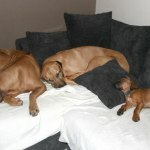 When they were all sleeping me and the big dogs sneaked out for a refreshing walk. 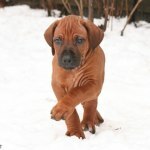 It is so nice to get out at least once a day for a bit of a longer walk, to just not sit still inside all the time! 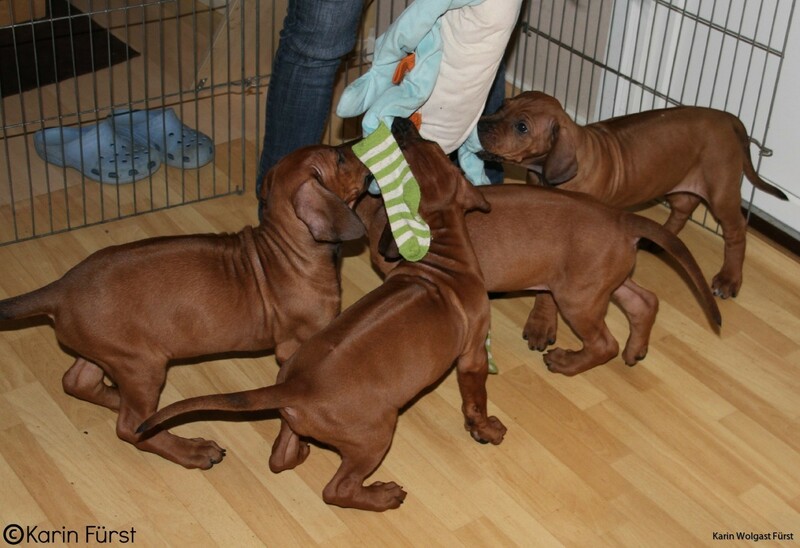 In the afternoon/evening the puppies got to keep me company in the kitchen while I was doing the dishes. 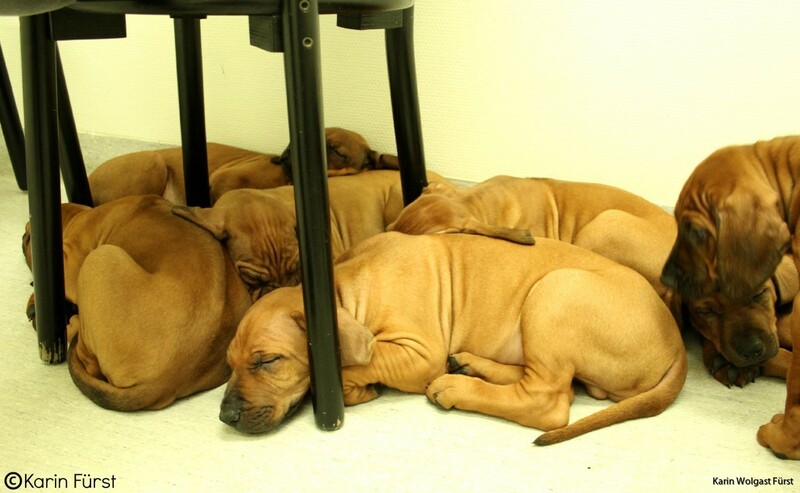 But before that they got to run around in the hallway and bathroom aswell. 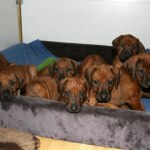 Anything to make them happy and saticfied! 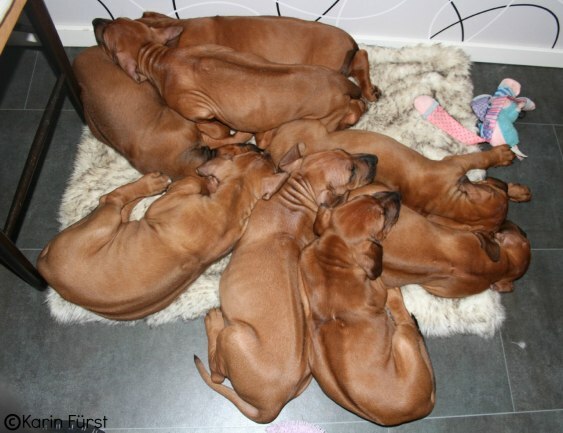 They are sooo adorable, it sounds like I have a group of horses running trough my apartment! 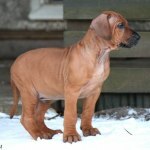 The absolutely love it! 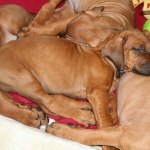 But their energy only last for about 30 minutes and then they start to lay down and sooner than you know they are all asleep! 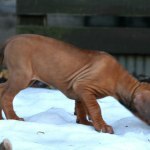 I didn't get a good video of the puppies in the snow, but at least a video of them playing inside! 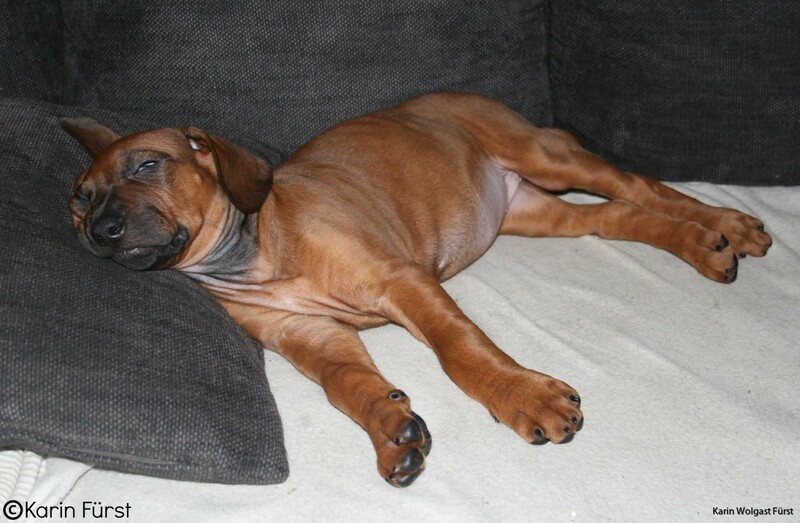 Another weekend with the puppies has passed. 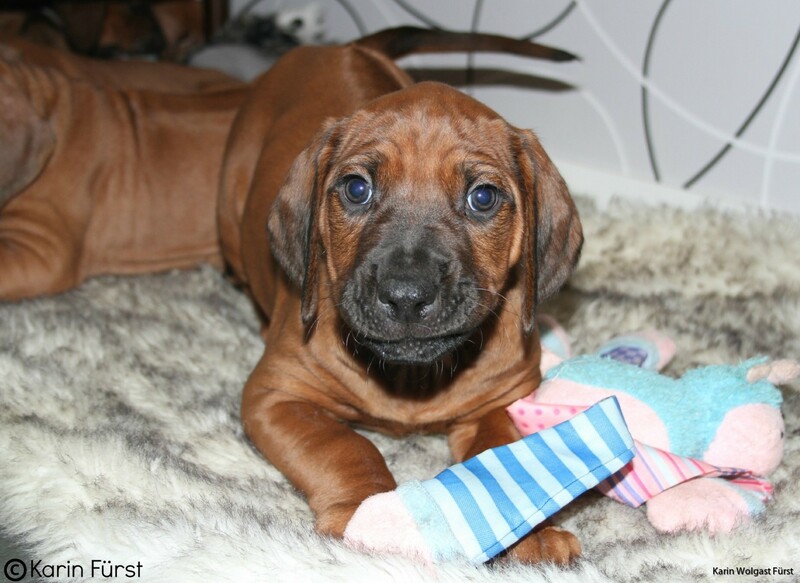 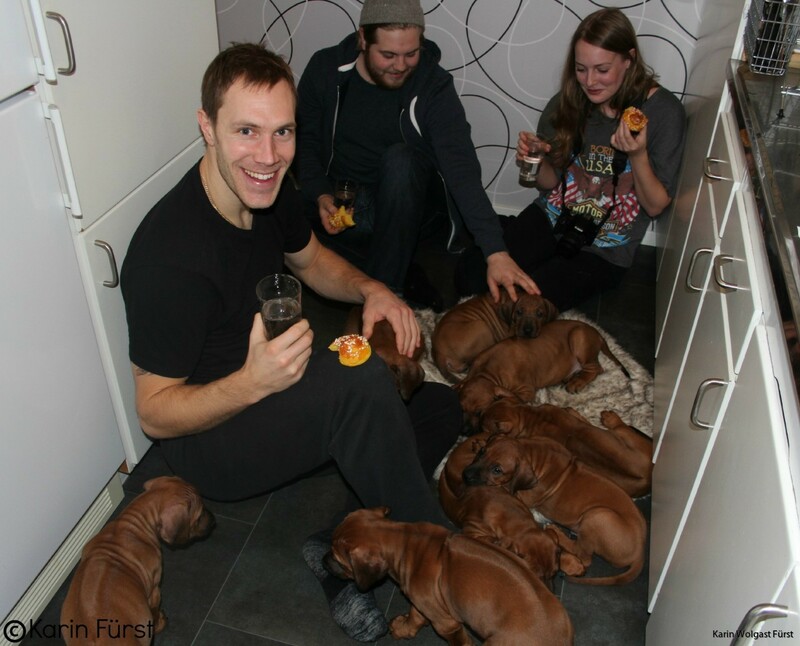 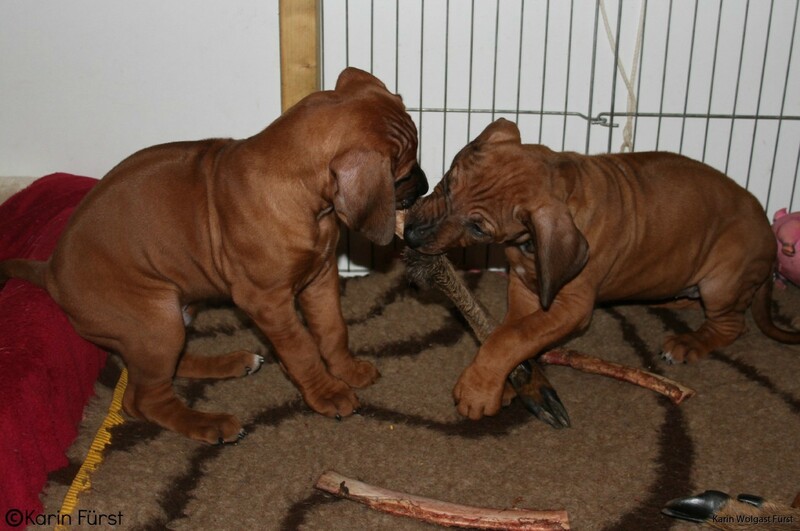 This weekend Erik and Svea has been here so the puppies has had someone else to play with aswell. 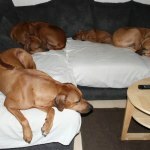 We have had some visitors but also lots of quiet time. 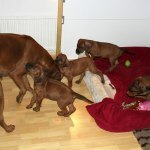 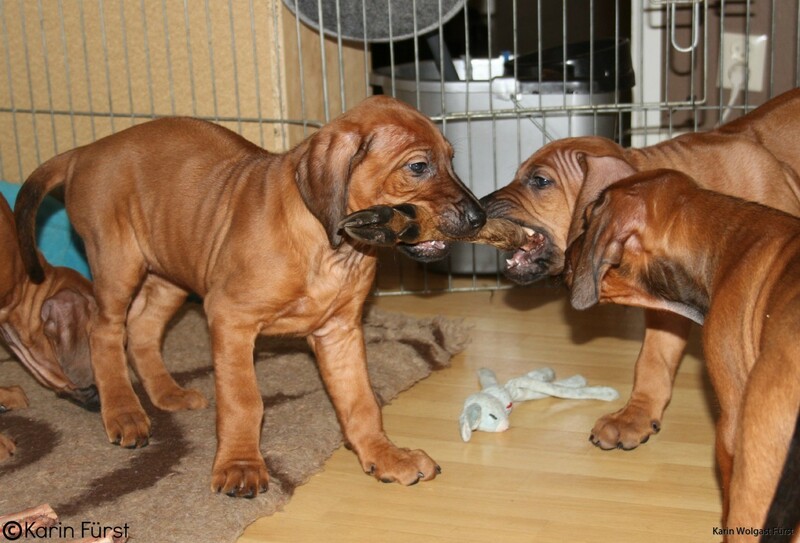 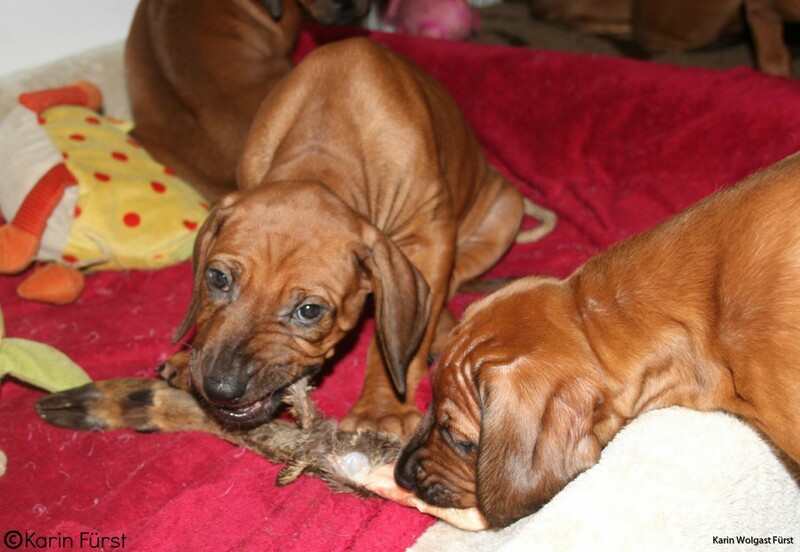 The puppies are growing fast and when they are awake playing it is very intense. 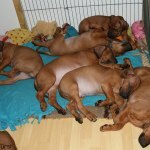 But they still sleep a lot so it is not so bad! 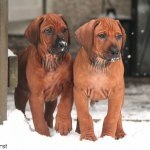 It has been a little bit colder the last couple of days so I haven't taken the puppies out more than to my own area. 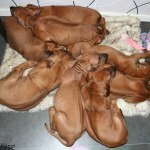 They are doing really well with doing their business there after they eat and sleep. 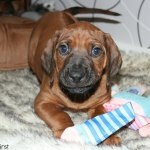 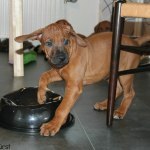 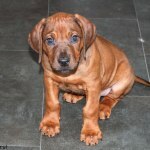 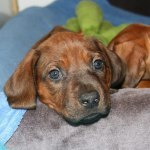 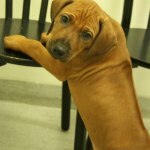 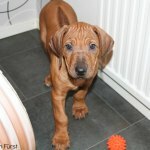 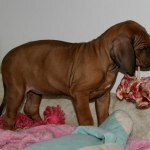 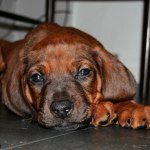 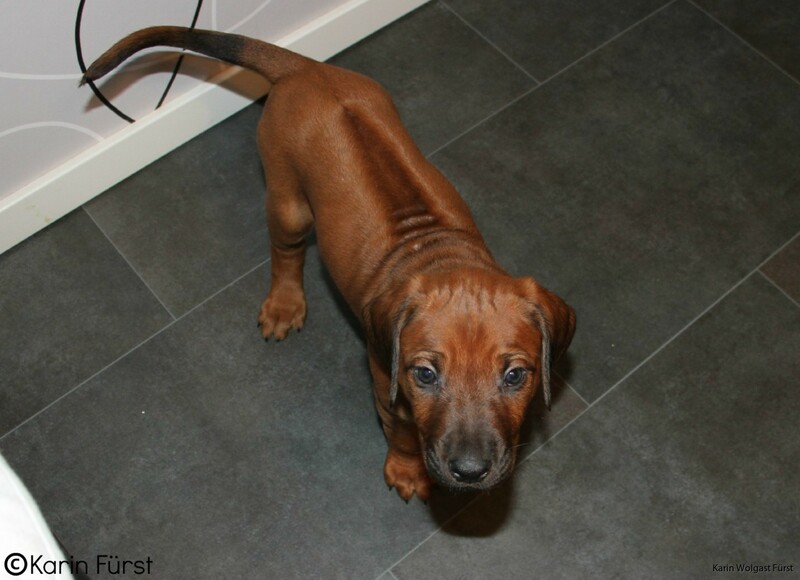 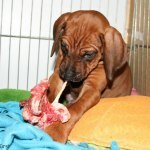 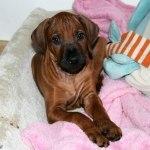 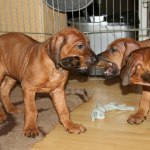 A video of the puppies playing in the kitchen below aswell as photos from the last three days! 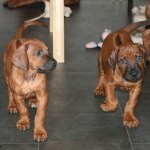 I understand that you puppybyers out there are waiting for new photos so here they are. 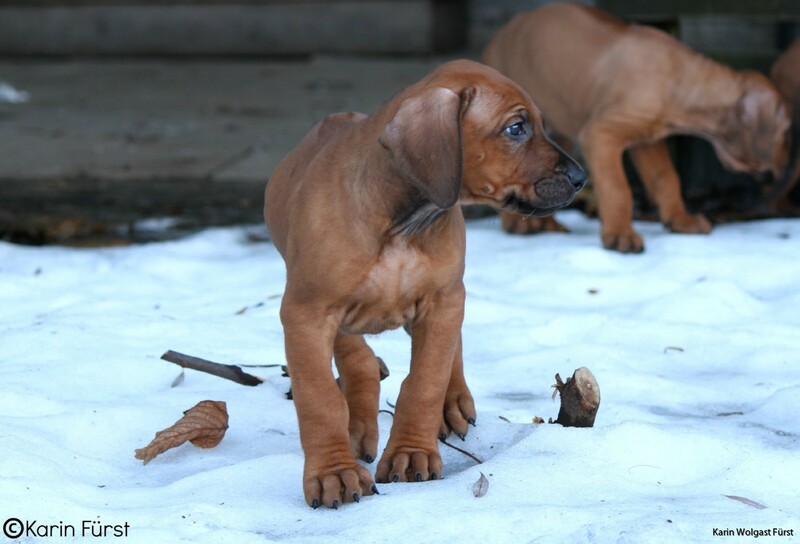 The last few days the puppies has gotten to go outside to play. 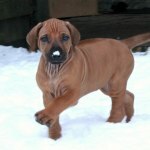 We still have some snow left, or more ice than snow actually. 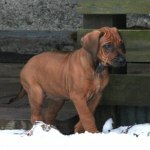 The puppies enjoyed to go outside of my own little area to see a little bit more of the world. 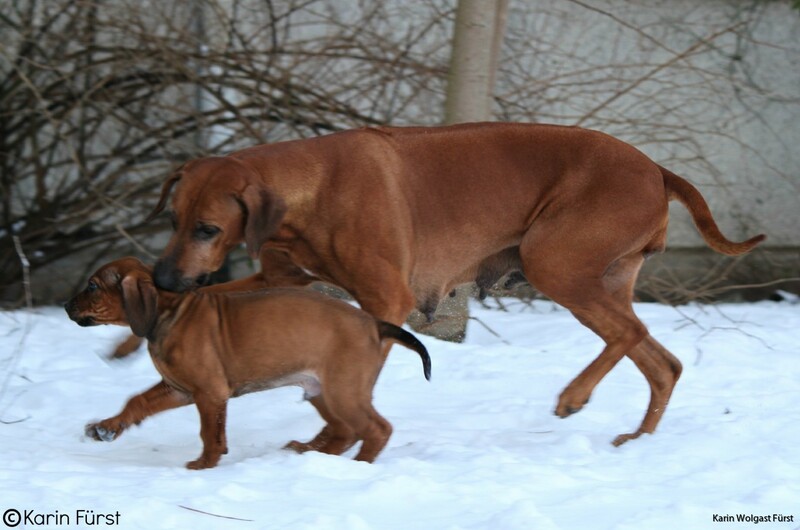 Moa was so excited when they got to follow her outside, because with a bigger area she has more room and she directly starts to play with them. 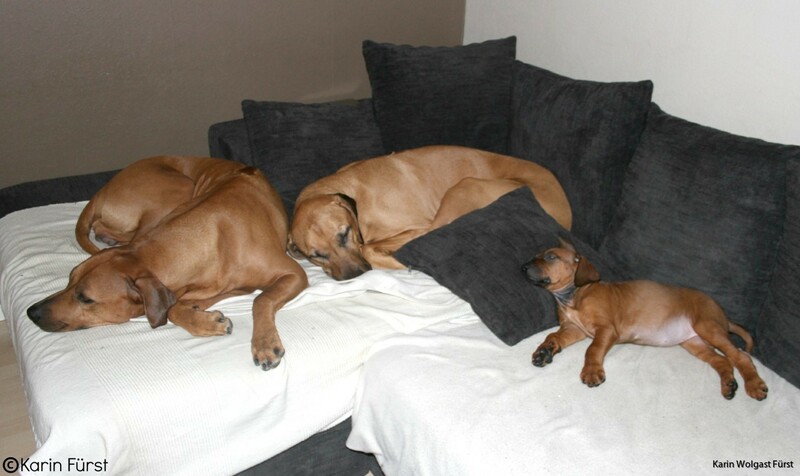 So sweet to see, she really wants to interract with them and outdoors it is easier. 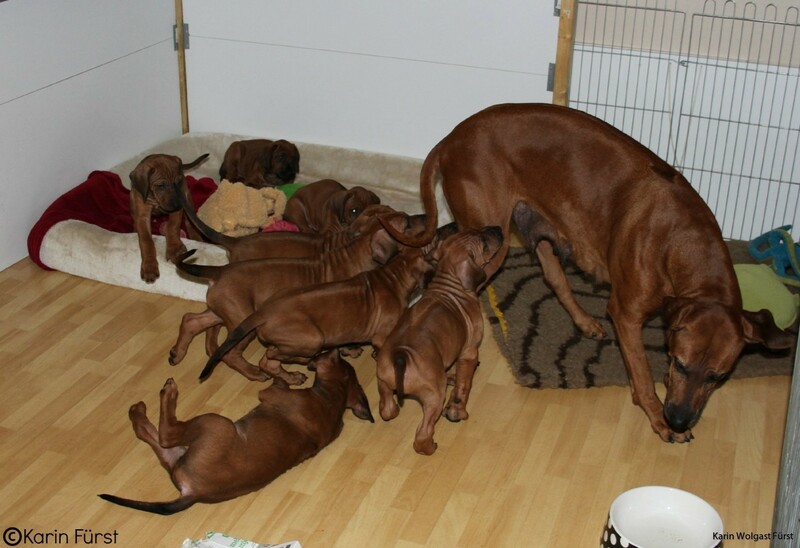 On Thurday she nursed them for the last time, since then no more milk. 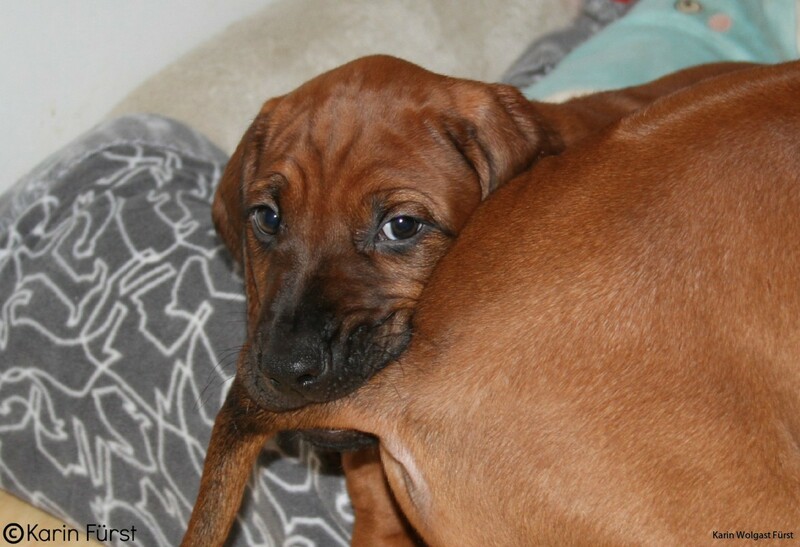 This is normal for her, to quit nursing at 6 weeks of age. 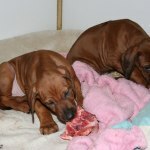 Now they are eating solid food four times a day. 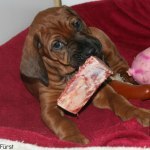 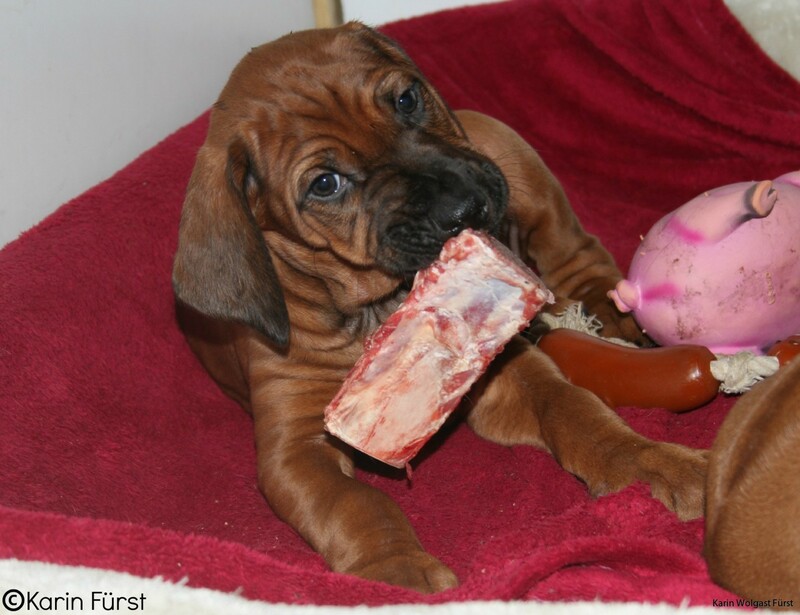 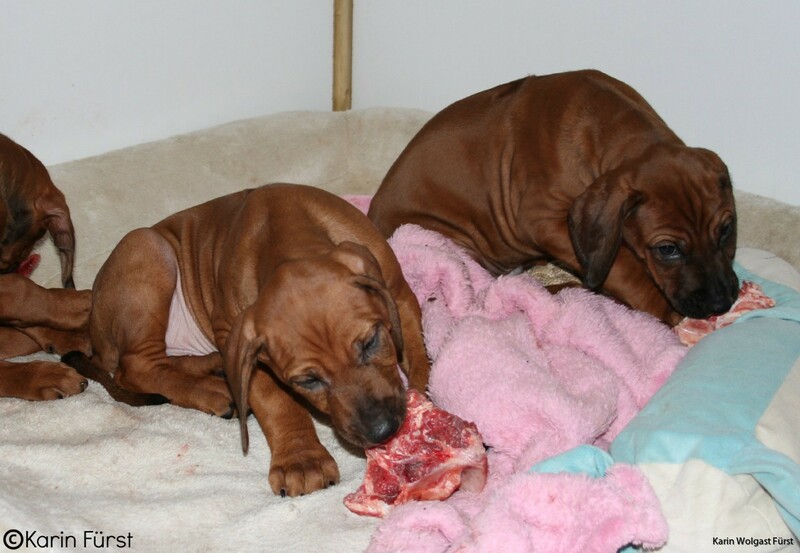 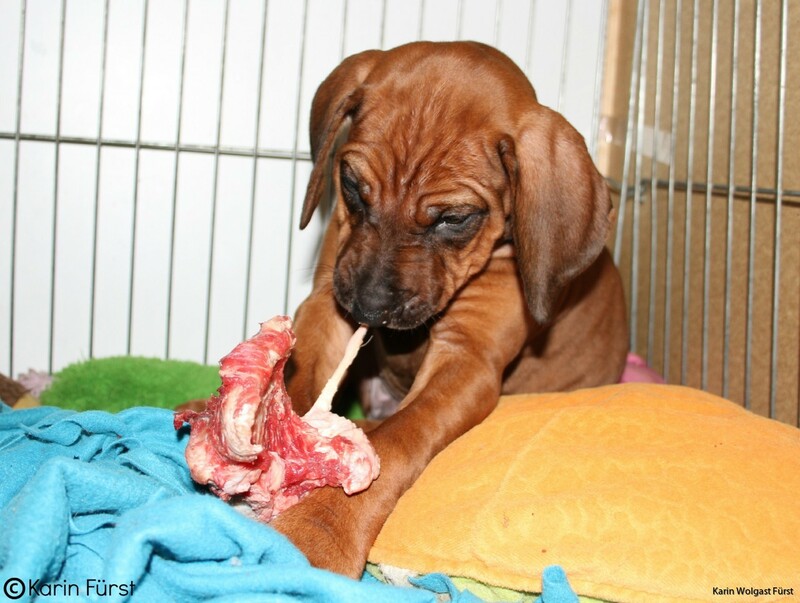 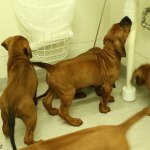 The puppies have also been in the kitchen for a while each day to get some of their energy out of the system. 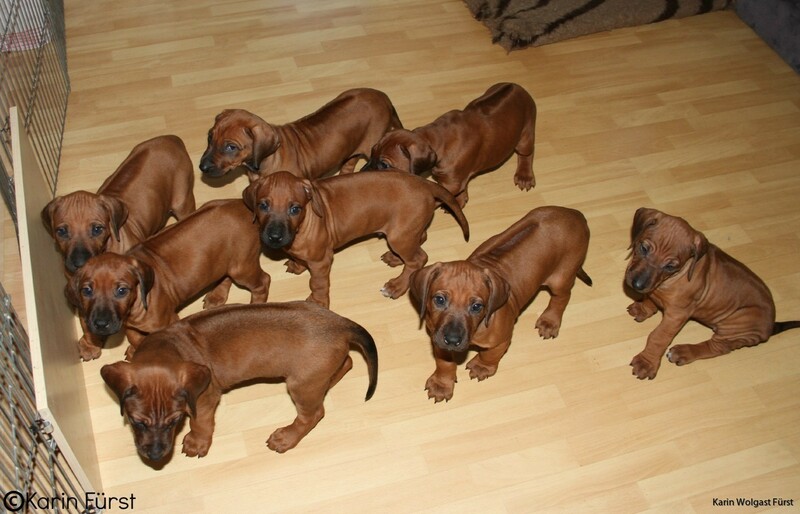 I have to say that I think they are all doing wonderful at peeing and pooing outside. 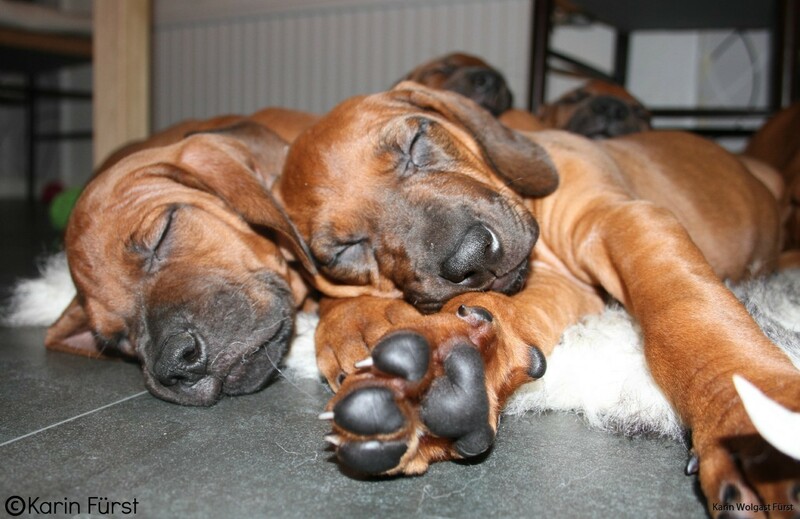 In the mornings I get up when they are still asleep and hurry in and let them outside. 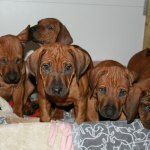 Then all of them pee and some poo and I clean their puppypen. 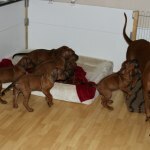 Everytime they all wake up after sleeping and also after every feeding I call them and they follow me outside and do their business. 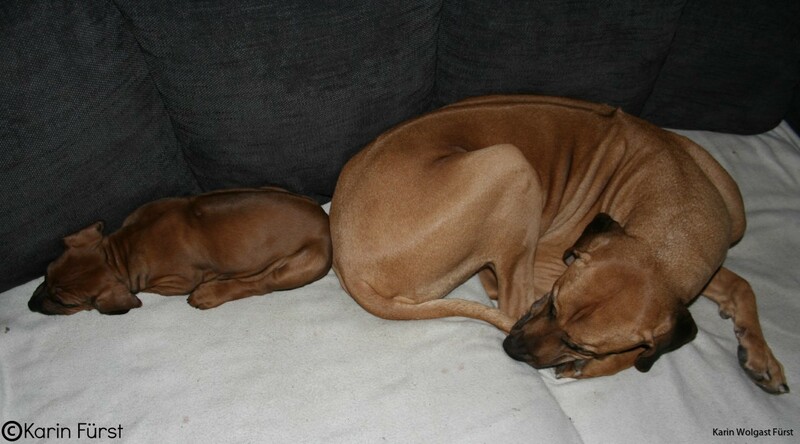 Of course they still do in inside now and then too, but still I am very happy with them. 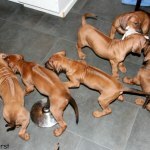 Hopefully it will not be to difficult to get them housetrained once they move. 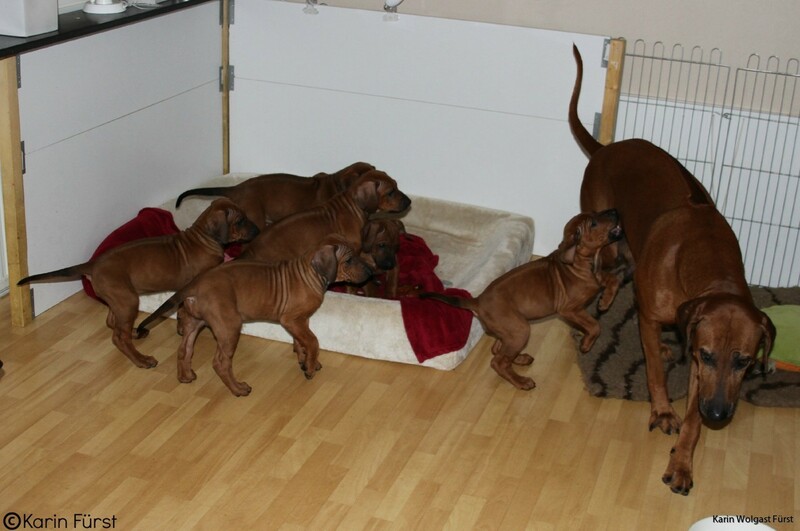 On Thursday when they were 6 weeks old I weighed them all and they are now between 5,1-6,3 kg. 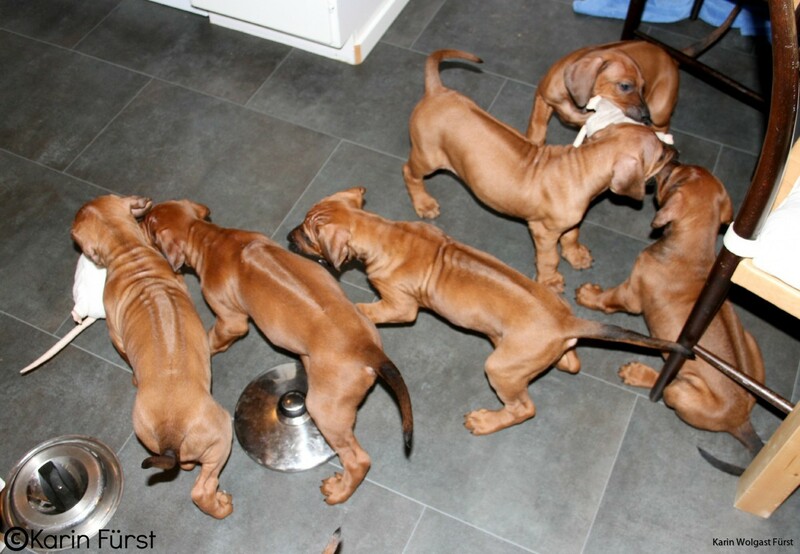 Most of them around 5,5 kg. 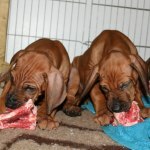 They were dewormed for the last time here at home before they moved aswell and it wasn't any problems, even though they don't think it tastes good at all. 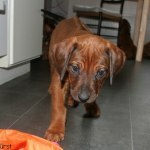 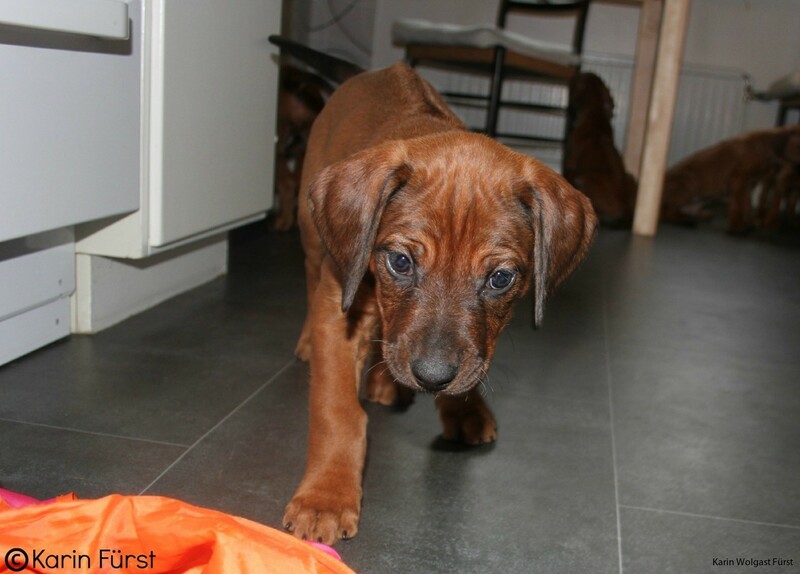 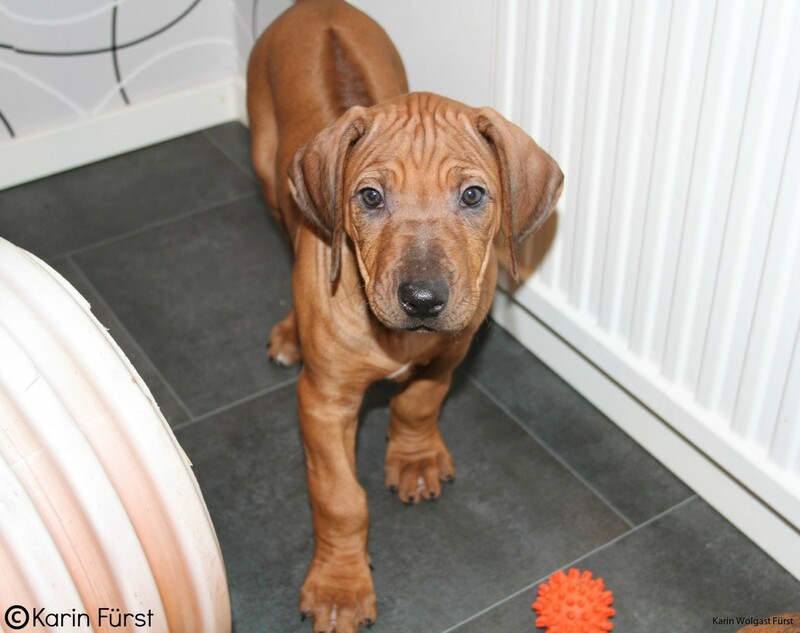 This weekend Erik is here with Svea, the 4 months old German Huntingterrier. 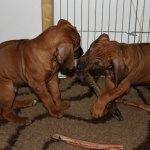 So now for a couple of days they have another dog to play with! 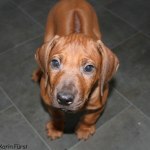 Pictures and videos from the passed couple of days below. 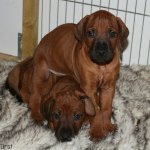 The puppies are 6 weeks old today and as usuall it was time for another photoshoot. 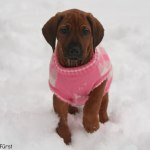 This week I didn't have Johanna here to help me with headshots and I quickly gave up trying... 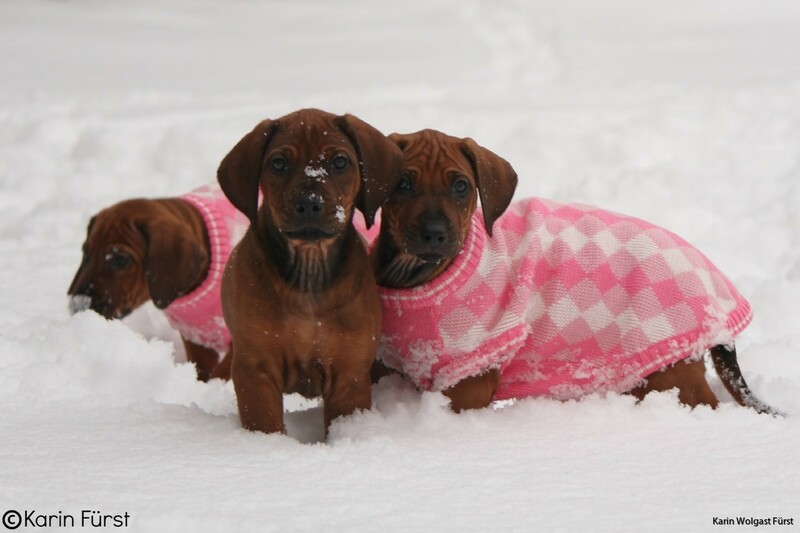 So only stacked photos of them this week. 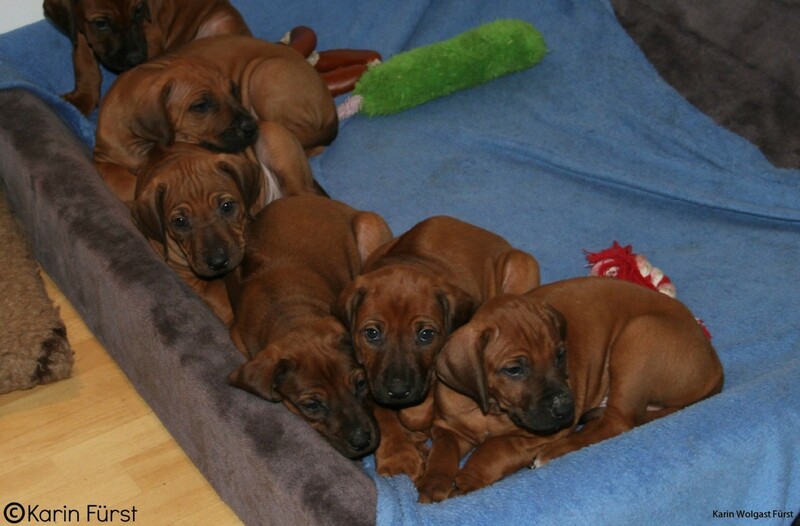 But you get to see their darling faces in all the mixed photos instead so I hope you can survive! 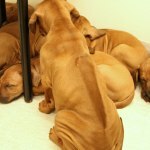 This afternoon they are all getting weighed again and dewormed for the last time before they move to their new homes. 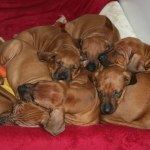 They are such a sweet bunch, and I am still wondering when those little devil personalities will kick in... 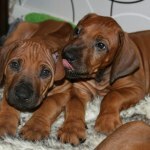 But still they are so sweet. 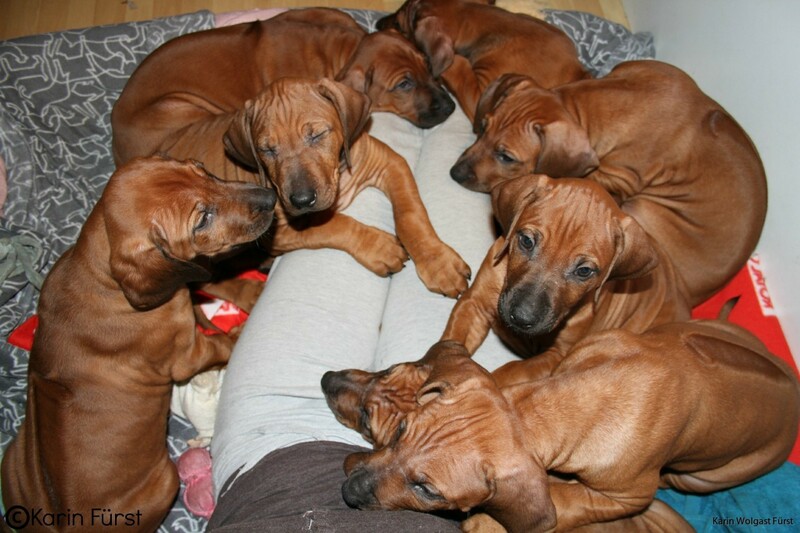 Of course a bit of barking and chewing but they listen most of the time when I tell them to stop, and they all just crawl up in my lap for cuddles and kisses. 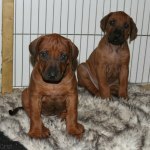 Below are todays stacked photos and the puppies official names.